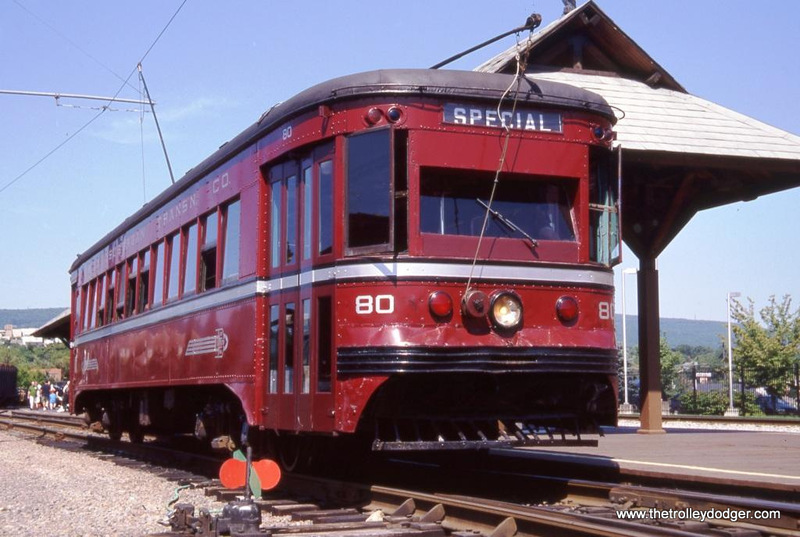 J G Brill Master Unit Car #80 at Scranton, PA. 8-5-09. 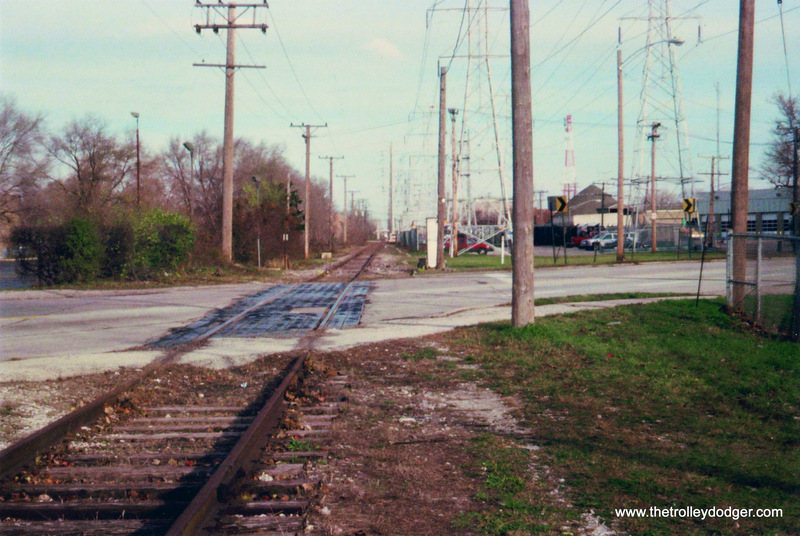 Today’s post features more classic traction photographs by guest contributor Kenneth Gear. 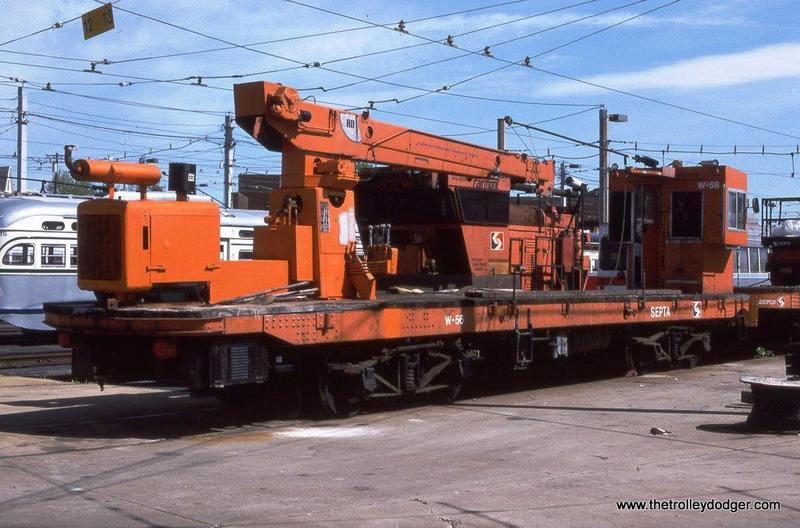 This is the third installment in a virtual career retrospective, covering 40 years of railfanning. Ken has long been a friend of this blog. He has contributed greatly to our understanding of the Railroad Record Club of Hawkins, Wisconisn, and it is thanks largely to him that we have been able to share all 40 RRC LPs with you, digitally remastered on CDs and sounding better than ever. We thank Ken for that, and for sharing these great images with our readers. Click on these links to see Part 1 and Part 2 in this series. Photo 1. 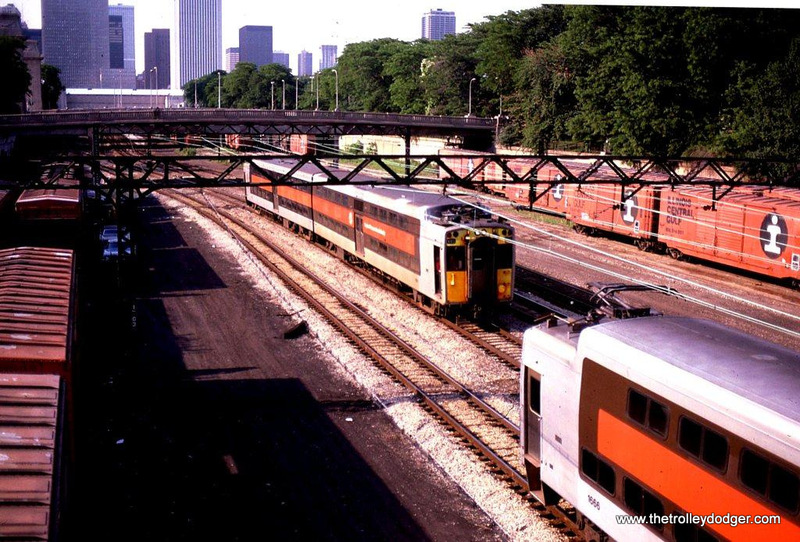 RTA/ ICG Highliner MU trains pass near the Randolph Street Terminal, Chicago, IL. 6-23-82. 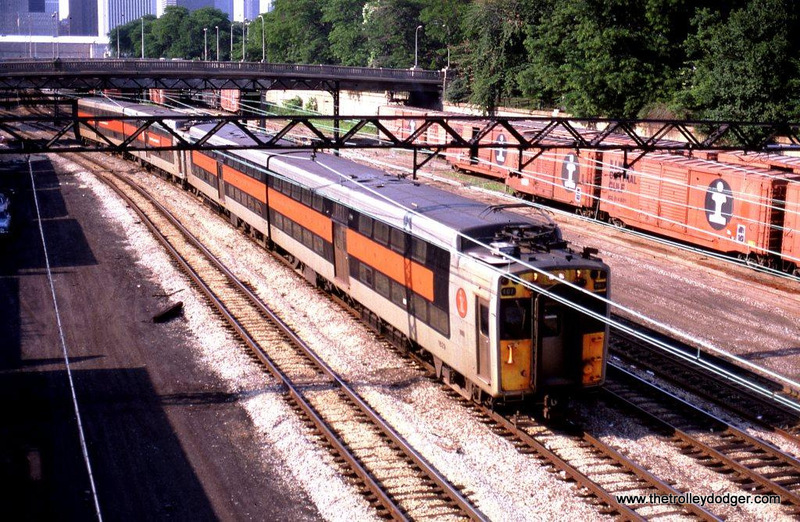 RTA/ ICG Highliner #407 near the Randolph Street Terminal, Chicago, IL. 6-23-82. 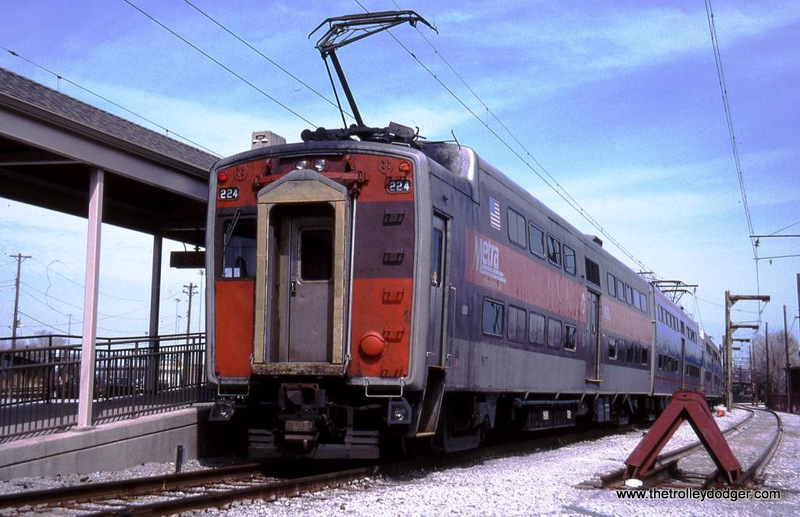 Metra Electric Highliner #224 at the Vermont Avenue Station, Blue Island IL 3-25-03. 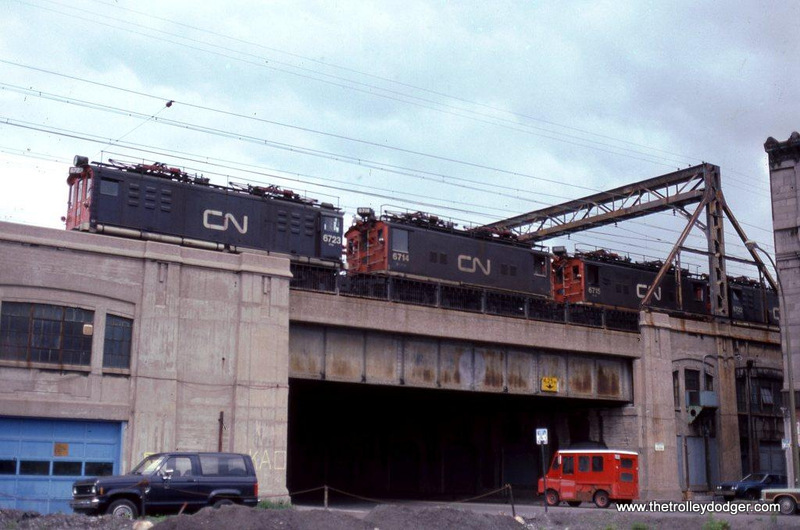 CN Box cabs #6714, # 6715, & #6722 at Montreal, Que. 6-14-85. 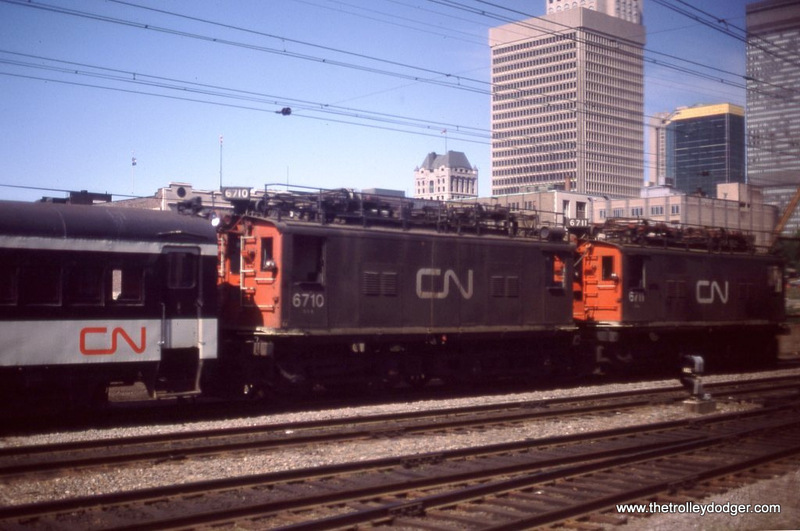 CN Box cabs 6710 & 6711 at Montreal photographed from the Amtrak MONTREALER approaching Central Station. 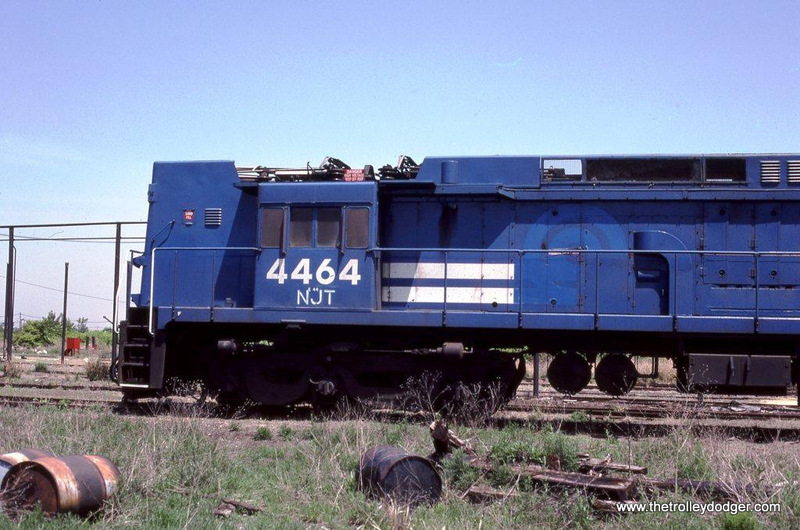 Ex-NH 4400 “Washboard” MUs in the dead line at New Haven, CT on March17, 1984 awaiting scrapping. 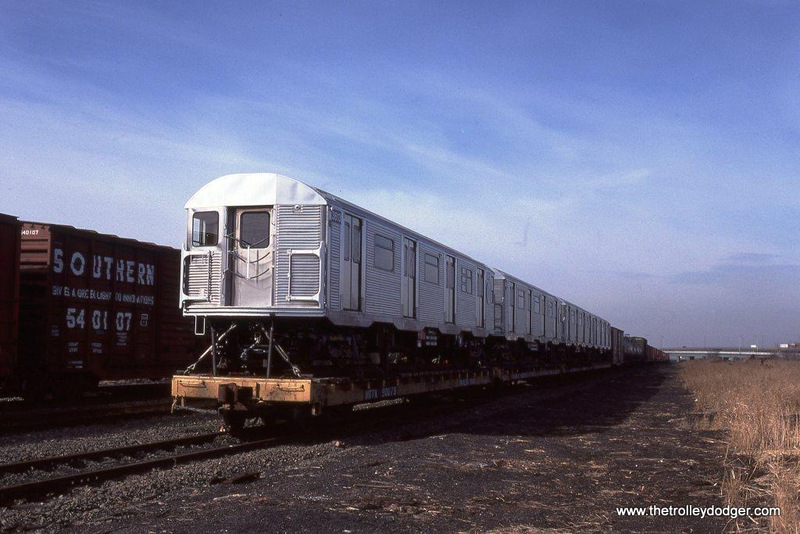 Third Avenue Railway System car 678 still wears her bicentennial paint scheme as she sits outside the car barn at the National Capital Trolley Museum in May of 1989. The car has since been repainted in the TARS color scheme of red and white. 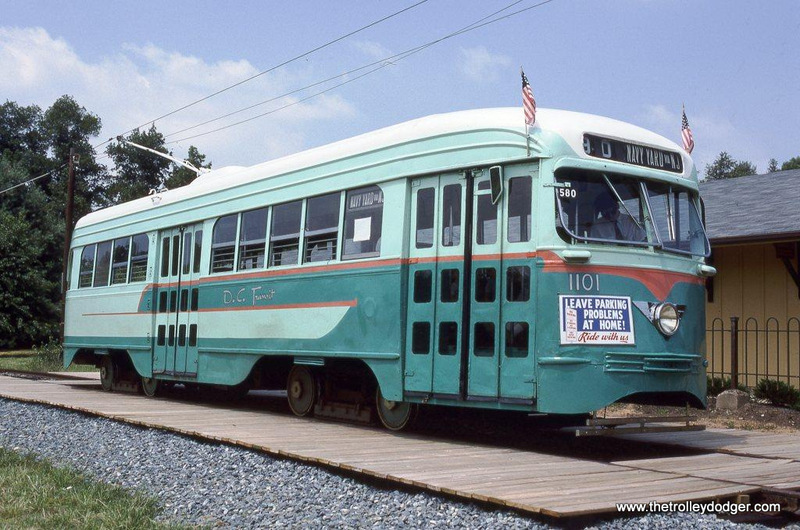 DC Transit PCC #1101, 8-5-89. Pittsburgh Railways DE City Low-floor car #4398 at Washington, PA. 9-27-13. 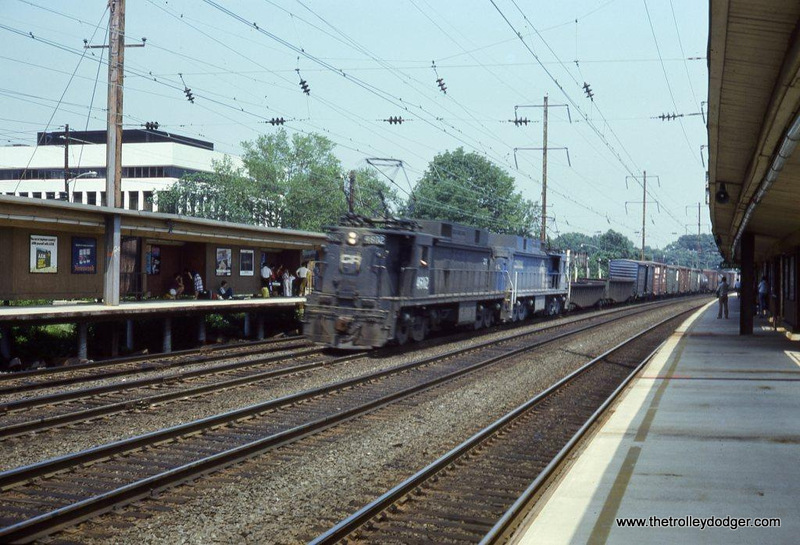 Conrail E-33 #4602 leads a long freight through the Metropark station at Iselin, NJ. 8-14-78. From my very first roll of color slide film. 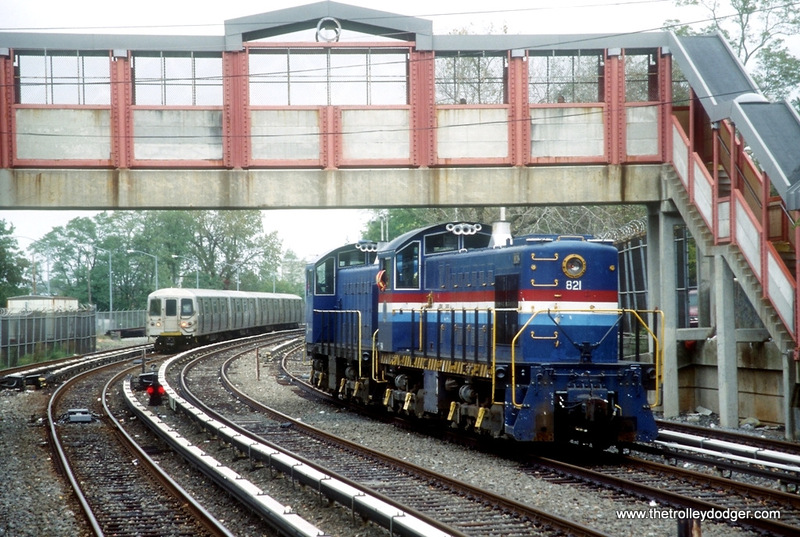 Conrail E-44 #4430 leads a westbound train at the Metropark station, Iselin, NJ. From my very first roll of 35mm slide film. 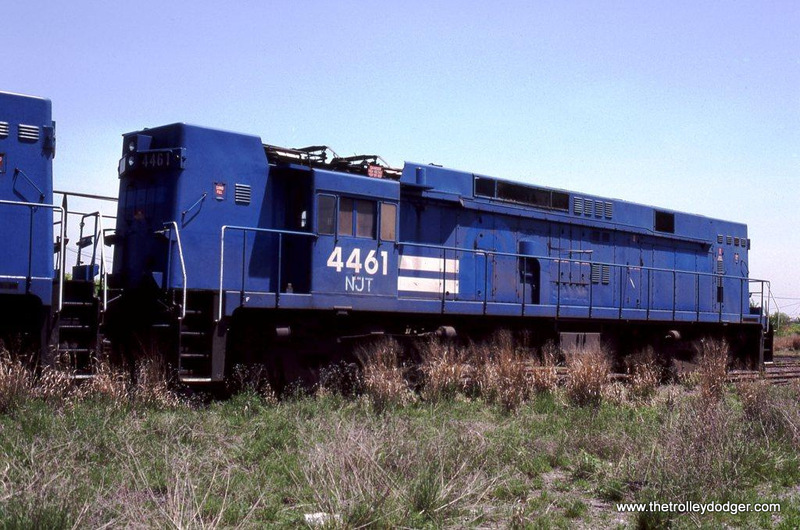 Conrail sold E-44 #4464 to NJ Transit in 1983 for use as work train power. 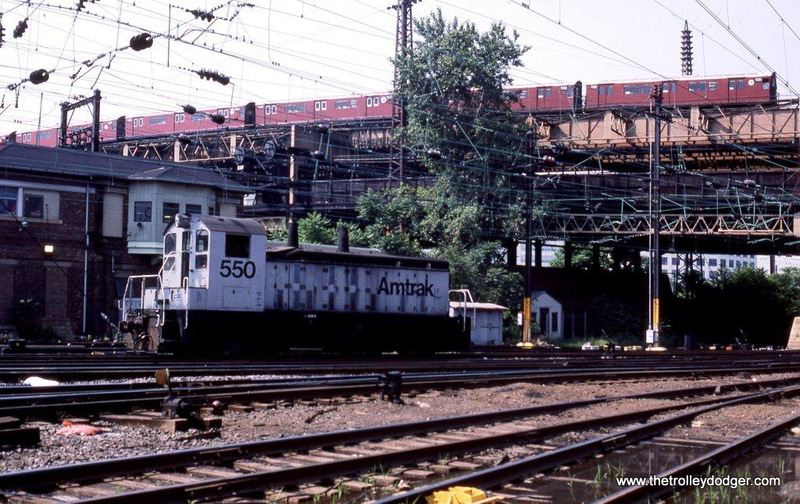 The locomotive never turned a wheel for NJT and it is shown here at the Ex-CNJ yard at Elizabethport, NJ. 5-25-83. 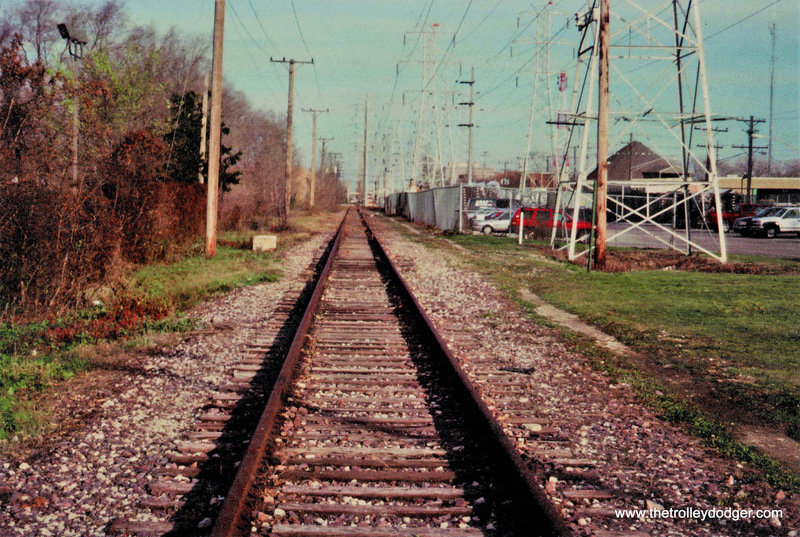 In 1982 I was in New Orleans, LA making an overnight connection between Amtrak’s CRESENT and the SUNSET LIMITED. In the general vicinity of the Amtrak station I took several photos of the streetcars. 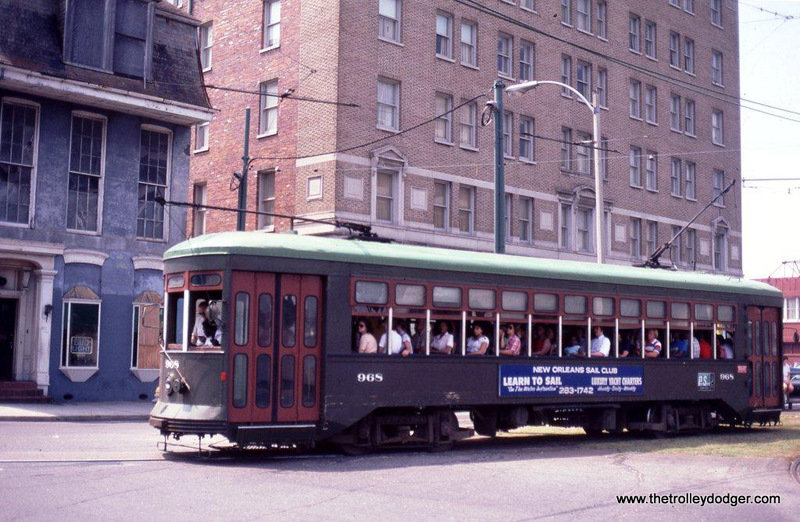 All of the streetcar photos were taken in the vicinity of Lee Circle. All of these cars were built by Perley Thomas in 1924. Car #904 New Orleans, LA. 6-1-82. I wanted to include this photo in spite of the fact that the subject is Amtrak SSB-1200 #550 at Q Tower at Sunnyside, Queens, New York. 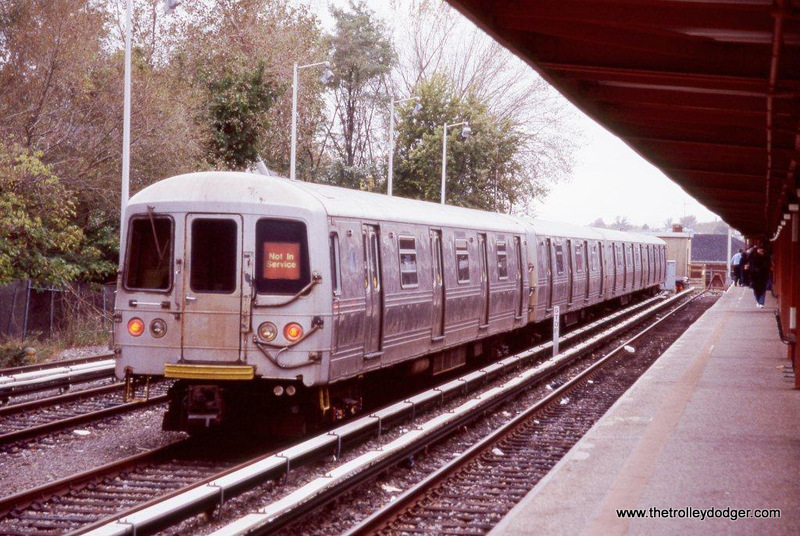 I hope it will be of interest to traction fans because of the IRT subway train of NYCTA R-36 “Redbirds” passing overhead in the background. 6-20-87. 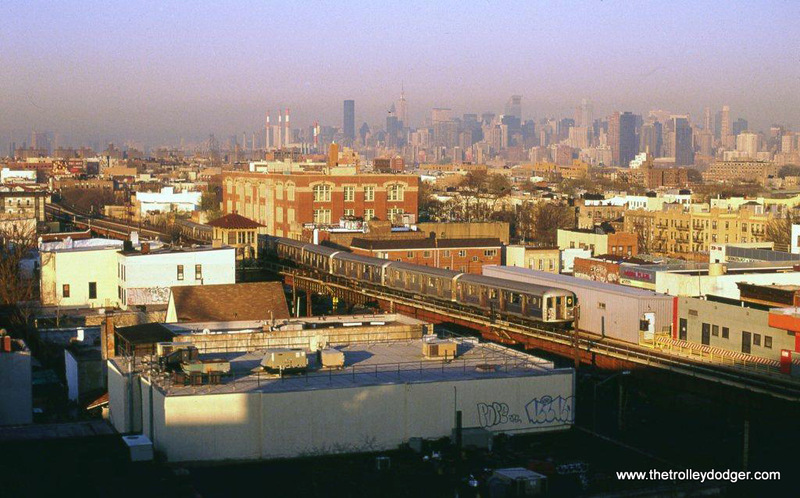 A “W” train of R-42 cars near the Ditmers Boulevard station in Astoria Queens, New York, 4-19-05. 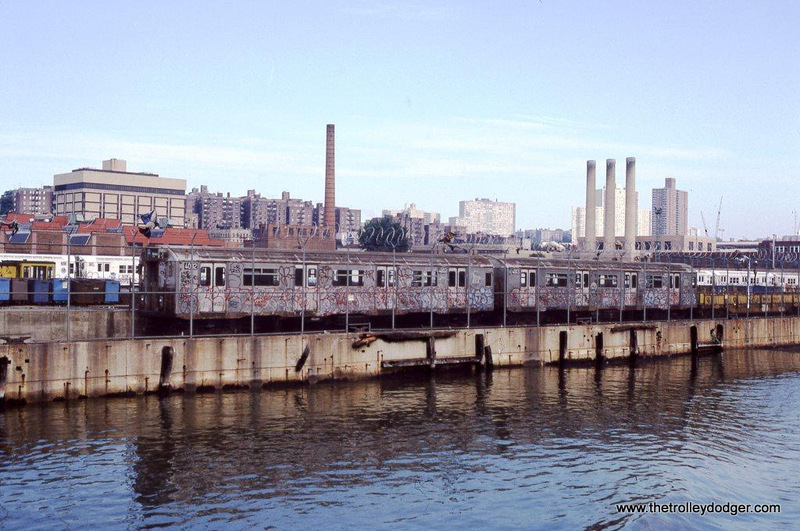 The NYCTA Car Repair yard at 207th Street in New York as seen from a boat in the Harlem River in 1986. Visible just behind the fence are two R-21 garbage motors. 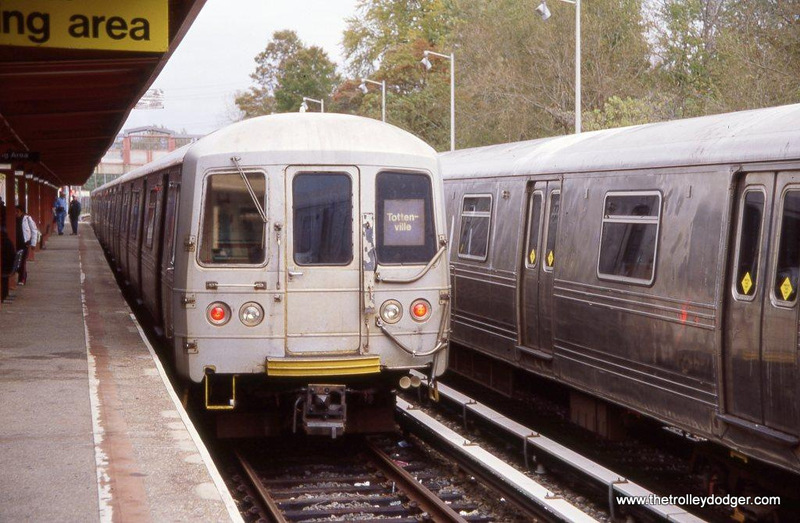 These cars were tasked with the removal of trash from the subway. The two shown here G7208 and G7206 have both been retired and most likely scrapped. Apparently retired and not too far from being scrapped is R-21 #7086 at the 207th Street Car Repair yard. 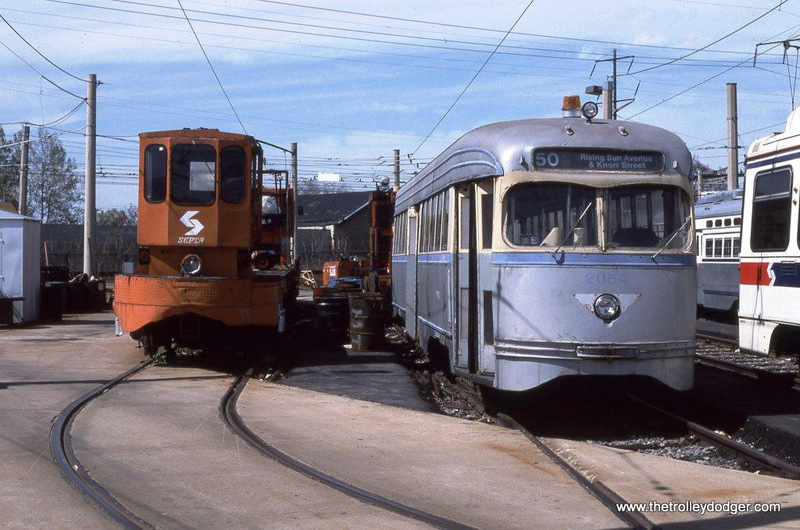 Retired R-38s #4002 & #4003 at the 207th Street Car Repair yard. 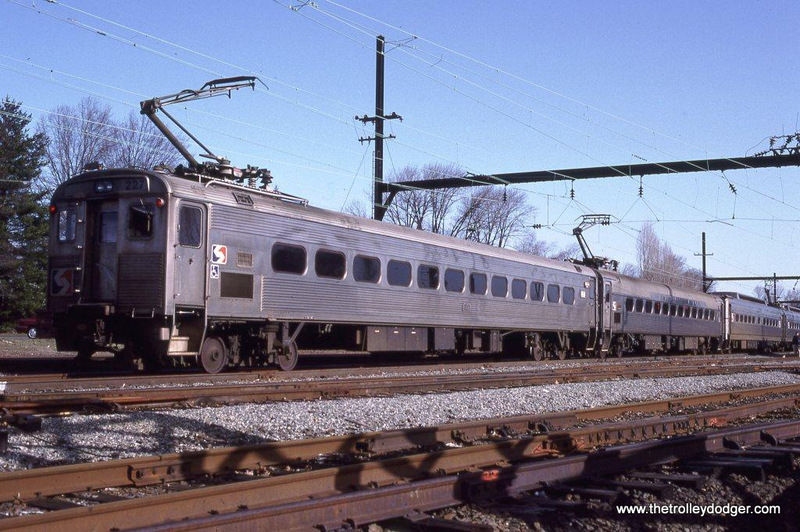 Starting in 1988 and continuing to 1990, NYCTA sent most of the R-32 cars to Morrison Knudsen at Hornell, NY for overhaul. 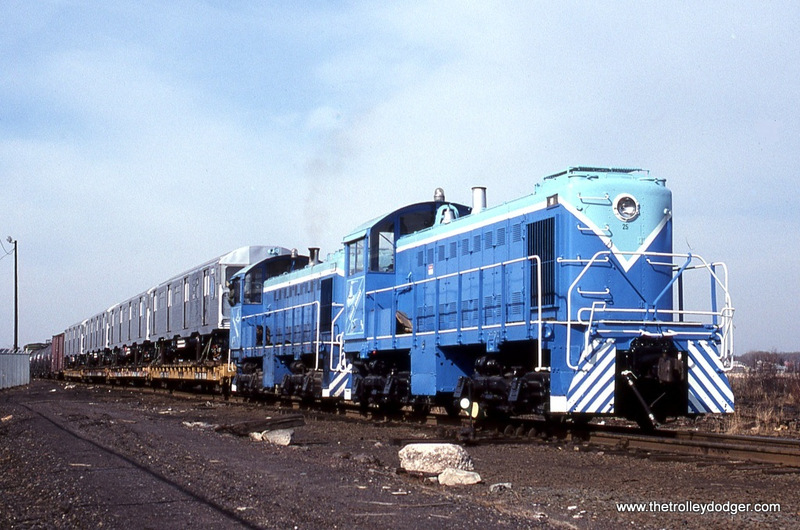 Conrail brought the rebuilt cars loaded onto flat cars down the River Line to Greenville yard in Jersey City, New Jersey. 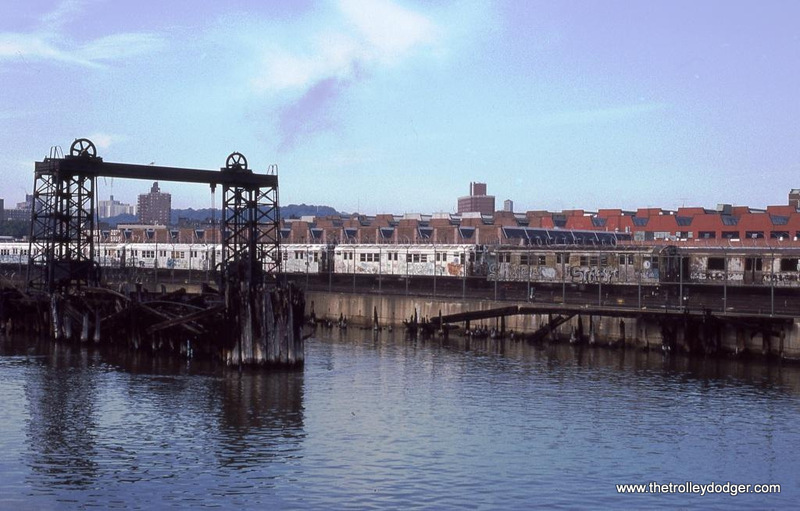 From there the New York Cross Harbor Railroad car floated them back to New York City. 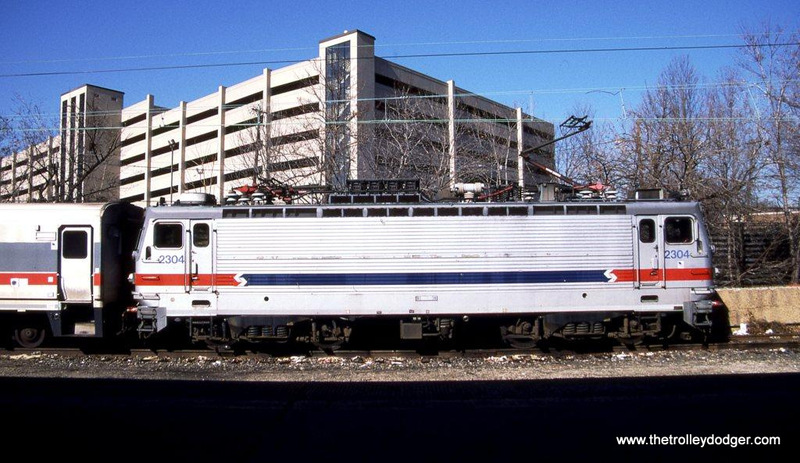 On February 13, 1990 several of the rebuilt R-32a cars, including #3613 head out, were sitting in Greenville yard awaiting a boat ride home. 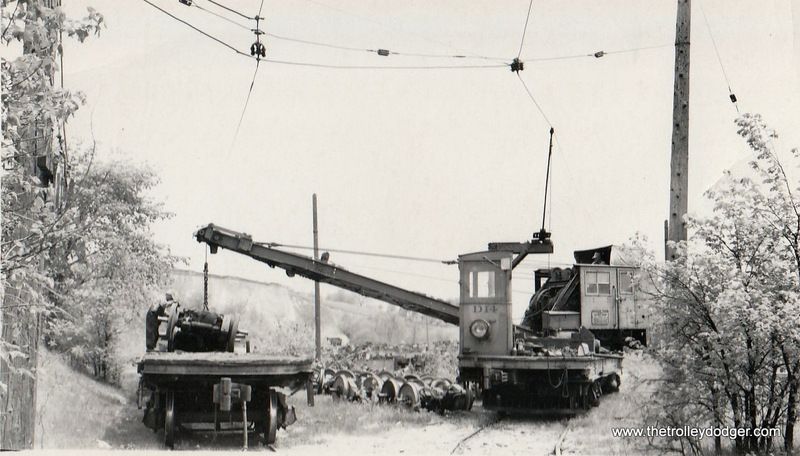 Eventually NYCHR Alco S-1s 25 & 22 came across the float bridge and coupled to the flat car containing the subway cars. The immaculate Alcos then loaded the car of R-32As onto the car float for a trip across the bay to Brooklyn. 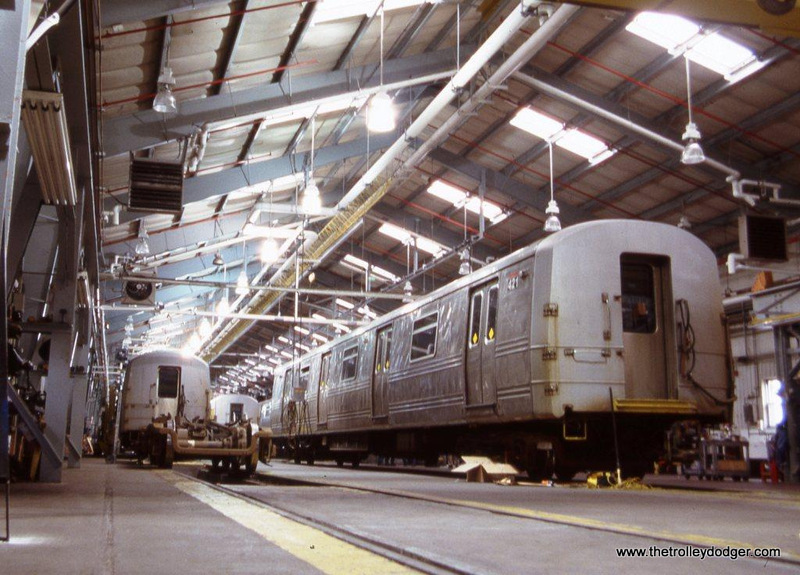 End of the line: NYCTA R-10 cars face a very bleak future at Greenville yard, Jersey City, NJ. 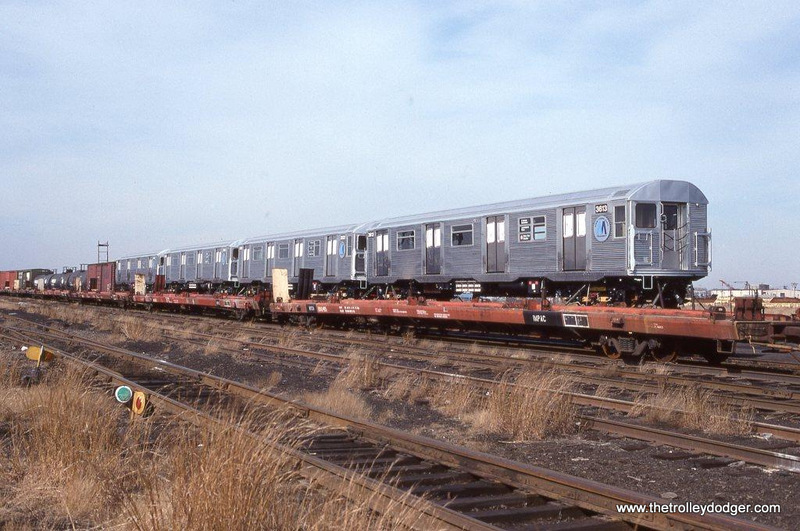 R-44 cars at Great Kills, NY. 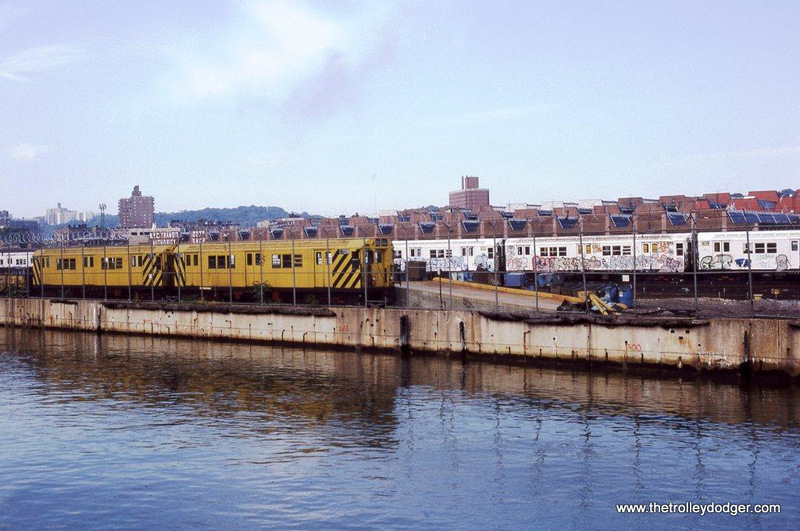 R-44 cars at the terminal in Tottenville, NY. 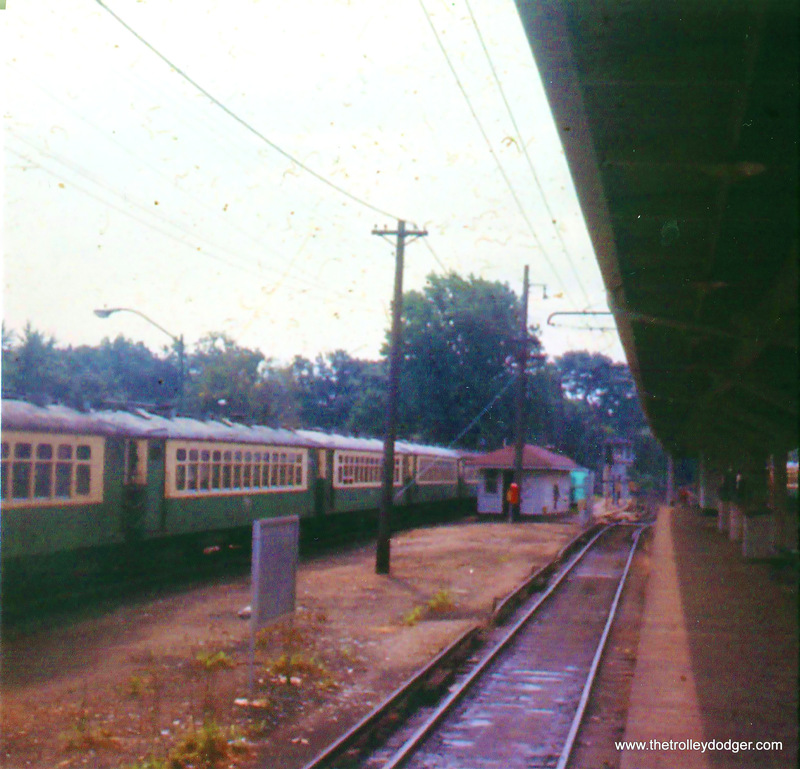 Staten Island S-1 #821 & R-44 cars at Annadale. The Alco was leading an Electric Railroaders Association “Farewell to the Alcos” fan trip on October 25, 2008. 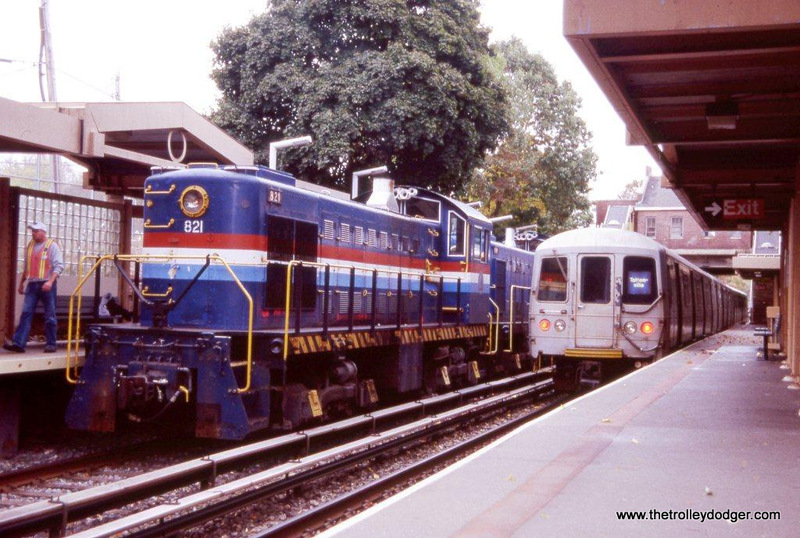 Staten Island Railway Alco S-2 #821 & S-1 #407 make way for an approaching train of R-44 cars at Tottenville, NY in October of 2008. 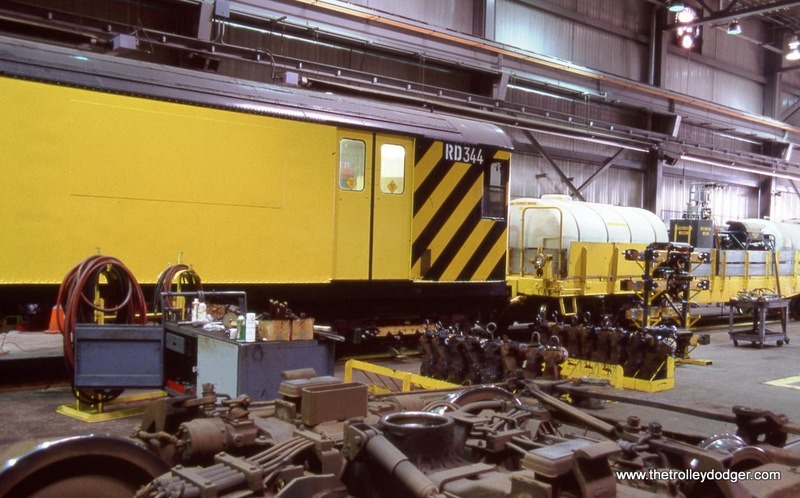 R-44 car #421 in the shop at Clifton, NY. SIRTOA R-33 De-Icer car #RD344 at Clifton, NY. 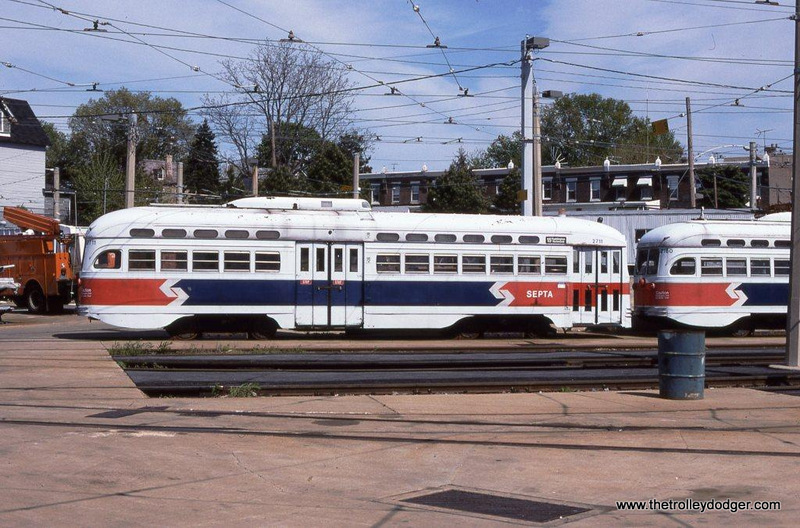 SEPTA Kawasaki car #9023 & PCC #2129 at the Elmwood Avenue car barn in Philadelphia, PA in January of 1992. SEPTA PCC car #2129 at the CSX/SEPTA grade crossing at Main Street in Darby, PA.
SEPTA PCC car #2129 at 49th Street & Woodland Avenue in West Philadelphia PA. This car was built by the St Louis Car Company in 1948. 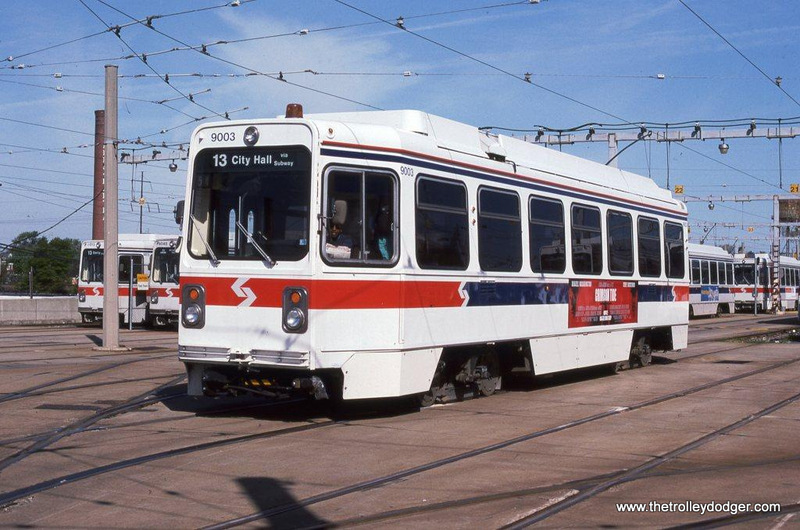 It is now preserved by the Pikes Peak Historical Street Railway at Colorado Springs, CO.
SEPTA Kawasaki car #9017, PCC #2129, & GM RTS bus (model T8W603) #8043 at Darby, PA in 1992. 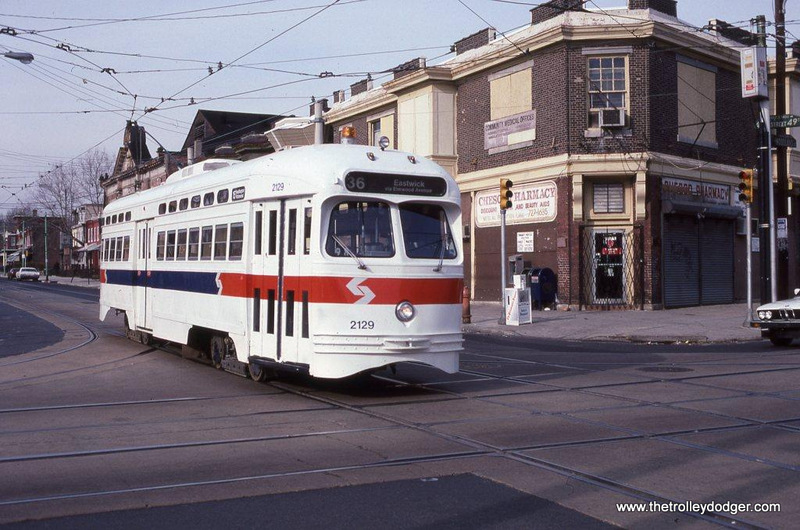 PCC #2129 at the 80th & Eastwick loop in Philadelphia, which is the end of the Route 36. This photo was taken on January 25, 1992, the car was used on a Wilmington Chapter NRHS charter this day. 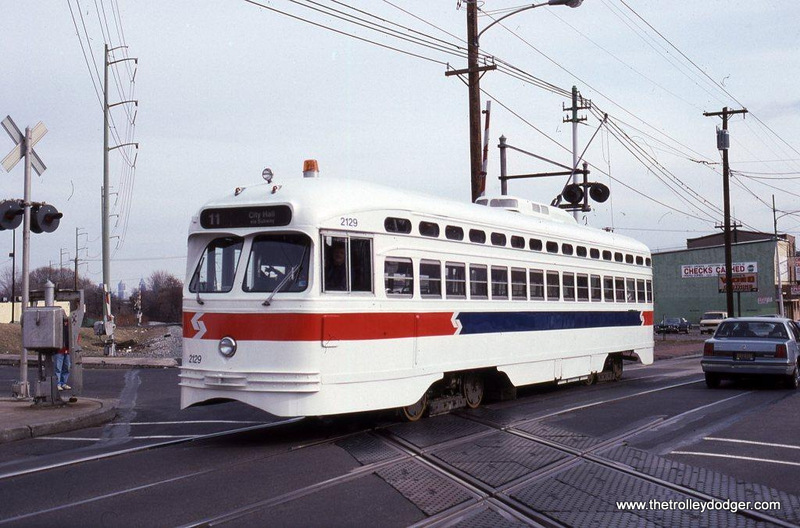 SEPTA PCC #2054 built by St Louis Car in 1941. Philadelphia, PA. 5-7-95. 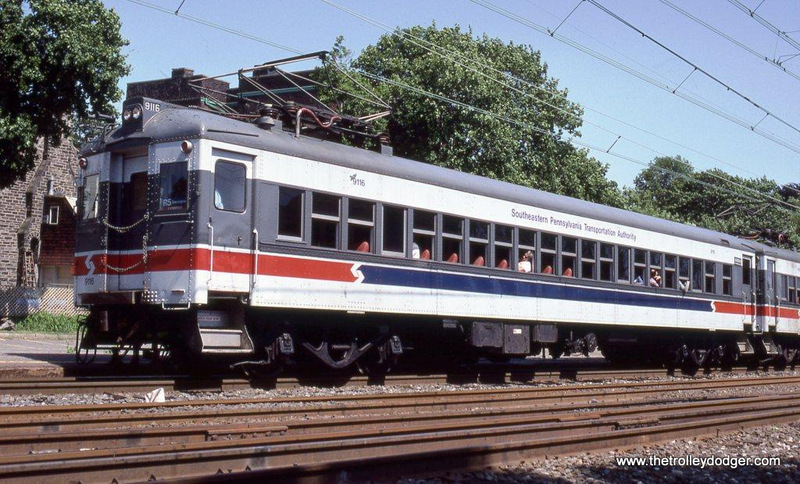 SEPTA PCC #2711 at the Elmwood Depot, Philadelphia, PA.
SEPTA PCC #2728 in Philadelphia Transportation Company colors at Philadelphia, PA in 1995. 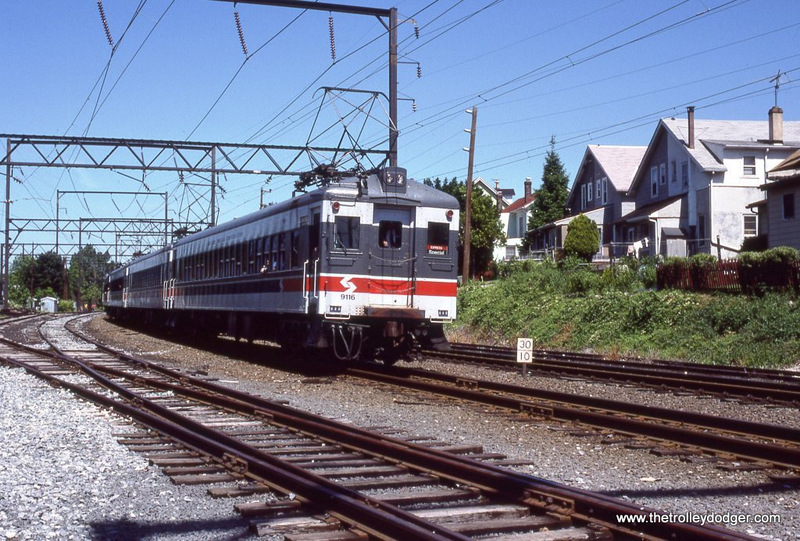 On May 7, 1995 Wilmington Chapter NRHS chartered SEPTA PCC #2799 in a Red Arrow paint scheme and PCC #2728 in the colors of the Philadelphia Transportation. 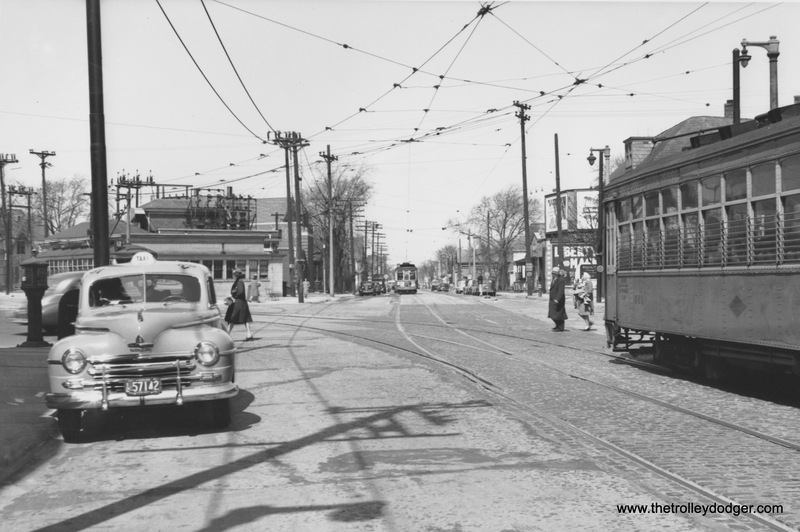 The two brightly colored cars were posed side by side on Girard Avenue at 63rd Street in the Philadelphia neighborhood of Haddington. 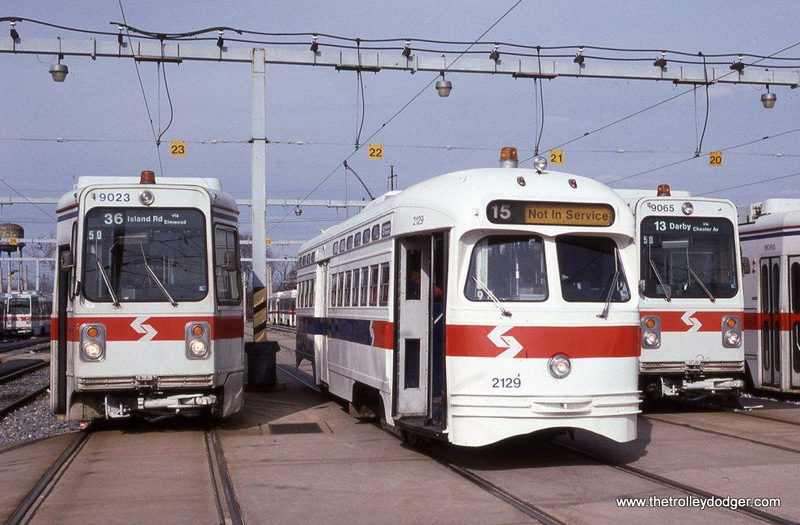 SEPTA motor flat #W-61 & PCC #2054 at Philadelphia, PA.
SEPTA motor flat #W-61 at Philadelphia, PA. 1-25-92. SEPTA crane #W-56 at Elmwood. 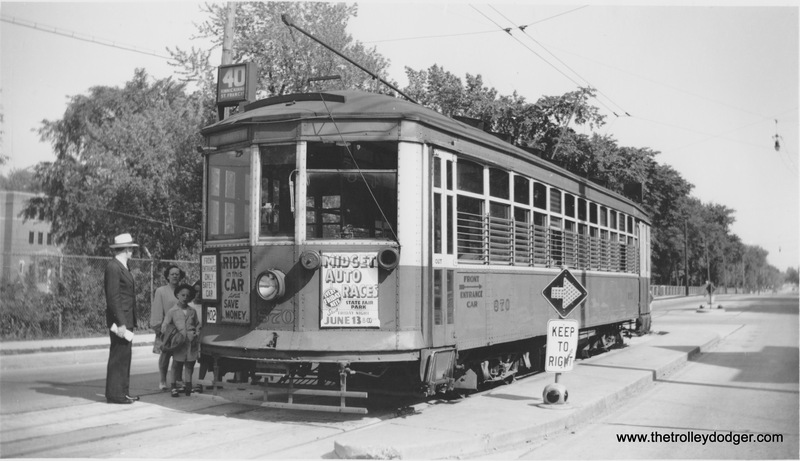 Motor flat # W-62 at Elmwood. 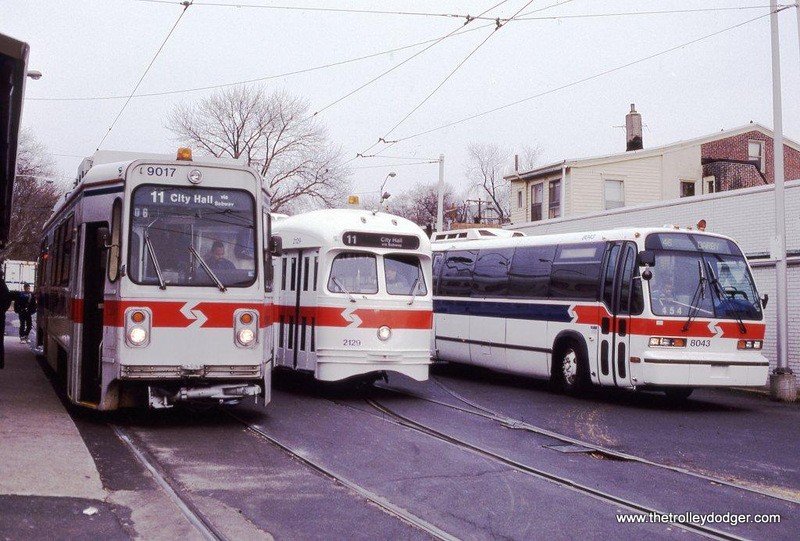 Line up of SEPTA Kawasaki cars at the Elmwood Avenue car barn in Philadelphia, PA. 1-25-92. 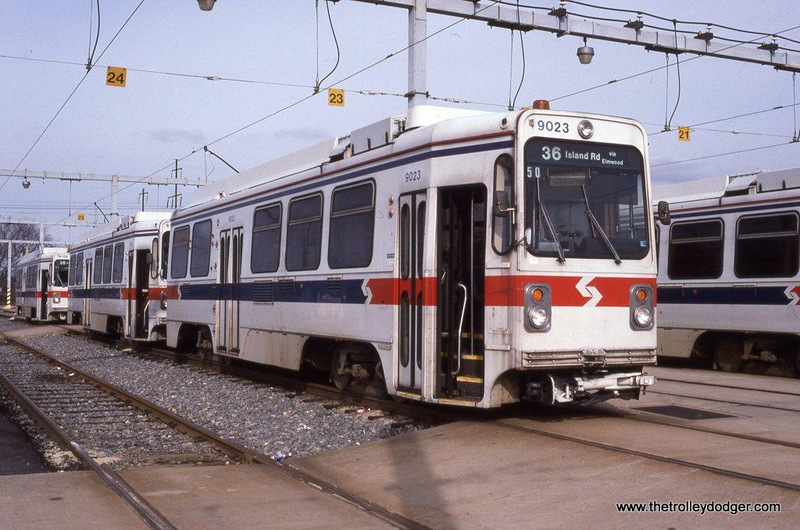 SEPTA Kawasaki car #9003 departs the Elmwood depot, 5-7-95. 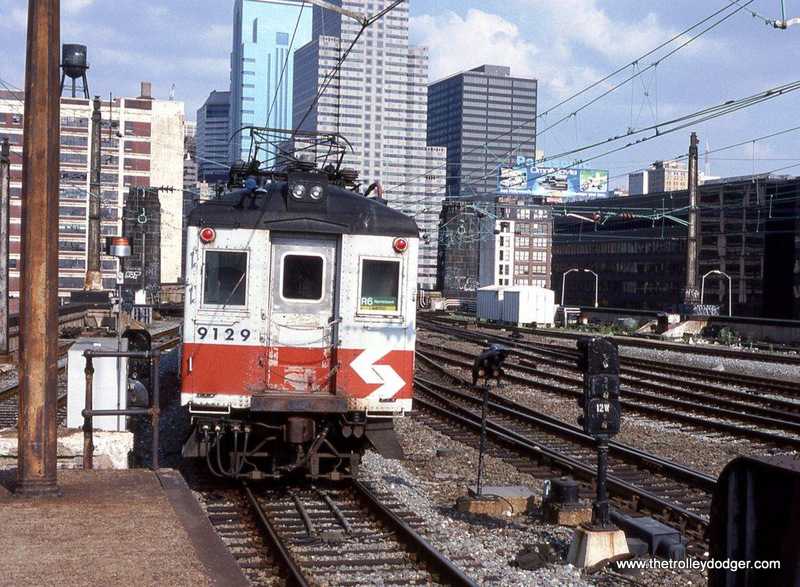 SEPTA Kawasaki car #9023 at Philadelphia, PA.
SEPTA Kawasaki car at 49th Street & Woodland Avenue in West Philadelphia, PA in 1992. 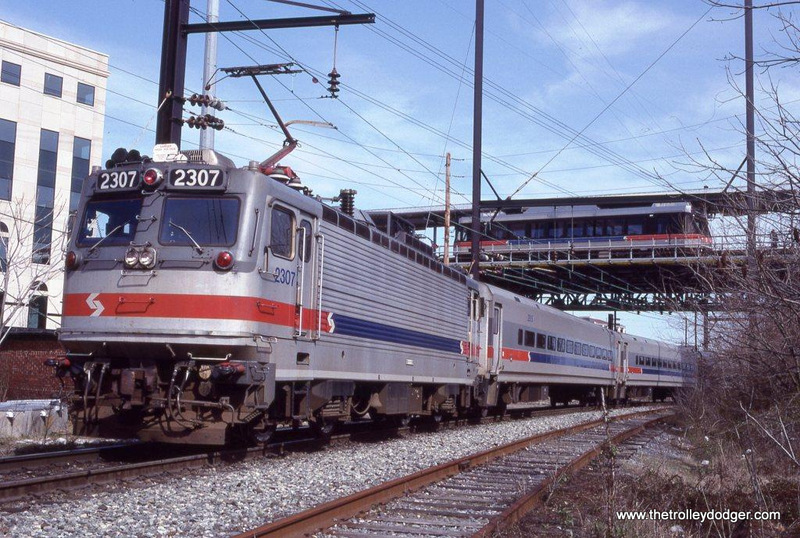 SEPTA AEM-7 #2304 laying over for the weekend at Trenton, NJ. 2-9-02. 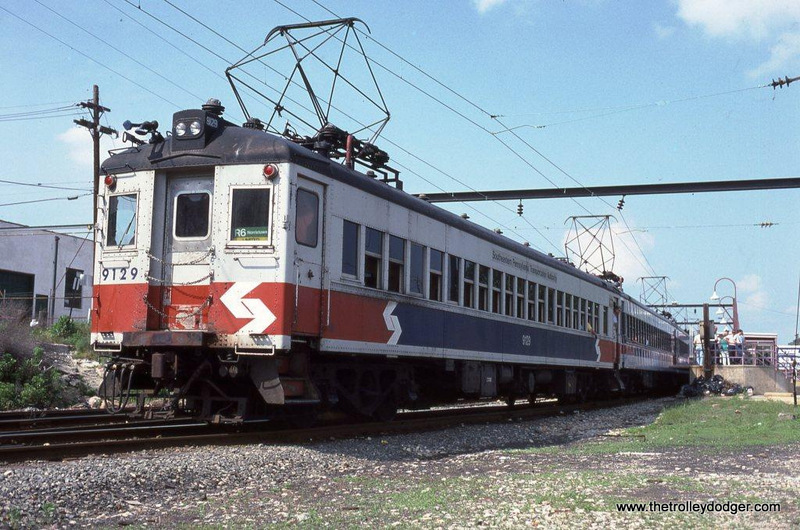 SEPTA AEM-7 #2307 at Conshohocken, PA in 1992. 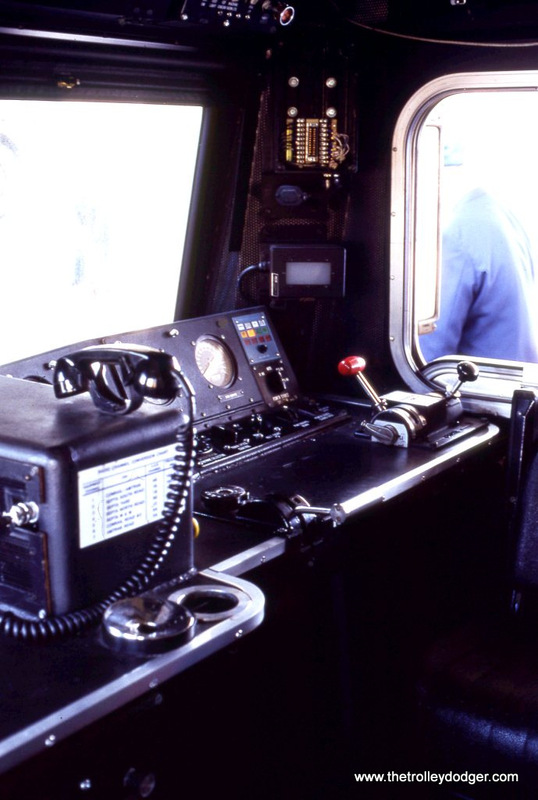 Interior of the cab of SEPTA AEM-7 #2307. 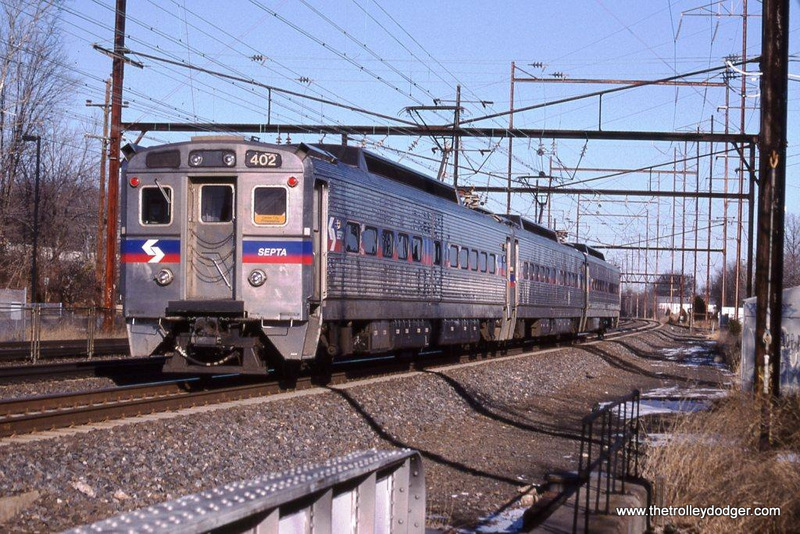 SEPTA AEM-7 2307 in the yard at West Trenton NJ. It will soon power a fan trip excursion around the Philadelphia area. 3-29-92. 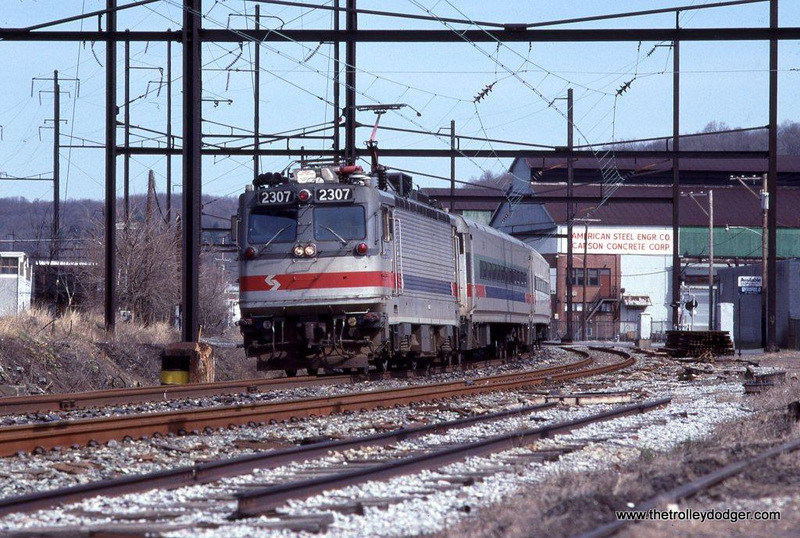 The Philadelphia Chapter NRHS arranged this over & under shot of SEPTA AEM-7 #2307 & P&W N-5 #451 at Norristown, PA on March 29, 1992. 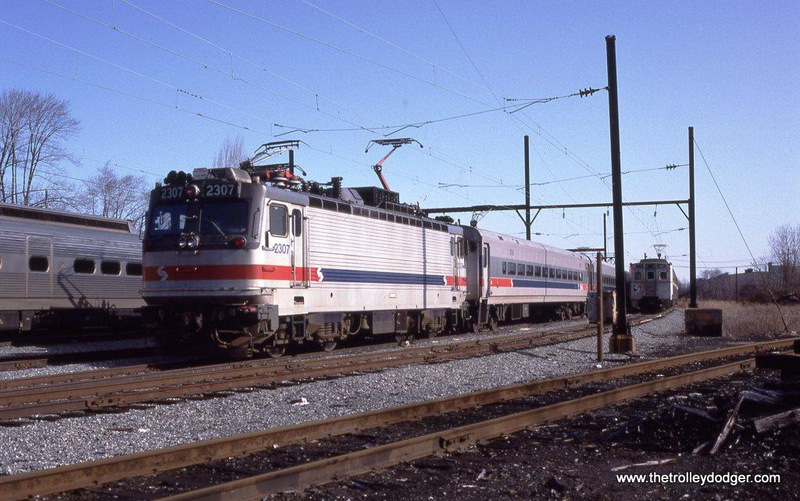 AEM-7 2307 at West Trenton, NJ. 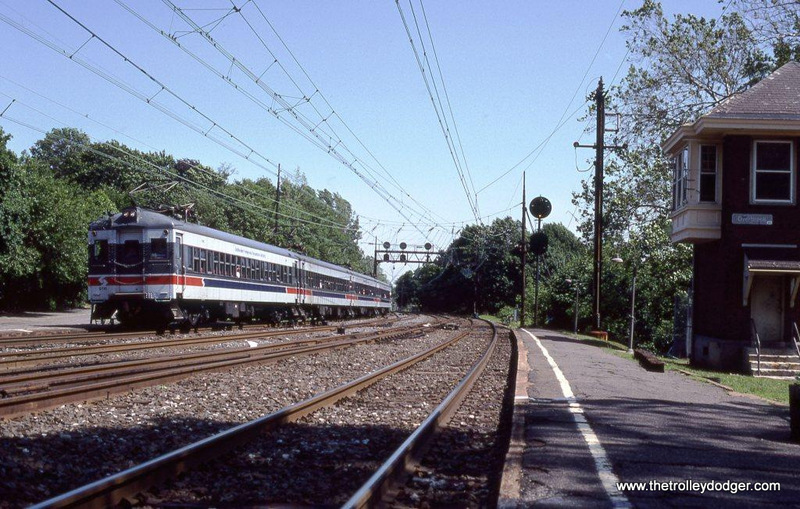 SEPTA Ex-Reading Blueliner MU train on a Philadelphia Chapter NRHS special during a photo stop at Glenside, PA on June 5,1988. 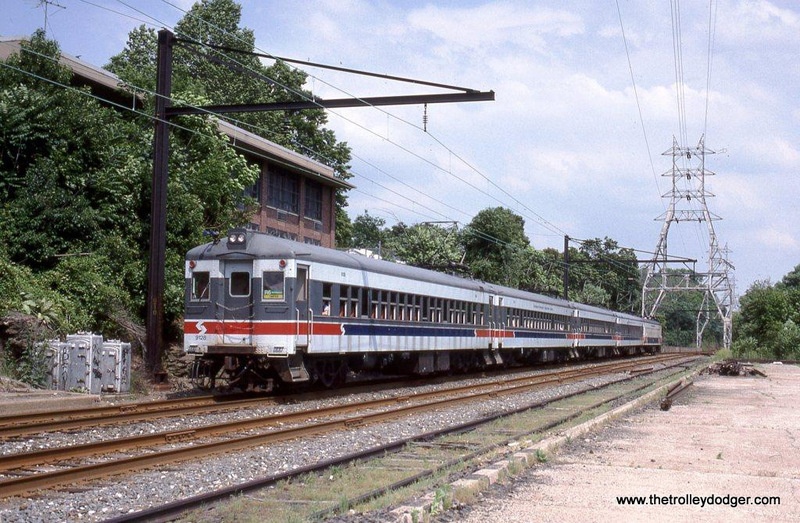 SEPTA Blueliner #9128 at Wissahickon, PA. Number 9128 has been preserved by the Reading Technical and Historical Society at Hamburg, PA. 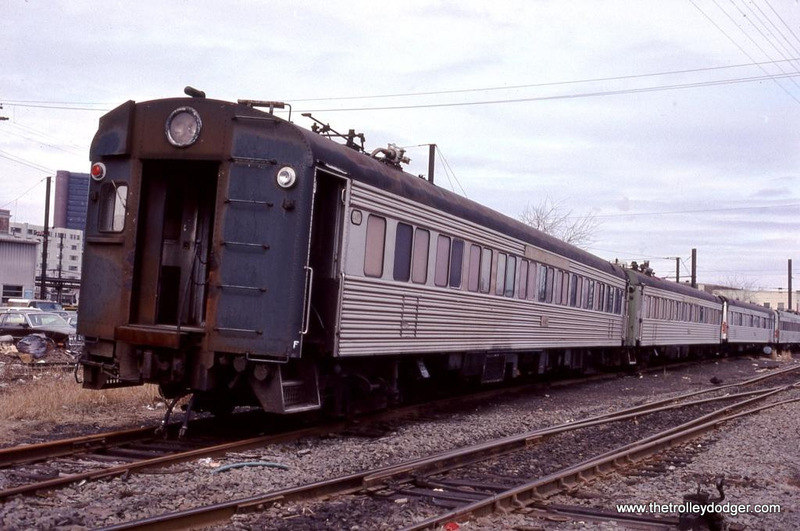 According to their website this MU, Reading Class EPb was built as an 80 seat steel coach by Harlan & Hollingsworth (subsidiary of Bethlehem Steel) in 1932 and converted into a MU trailer. 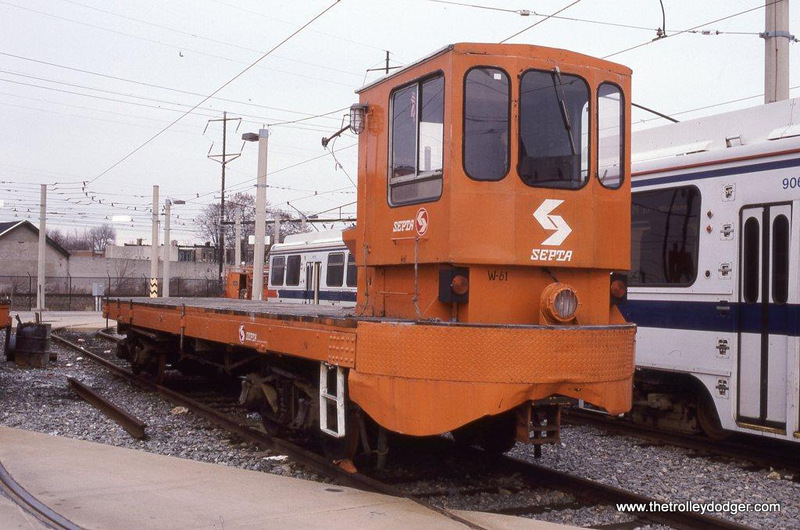 SEPTA Ex-Reading class EPb Blueliner MU #9116 in 1988. 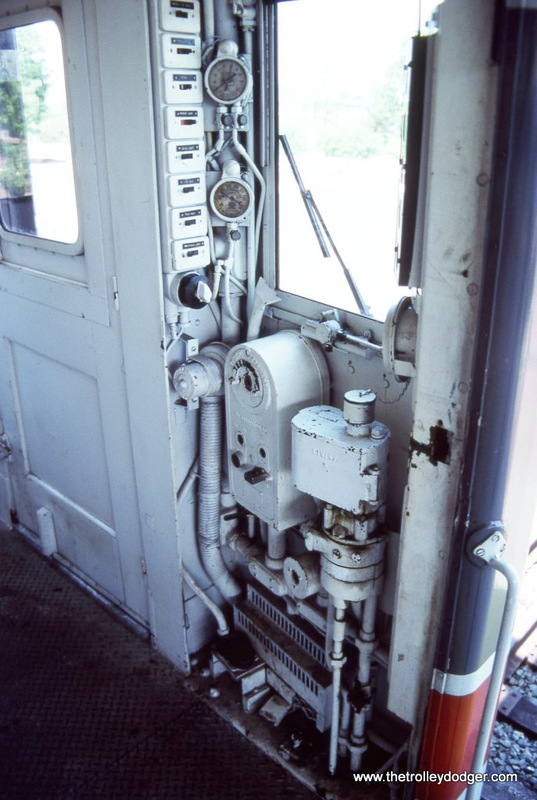 The engineer’s Controls of SEPTA Blueliner MU #9119. 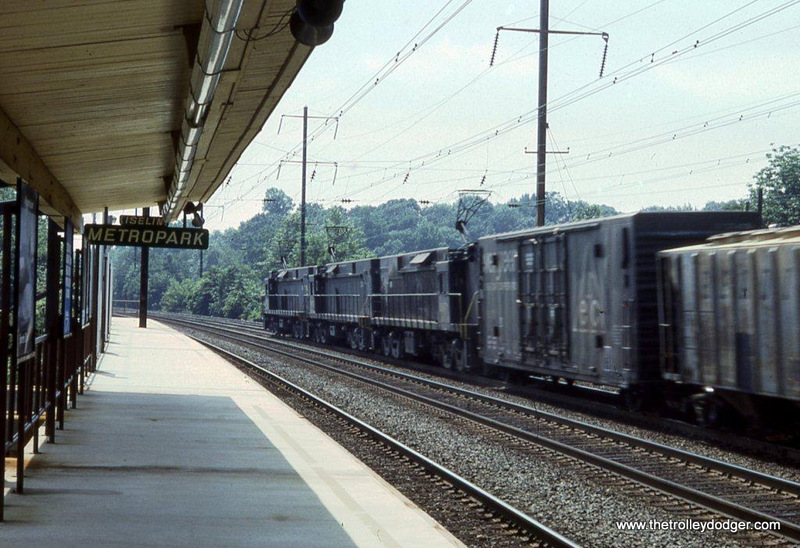 SEPTA Blueliners on a fan trip passing the Ex-PRR interlocking tower at Overbrook, PA on the famed Pennsy Mainline. 6-5-88. 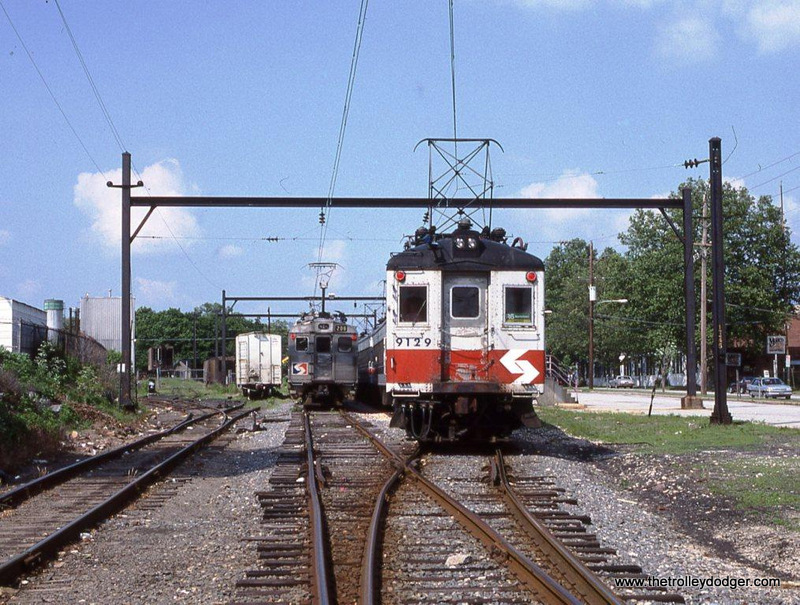 SEPTA Blueliner #9129 at Elm Street Station in Norristown, PA in 1989. Blueliner #9129 departs from the upper level of 30th Street Station Philadelphia, PA.
A train of SEPTA Silverliner IV MUs departs Cornwall Heights, PA. 1-10-10. 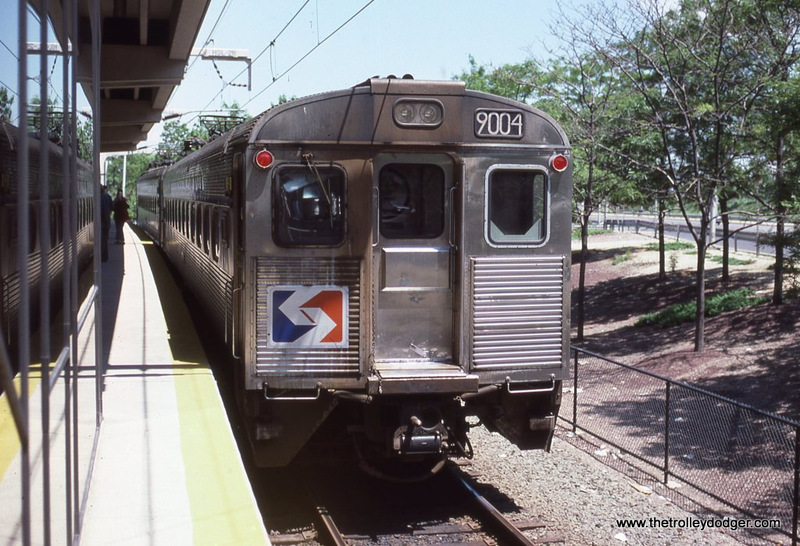 SEPTA Silverliner II #9004 (Ex-RDG) at the Philadelphia Airport Station in 1988. 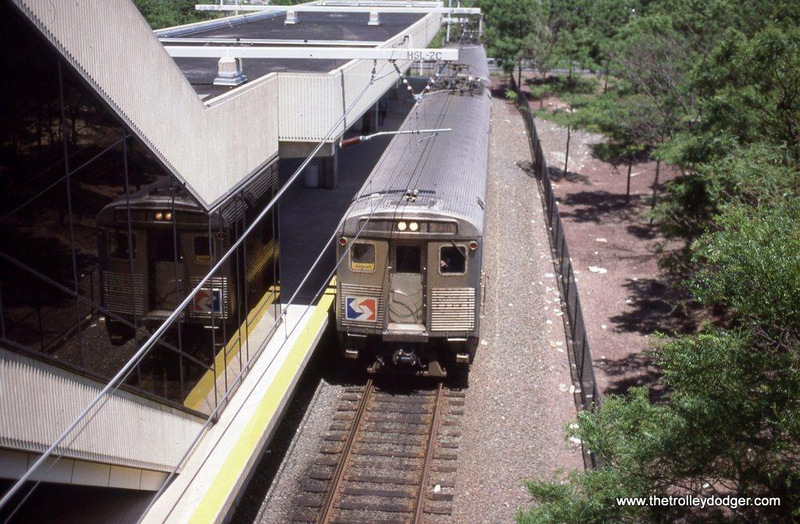 SEPTA Silverliner III #238 on a R-1 Airport line train at the Philadelphia Airport station. 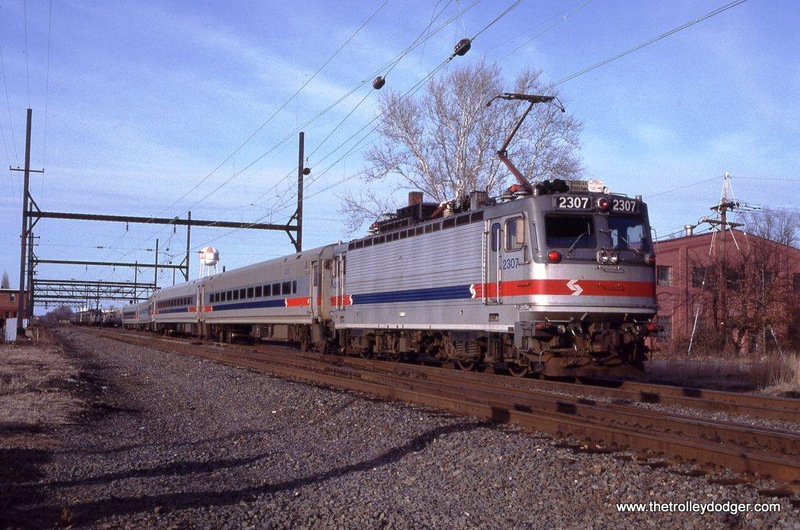 SEPTA Silverliner III #227 at West Trenton NJ. 3-29 -92. This MU was built by St Louis car in 1967. 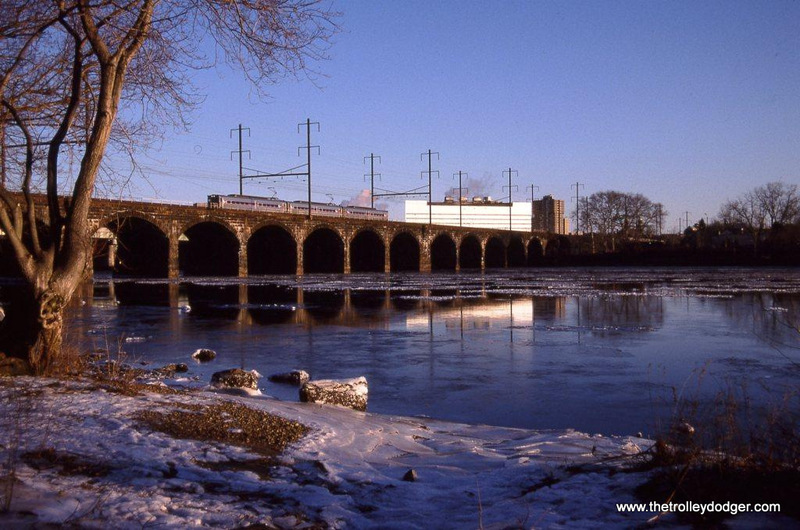 A 3 car train of SEPTA Siverliners crossing the Delaware River at Morrisville, PA in January of 2010. 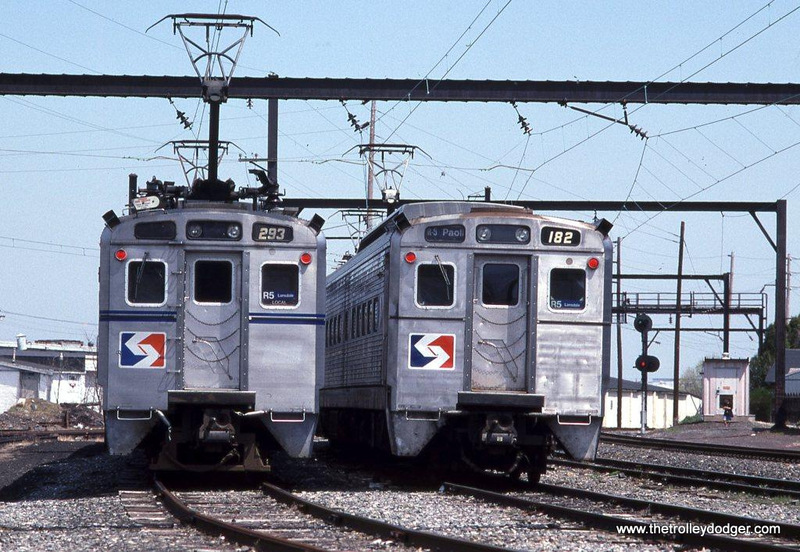 SEPTA Silverliner II #263 & Silverliner IV #182 at Lansdale, PA in April of 1993. 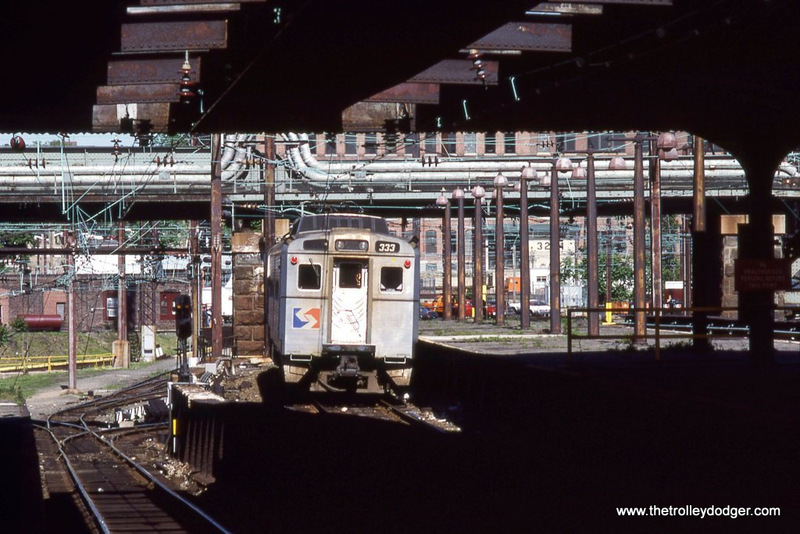 Silverliner IV #333 departing the upper level of 30th Street Station Philadelphia, PA in 1988. 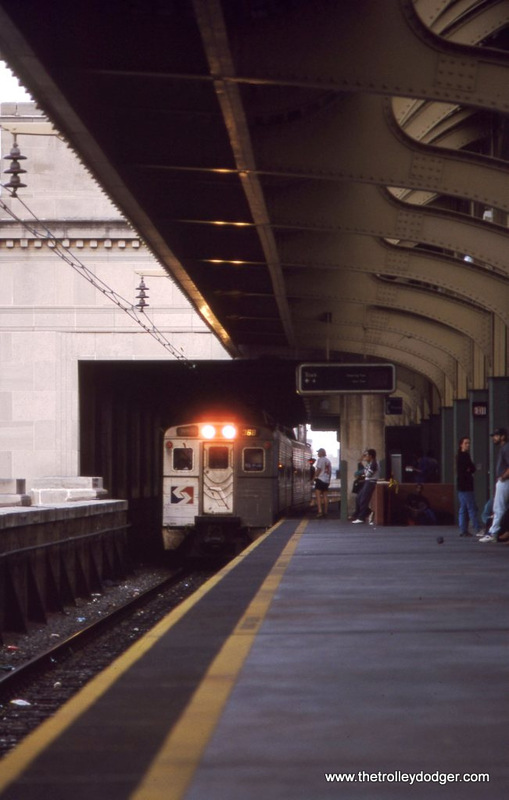 SEPTA Silverliner IV #368 on a R-5 train arriving at the Upper Level of 30th Street Station, Philadelphia PA. 4-25-93. 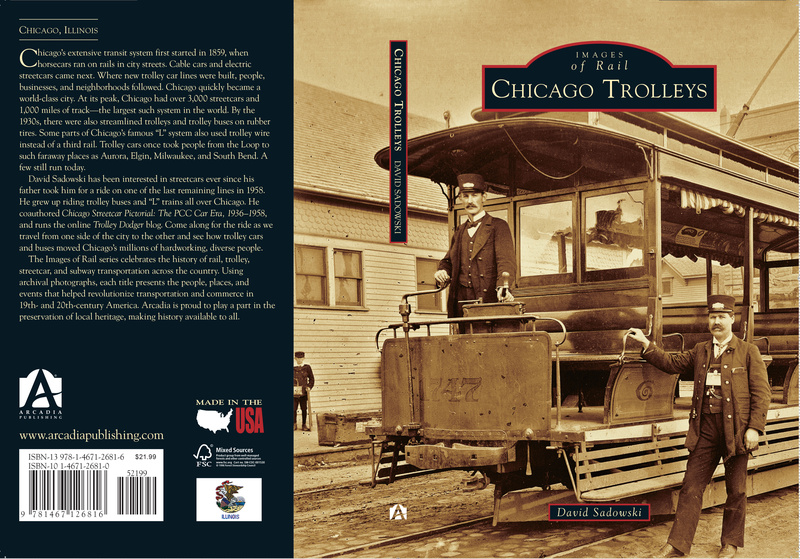 Check out our new book Chicago Trolleys. Signed copies are available through our Online Store. This book makes an excellent gift and costs just $17.99 plus shipping. That’s $4.00 off the list price. This is our 212th post, and we are gradually creating a body of work and an online resource for the benefit of all railfans, everywhere. To date, we have received over 408,000 page views, for which we are very grateful. 523 on the Lakeside Belt Line shuttle. 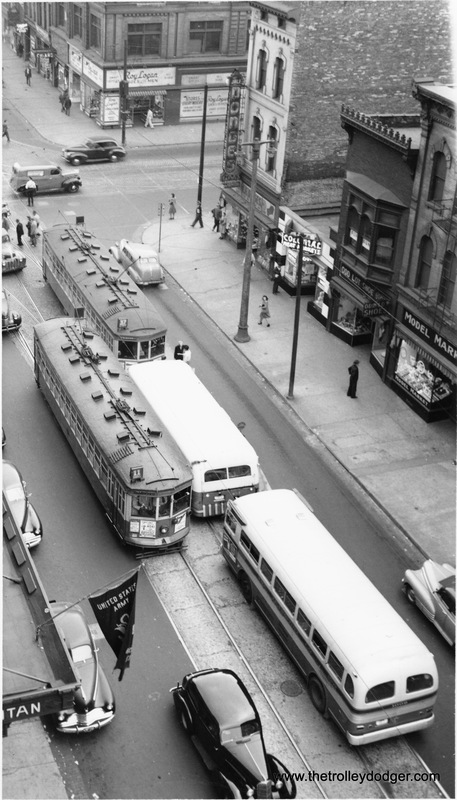 This post features prolific author Larry Sakar, who looks back at the history of Milwaukee streetcars. 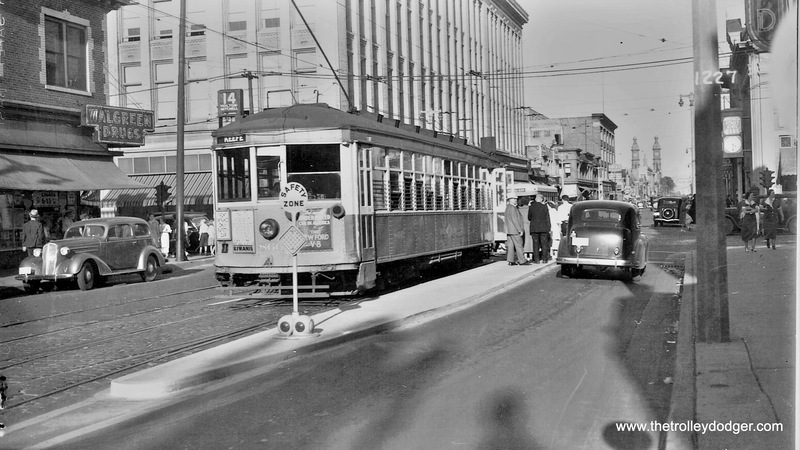 While it has now been 60 years since their demise, the new Milwaukee streetcar line, aka “The Hop,” is just months away from operation. What goes around sometimes comes around! Soon it will be possible to take new pictures of Milwaukee streetcars, as they will be tested this summer. Operators are being hired, and testing out on the streets may start as early as next month. Our thanks go out to Larry for producing another excellent article about a topic he obviously loves so much. 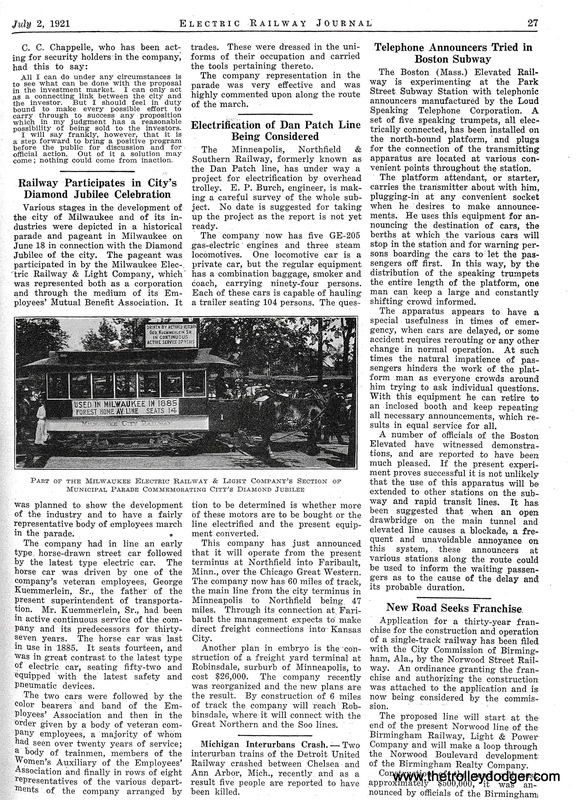 March 1, 2018 marked the 60th anniversary of the last regularly scheduled streetcar in Milwaukee. 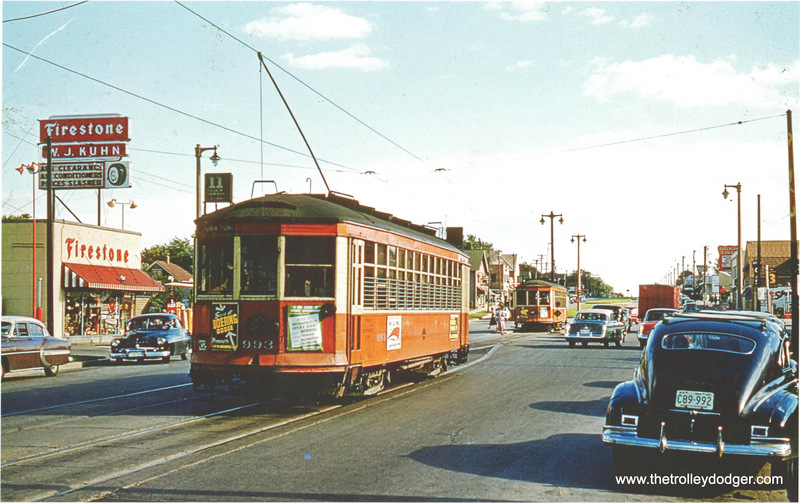 I use the term “regularly scheduled” because streetcar service on the Lakeside Belt Line employee shuttle between the Lakeside Power Plant and Kinnickinnic Avenue continued until 1961. Though intended solely for use by employees of the power plant, some Milwaukee streetcar fans were able to ride it as far as the power plant gates, according to a number of sources. 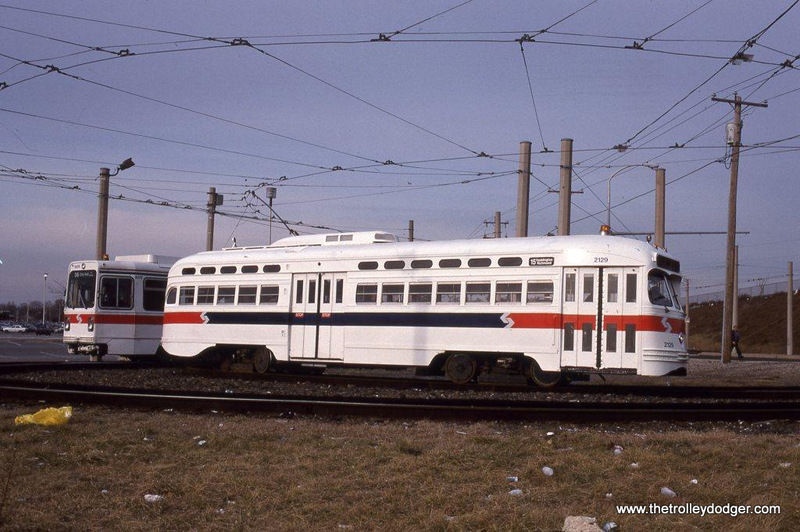 Although I have written about the Milwaukee Rapid Transit line and the interurbans, I was only 8 months old when Speedrail ran its last miles, so I never saw nor had the pleasure of experiencing it. 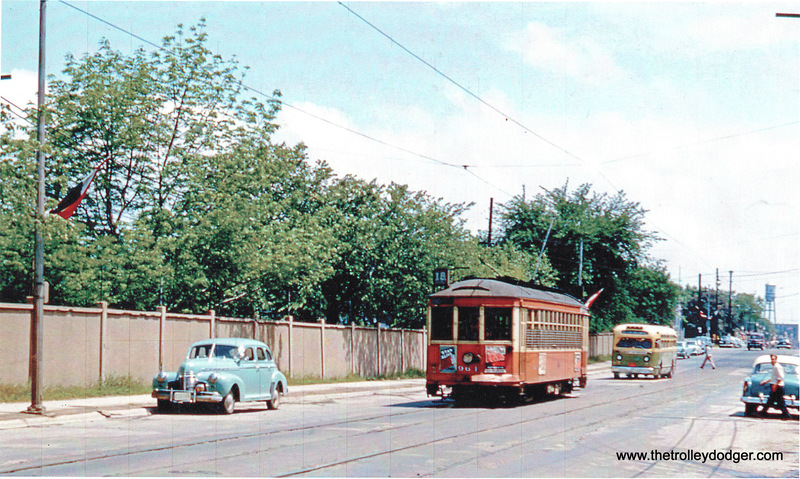 But the streetcars were a different story. 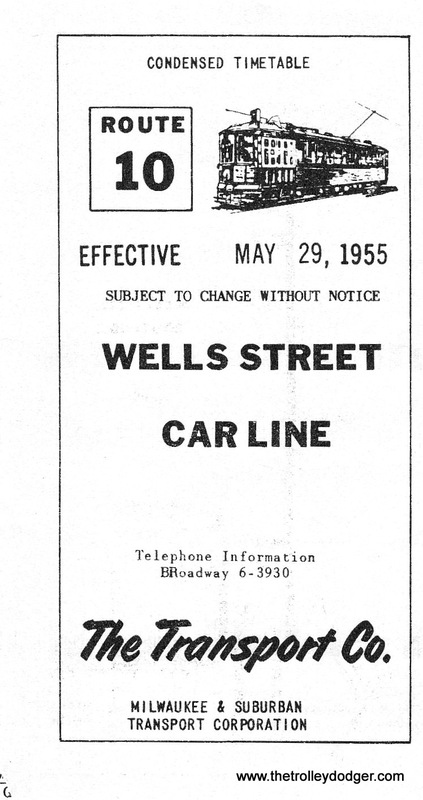 I was 7 years old when the last cars on Route 10 Wells Street made their final runs on March 1, 1958. 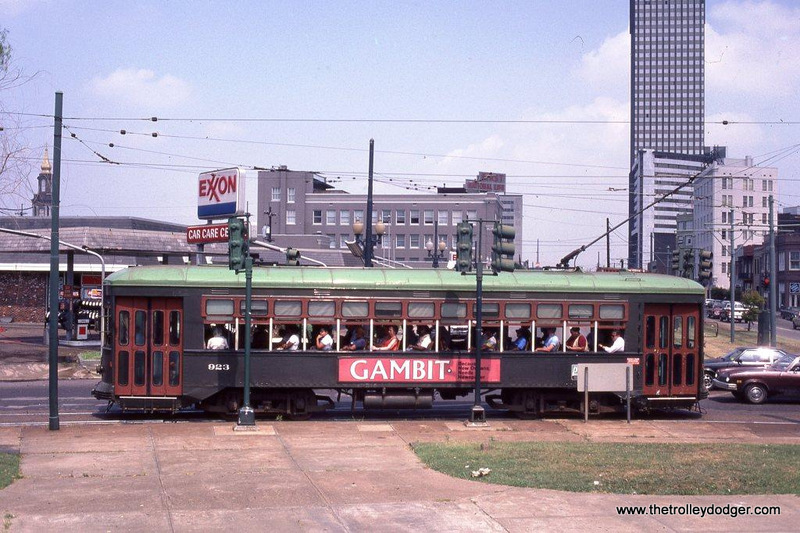 My grandmother who introduced me to the thrill of riding the streetcar and I did ride the “10” on that last day. 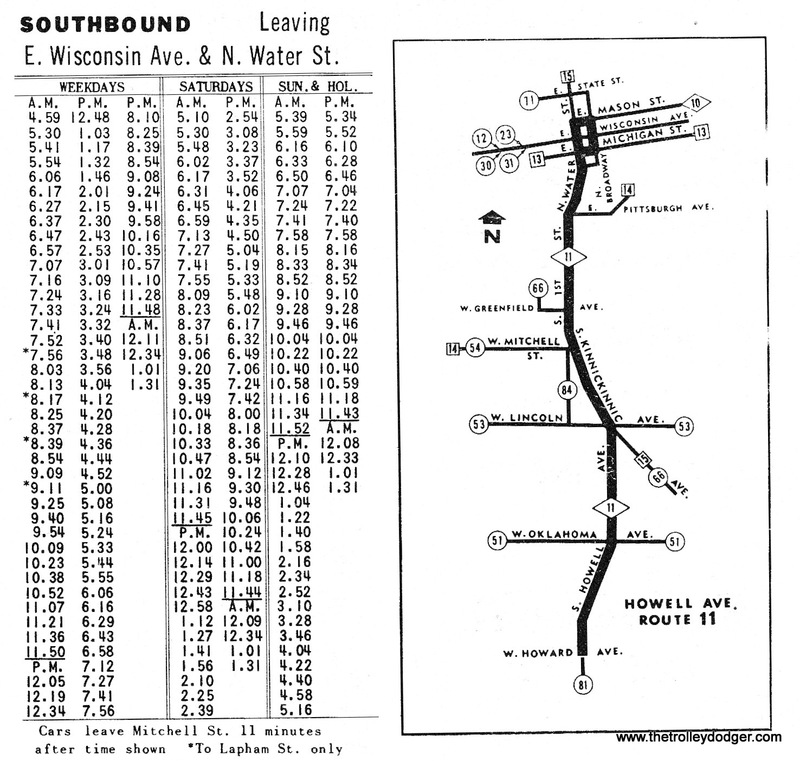 In fact, except for one very early ride on Route 11-Vliet Street a week or so before service west of downtown was converted to buses, all of my streetcar rides were on Route 10 and always between the Harwood Avenue terminal on Wauwatosa and 4th & Wells Streets downtown. 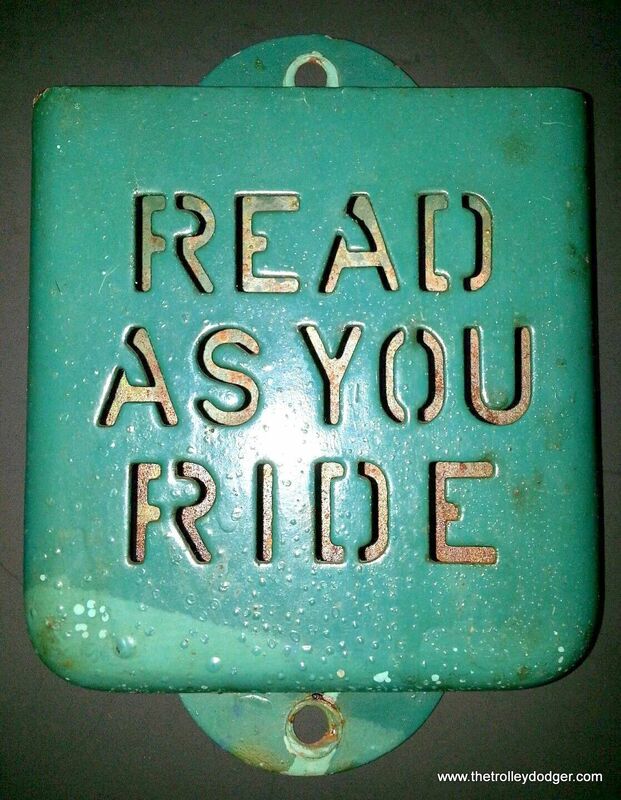 We did take a ride on the West Allis branch just one time, but I am unable to recall it beyond only the vaguest recollection. 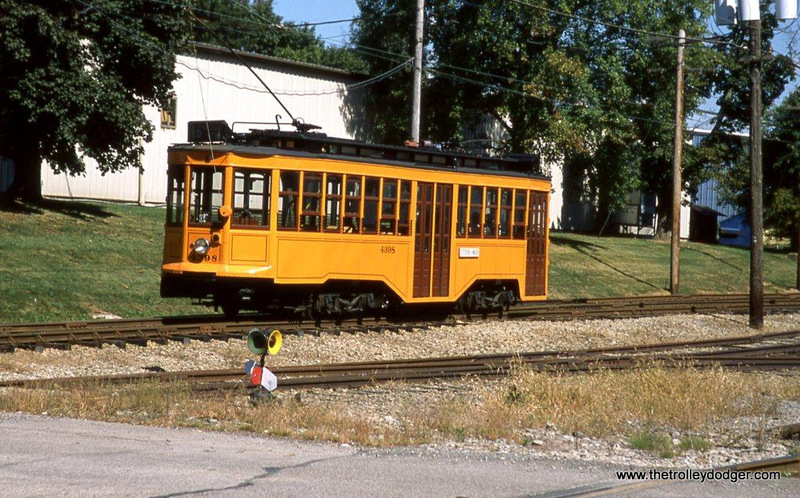 First, we will look at the earliest beginnings of streetcars in Milwaukee thru the 700 series cars. 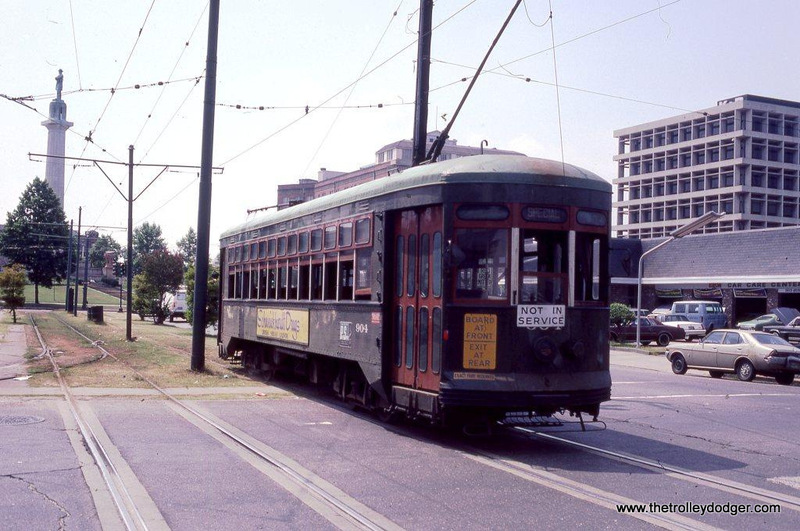 In the final years of streetcar operation by The Transport Company (The Milwaukee & Suburban Transport Corp. which bought out TMER&T in November of 1952), only the 800 and 900 series streetcars were left and those are the cars I rode. Being only 7 years old when the cars quit I obviously did not keep any record of which cars I rode. 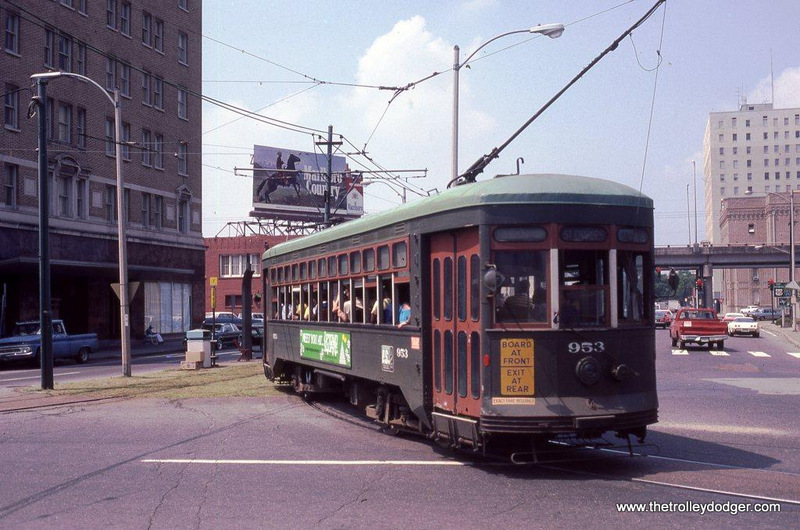 To me, a streetcar was a streetcar! 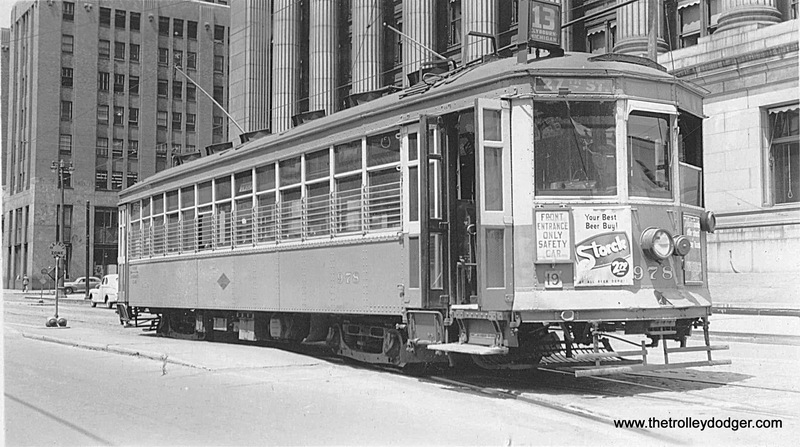 Like most cities, Milwaukee streetcars were horse-drawn or cable cars before electrification. 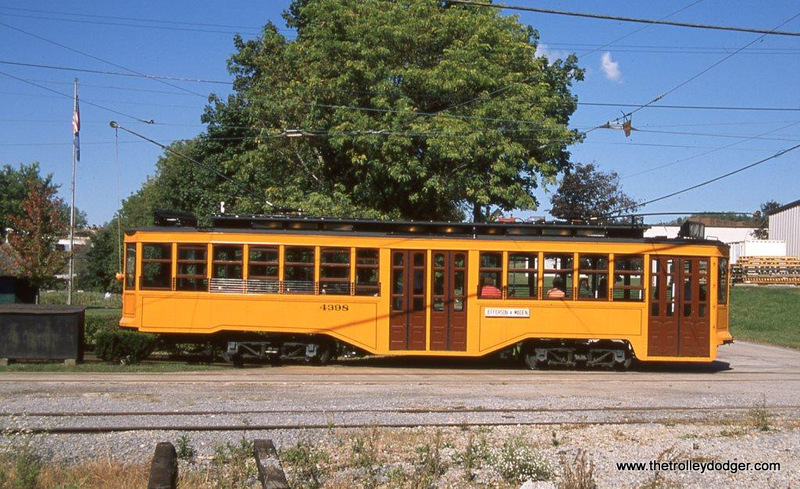 Milwaukee had several independent systems, such as the Milwaukee City Railway Company (March 1865), the West Side Street Railway Company (July 1875), and the Milwaukee Cable Railway Company (December 1887). 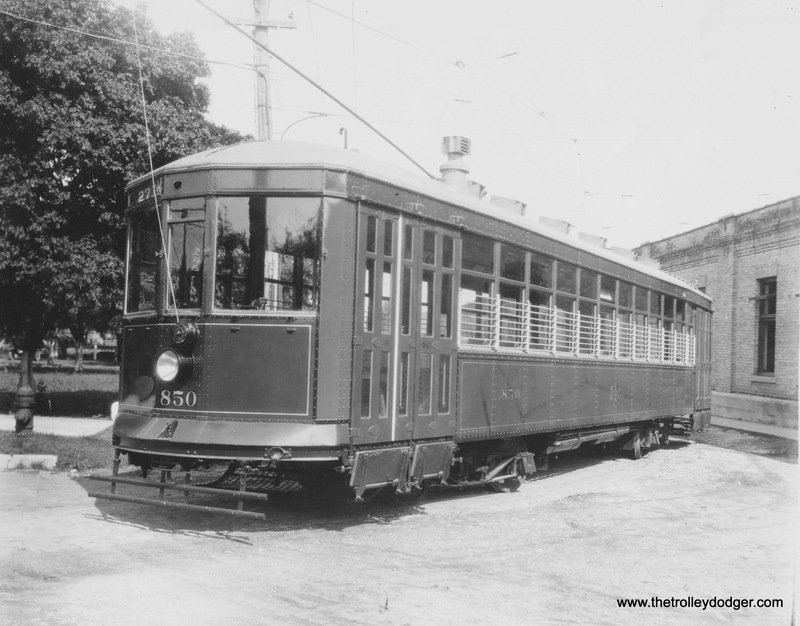 The very first electric streetcar line was operated by the West Side Railway Company on test run over their new Wells-Wisconsin line on April 3, 1890. 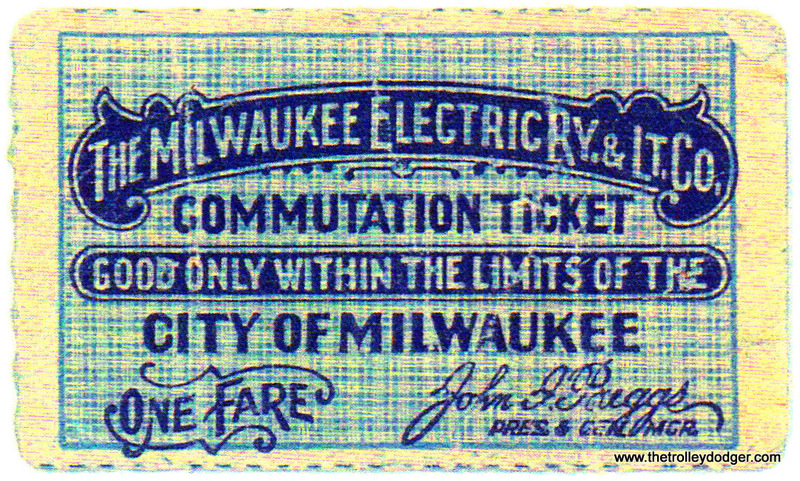 After various sales, takeovers and consolidations, electric streetcar service in Milwaukee was taken over by the newly formed The Milwaukee Electric Railway & Light Company on January 29, 1896. 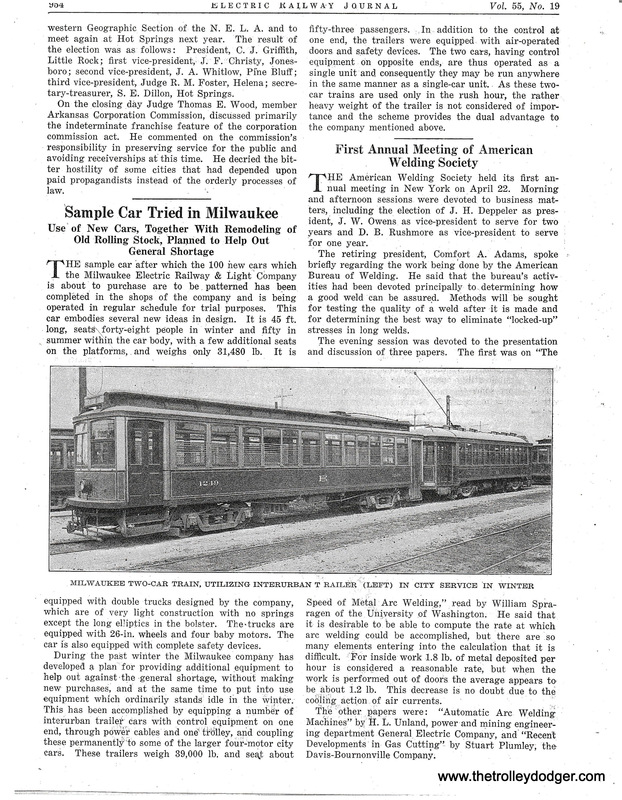 From that day until September 23, 1938 when TMER&L was split into two companies because of the 1935 Utilities Holdings Act (which declared companies providing both electric power and transportation monopolies had to divest one or the other), TMER&L would operate all streetcar and interurban service in Milwaukee. 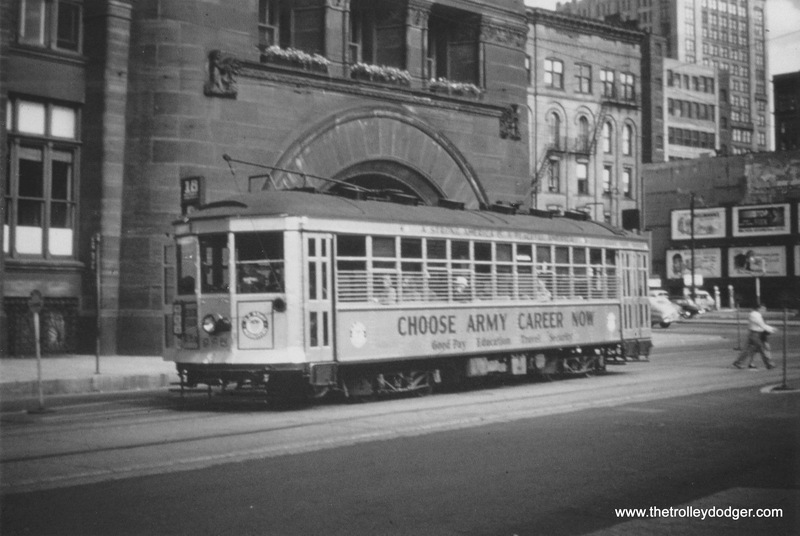 Thereafter, the newly formed The Milwaukee Electric Railway & Transport Company (or “The Transport Company” for short) took over all rail operations as well as trackless trolley and bus service. Both TMER&L and TMER&T always insisted on use of the definite article as part of their company name. 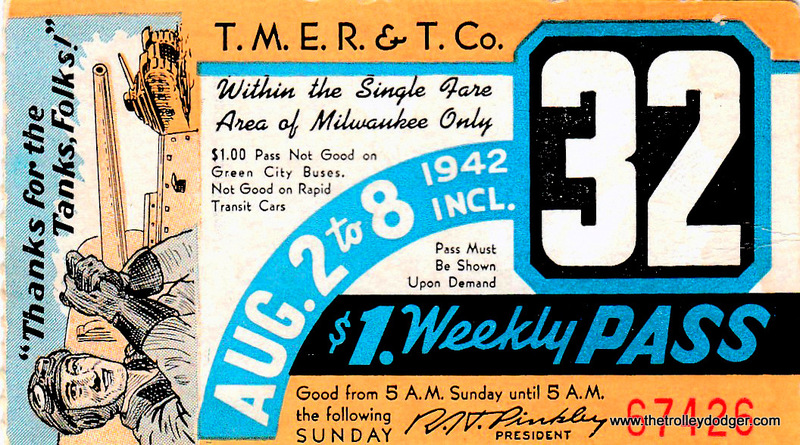 In November 1952, TMER&T was sold to a group of investors from Milwaukee, Chicago and Indianapolis. 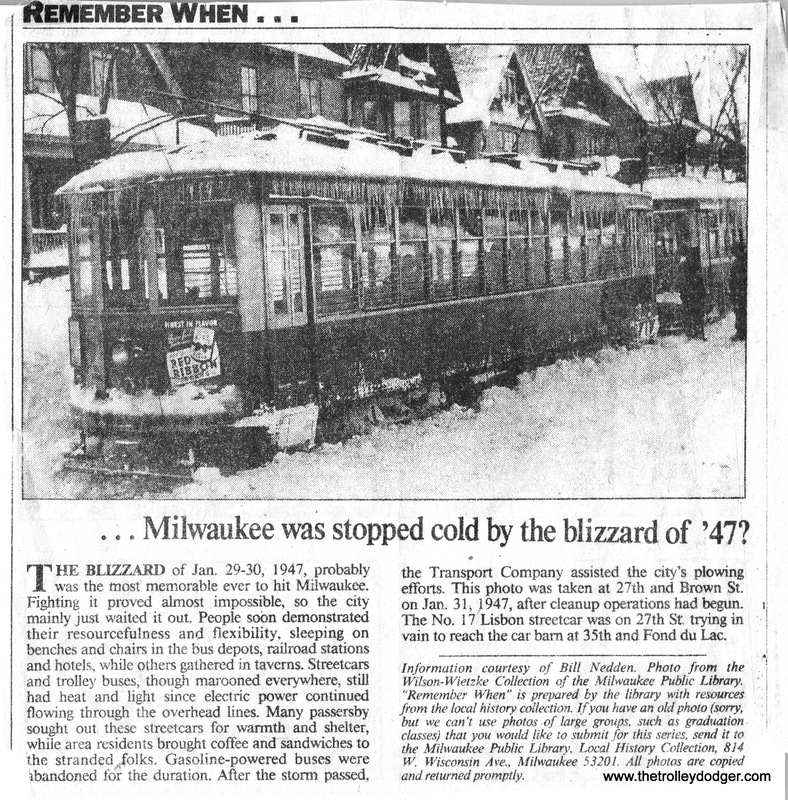 The newly formed Milwaukee & Suburban Transport Corporation continued to use “The Transport Company” appellation until municipal ownership finally came to Milwaukee with the formation of the Milwaukee County Transit System in July, 1975. TMER&T had initially offered the city of Milwaukee “first crack” at buying it out but the city was not interested. The “Transport Company” name became so ingrained in the minds of the riding public that it was several years before the new MCTS name caught on. 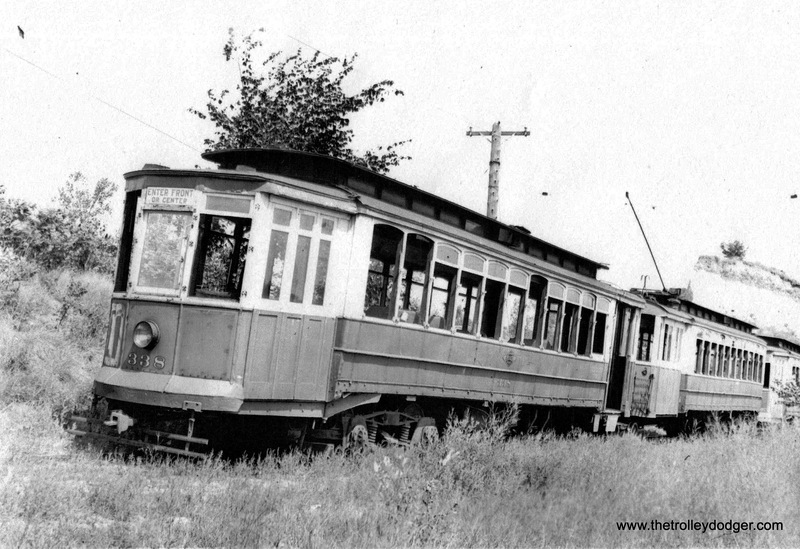 TMER&L was well aware of its “horse car roots” and actually preserved a horse car. It was on display on the second floor of the company’s corporate headquarters in the Public Service Building on North 2nd and West Michigan Streets for many years. 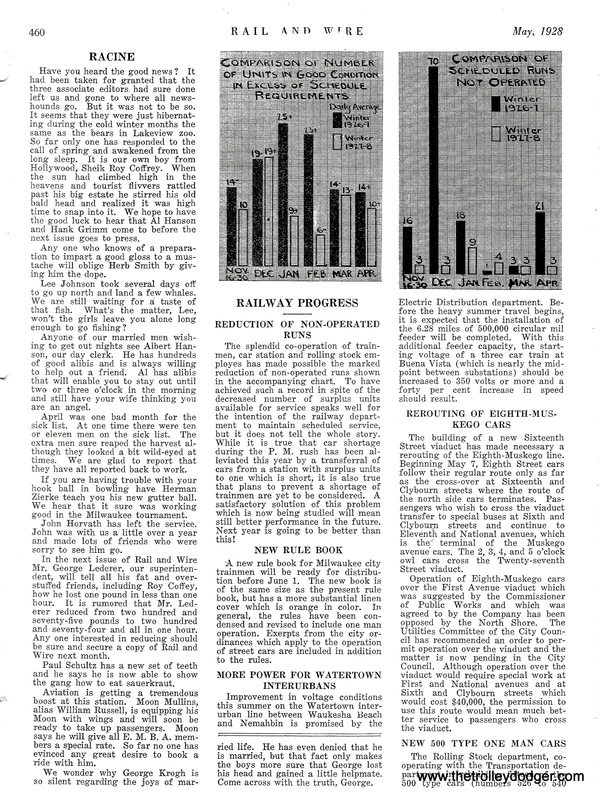 It would be brought out on special occasions, such as this city celebration as shown in this 1921 article from the Electric Railway Journal. 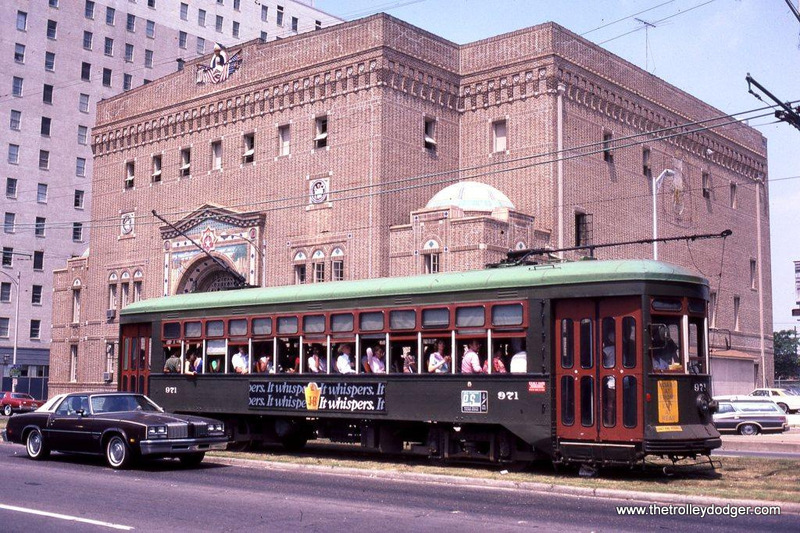 A photo of one of Milwaukee’s first electric streetcars graced an MCTS weekly pass in the 1980s. 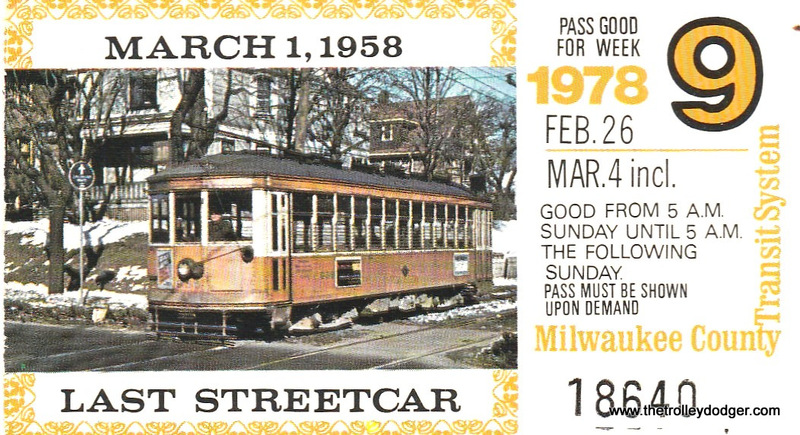 Other events such as the 20th anniversary of the “last streetcar” were commemorated on this 1978 weekly pass. 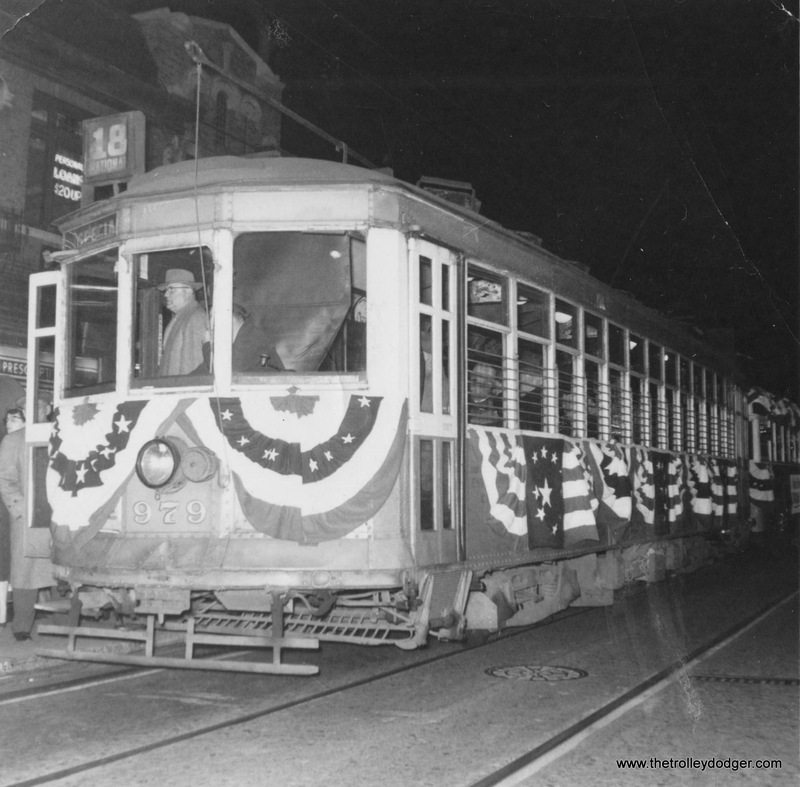 It has taken 60 years, but streetcars are coming back to Milwaukee starting this Fall. The new 2.3 mile Milwaukee streetcar circulator line is expected to begin service on November 25th of this year. A 0.75 mile extension to the lakefront and Summerfest grounds is slated to follow in 2019. The new streetcar will be called “The HOP”. Thanks to Potawatomie Hotel and Casino, the first year of operation will be free. The line will begin at 4th and St. Paul Avenue, adjacent to the Milwaukee Intermodal station which will be handy for anyone coming up to Milwaukee from Chicago on Amtrak or from the west on the Empire Builder. Apparently, Way had joined the ERPCC thinking it was going to provide ways to improve existing streetcars not build an entirely new car. 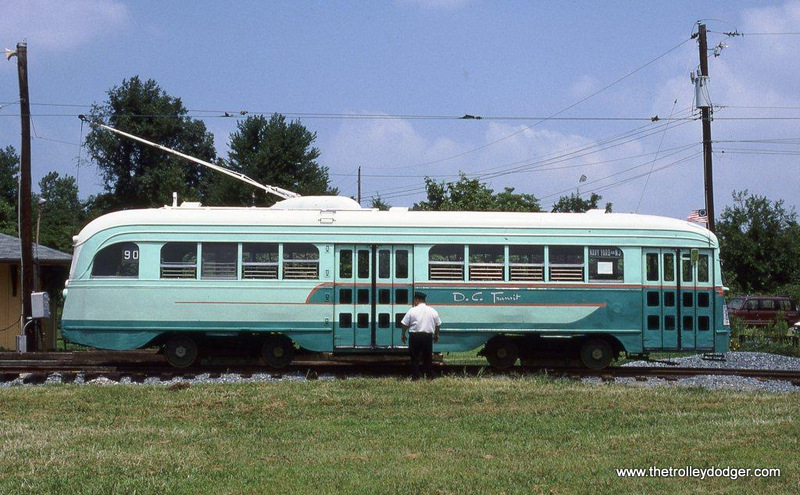 Every streetcar TM ever built or bought was double-ended. This eliminated the need for turning loops at the end of the lines. 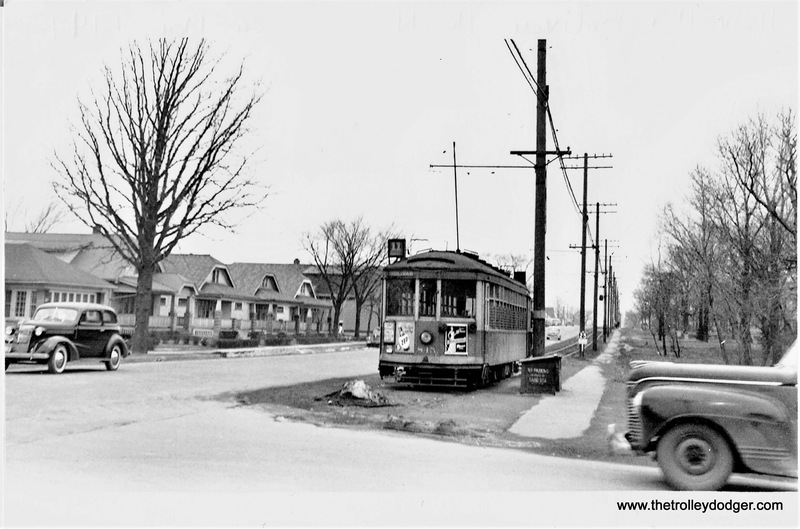 If TM were to have purchased PCCs they would have been faced with two alternatives; either build turning loops at the end of every streetcar line (completely impractical if not impossible in quite a few locations like Harwood Ave. and 70th & Greenfield on Rt. 10 or Delaware and Oklahoma Aves. at the south end of Rt. 15). This would have left TM with but one other option; buy double-ended PCCs . Then there were all of the various patent and licensing fees connected to the PCCs. TM was notoriously cheap. S.B. Way would not hear of it! When Way said that some companies just weren’t in the business he was probably referring to TM. 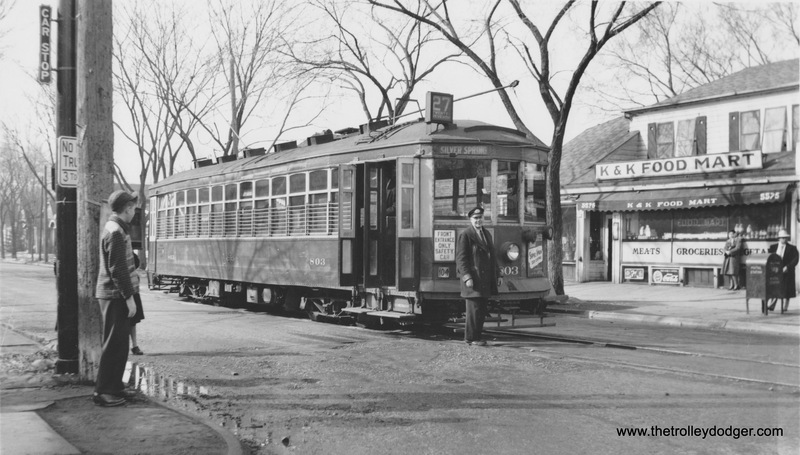 By the time the first PCCs went into service on the Brooklyn & Queens Railway in New York in 1936 TM had turned its back on streetcars. The management had fallen in love with trolley buses and conversions from rail to rubber soon started. The corporate split in 1938 only exacerbated the matter. 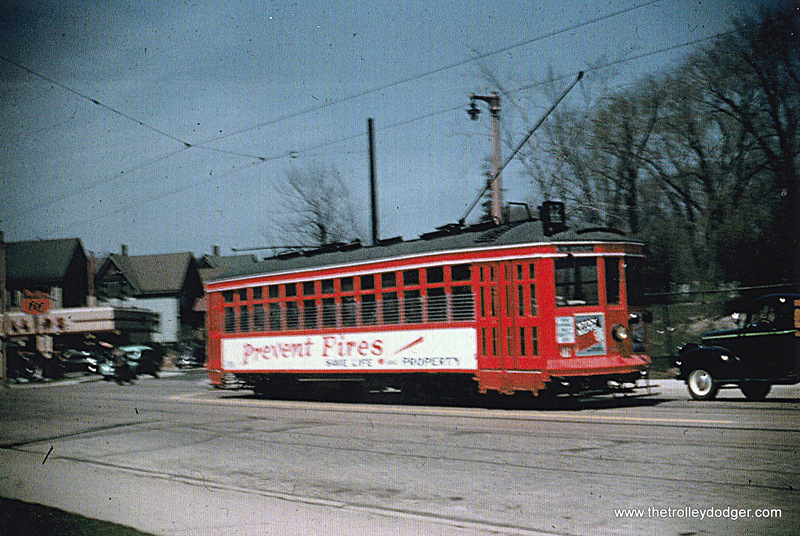 Had it not been for the intervention of WWII streetcars in Milwaukee would have been history long before March 1958. And even if TM had purchased PCCs, it would done little to change the anti-rail sentiment that prevailed from 1936 on. TMER&L was noted for their frugality. 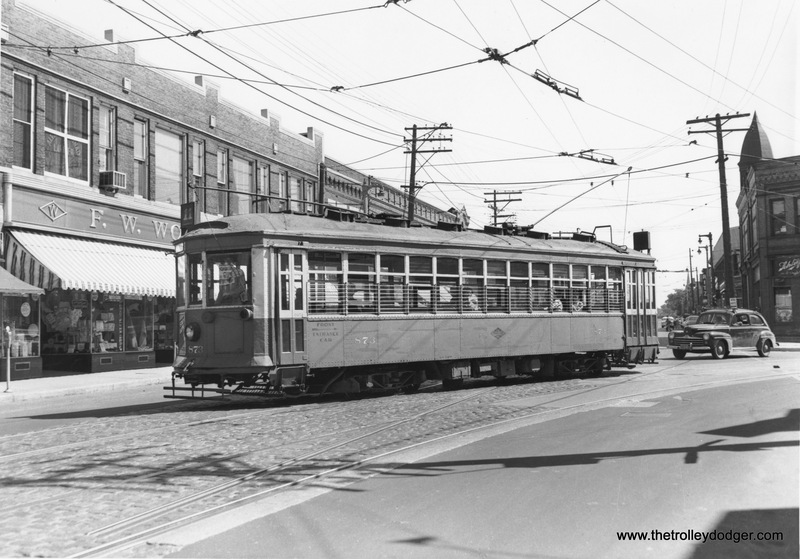 As such, they were very fond of articulated streetcars dating back to the early 1900s. 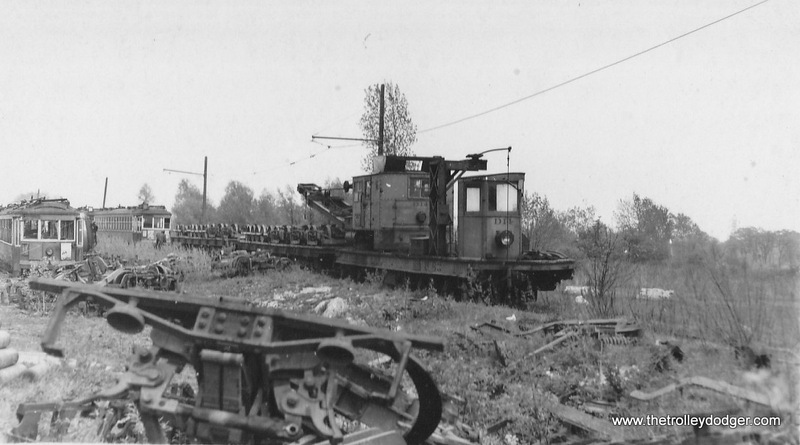 Here we see unit 338-339 awaiting scrapping at the Waukesha Gravel Pit in 1948 photo by TM Motorman Ed Wilson. 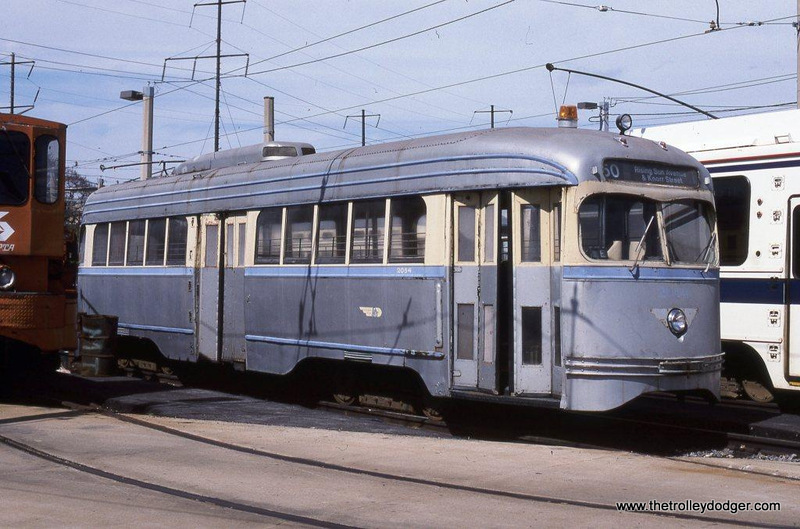 All Milwaukee streetcars thru the 700-series met their end at the gravel pit, until the demise of Speedrail in June 1951. The last cars scrapped here were those belonging to Speedrail between March and October 1952. 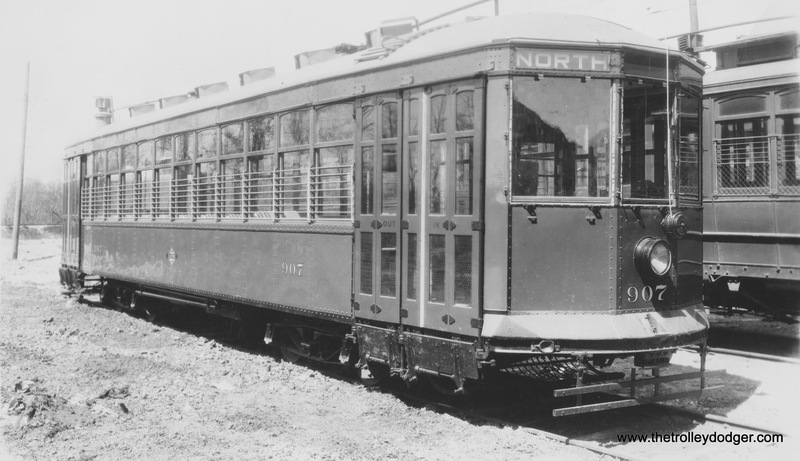 The first 500-series car debuted on April 30, 1911. 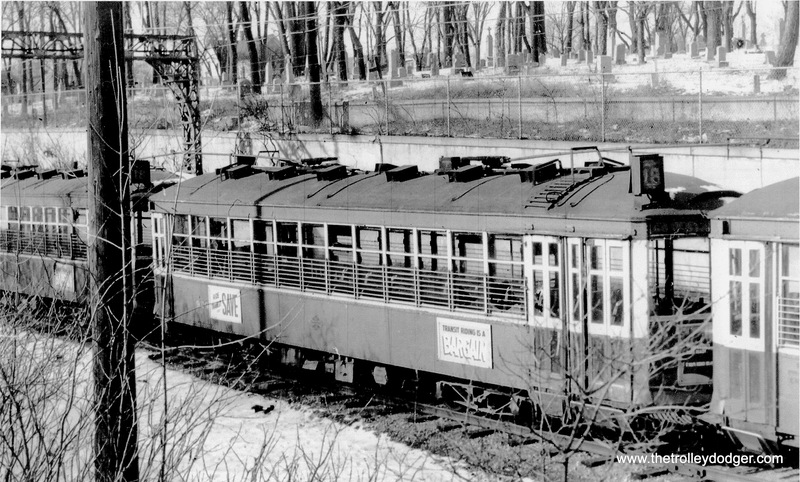 Initially built to be two-man cars they were first assigned to the Wells- Downer Line (Route 10). 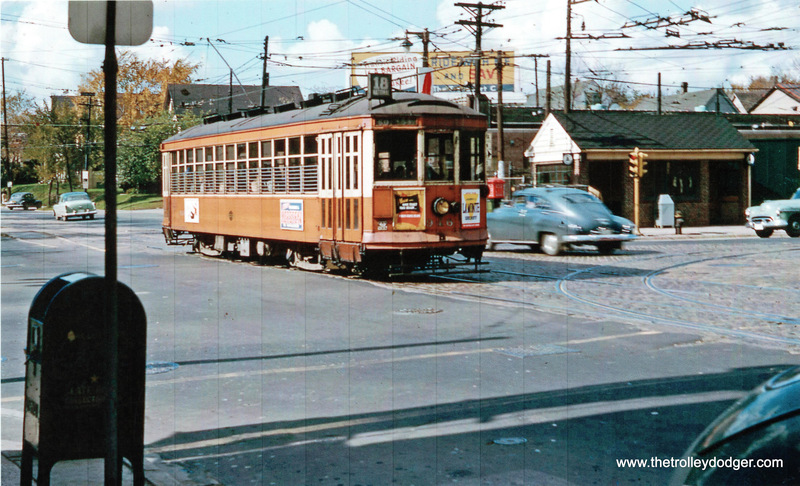 Rumor is that in retaliation for resident complaints about noisy streetcars, TM President John I. Beggs (who designed the cars) ordered the floors to be constructed of 6 inch thick concrete. But according to historical research, that rumor was not true. These would be TMs last deck-roofed cars. 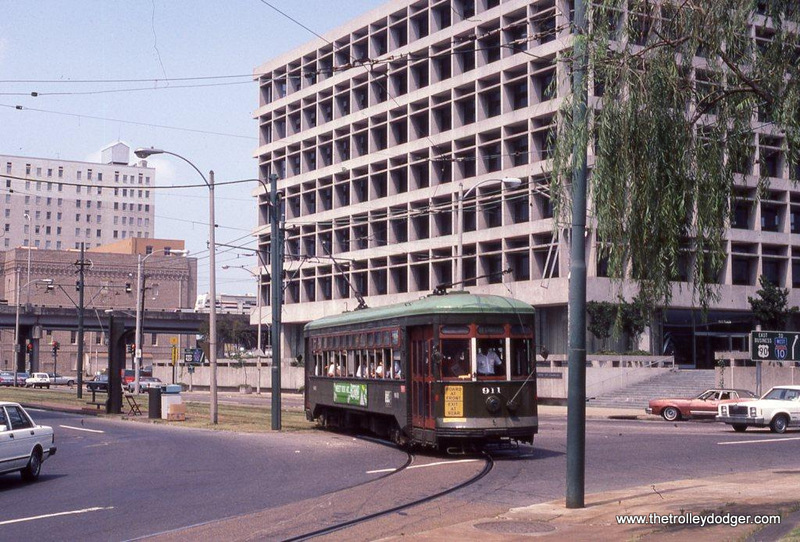 From this point on all Milwaukee streetcars would have arch roofs. In the early ’20s TM became committed to one-man operation and began converting the 600s by removing the large pot-bellied stove from the front platform and installing electric heating. 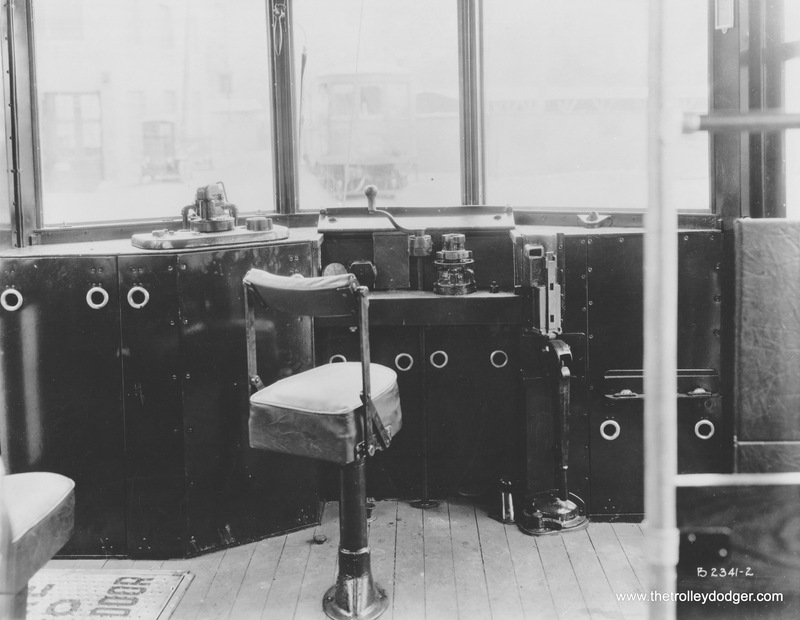 Controls and door arrangements were also redone to permit one-man operation. The conversion to one-man service was not without its problems. 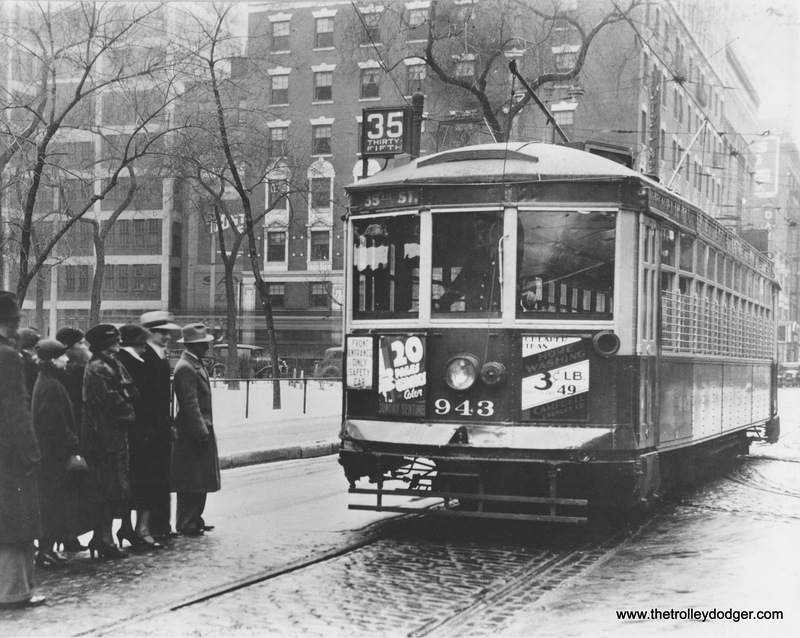 In 1921, the City of Milwaukee actually swore out a complaint against TM company officials claiming that the conversion to one-man operation of streetcars violated a 1919 city ordinance forbidding the operation of any streetcar by less then two men. 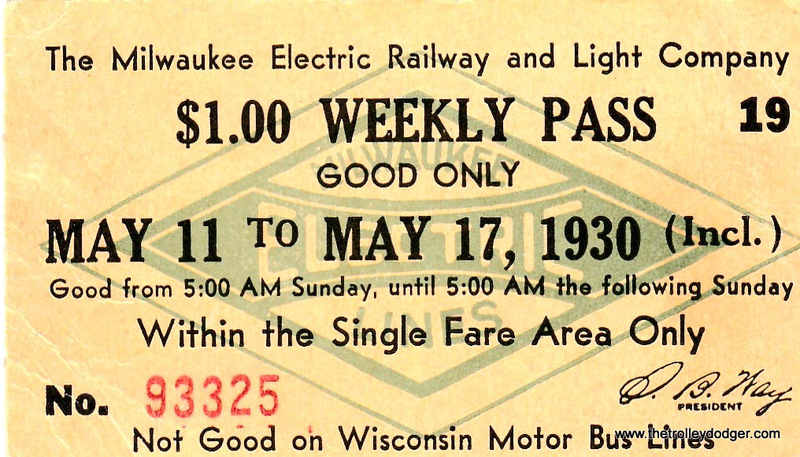 TMER&L fired back by showing that the Wisconsin Railroad Commission, the state body that oversaw all rail operations in the state (and predecessor to the Public Service Commission of Wisconsin which it became in 1930) had approved one-man operation. 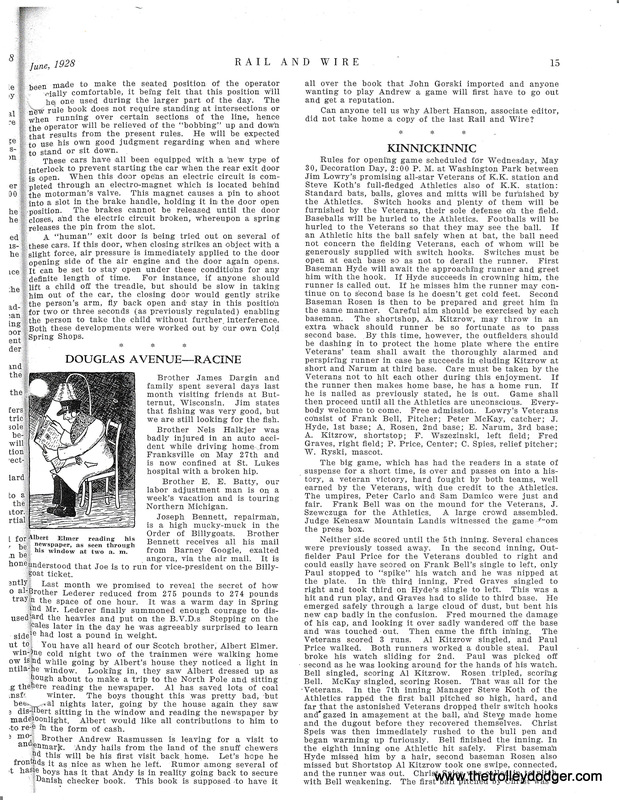 The accompanying articles from the company’s house organ “Rail & Wire” show how the 500s were converted into one-man cars. Note the fare box (item 15) seen in one of the photos. These were homemade fare boxes and they lasted into the MCTS era. 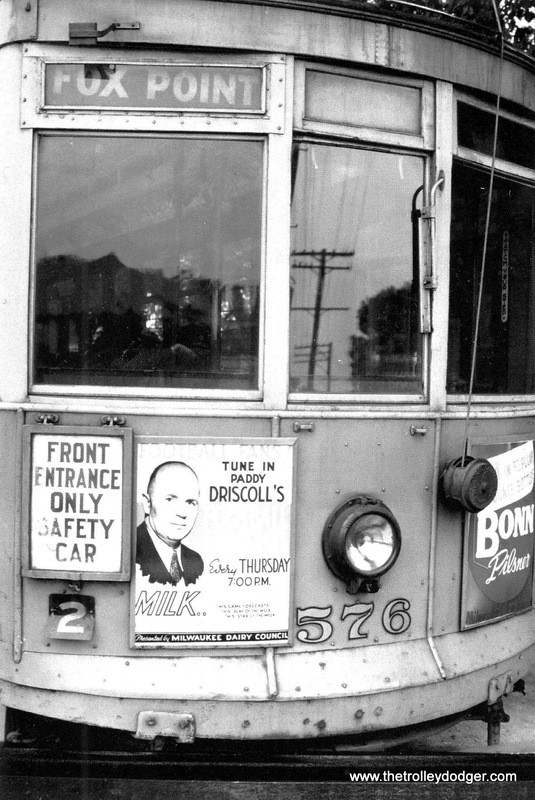 On the front of the fare box was a metal sign which read “PASSENGERS PLEASE PLACE FARE IN BOX. CONDUCTORS NOT PERMITTED TO HANDLE FARE.” I often wondered what bus riders unaware of Milwaukee transit history made of the sign. Eventually, MCTS pasted a sticker over the sign. 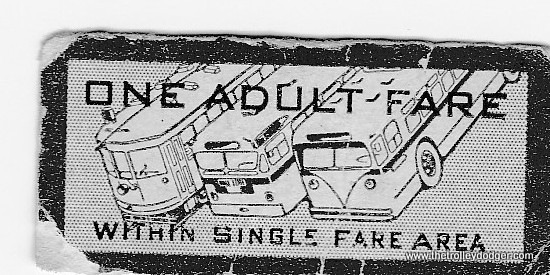 These fare boxes became unusable after fares topped $1.00, as they were not designed to handle paper money which caused them to jam. 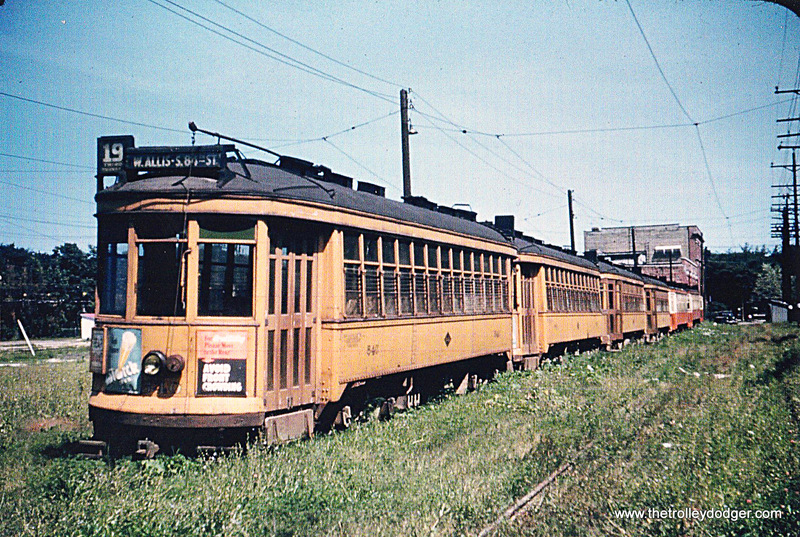 The 500-series cars were all scrapped between 1948 and 1952. 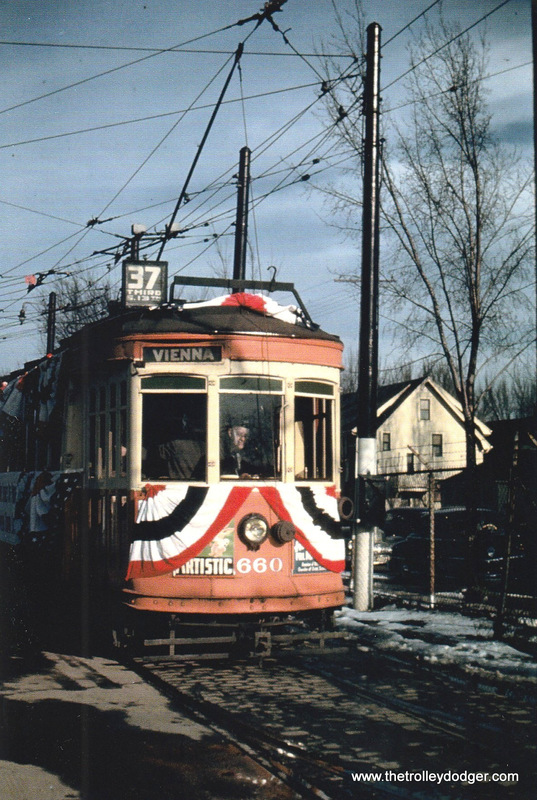 The lone survivor was car 523 which operated on the Lakeside Belt Line shuttle until 1954 when it was replaced by car 882. 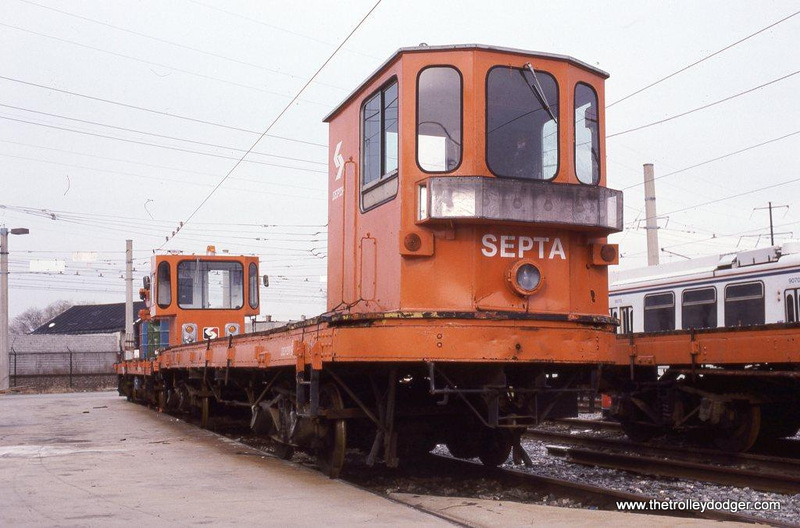 Then 500s, by the way were the first streetcars to wear the new orange and ivory paint scheme adopted for one man cars. TM 600s and 500s awaiting scrapping at Oakland Station in 1949. TM 576 Front close-up on Route 15. 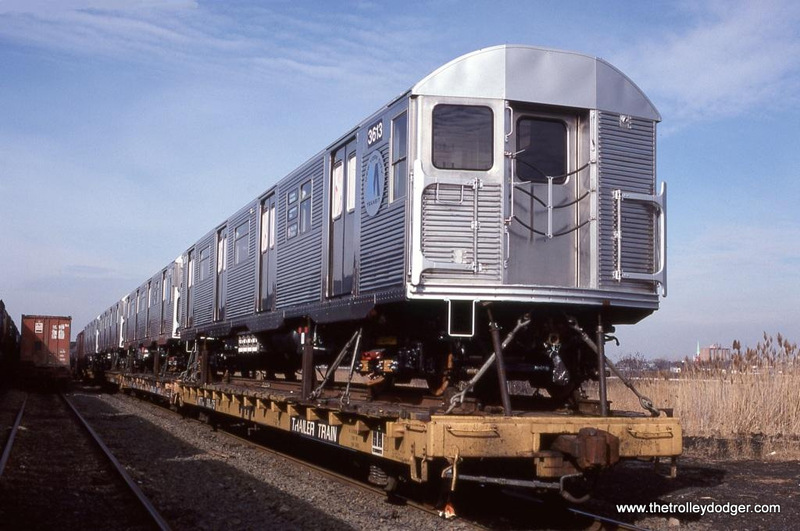 The 600-series cars were less than half the length of a 500. 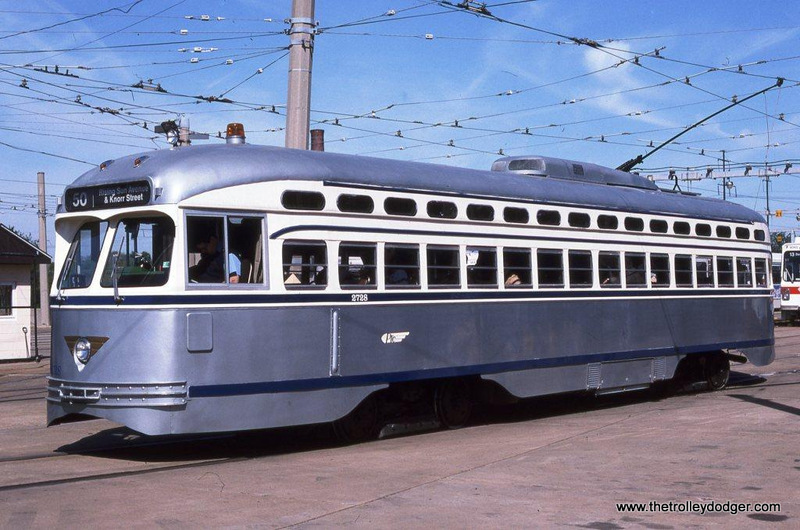 Of the 60 cars in this series, 30 were built in TM’s Cold Spring Shops and 30 came from TM’s streetcar builder St. Louis Car Company. 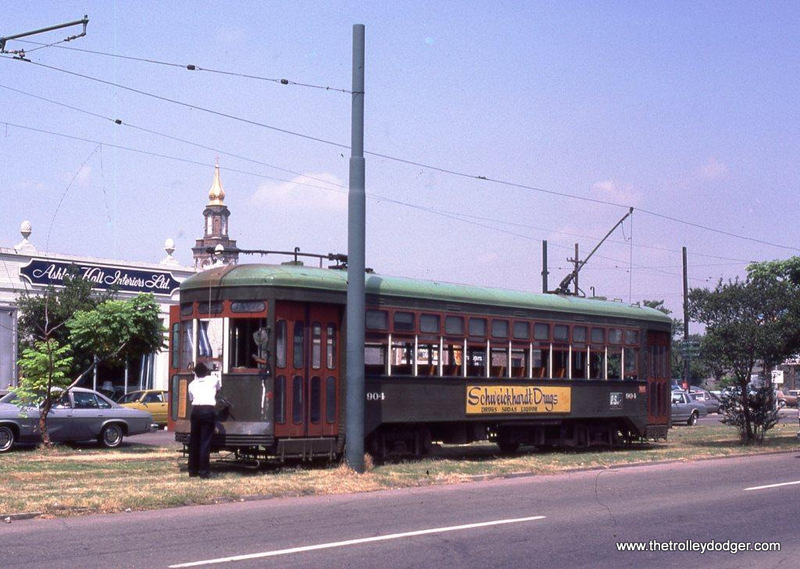 I call St. Louis TM’s streetcar builder because they constructed nearly every streetcar that ran in Milwaukee. What made St. Louis Car Company so much better than other builders like Pullman or J.G. Brill? St. Louis Car Company was part of the North American Company which also happened to be TMs parent company. And after being forced out of TM in 1911 John I. Beggs became president of St. Louis Car Company. He eventually worked his way back into TM in 1920 and served as TM’s president until his death in October 1925. 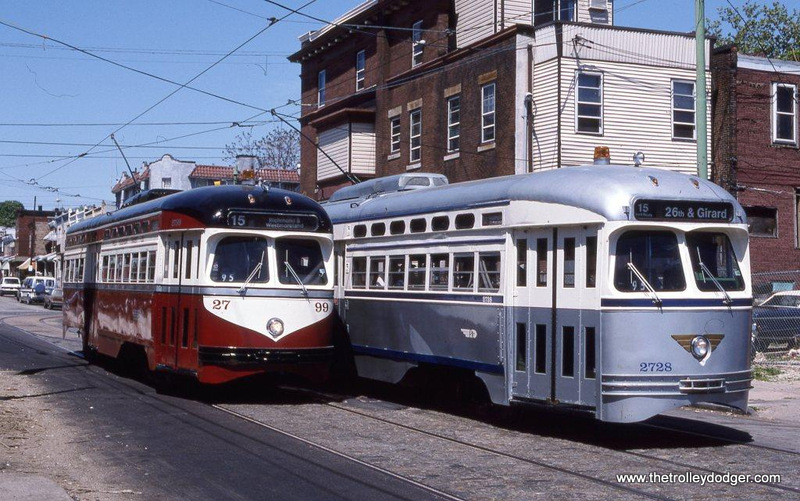 The 600s were among the most ubiquitous streetcars ever built. 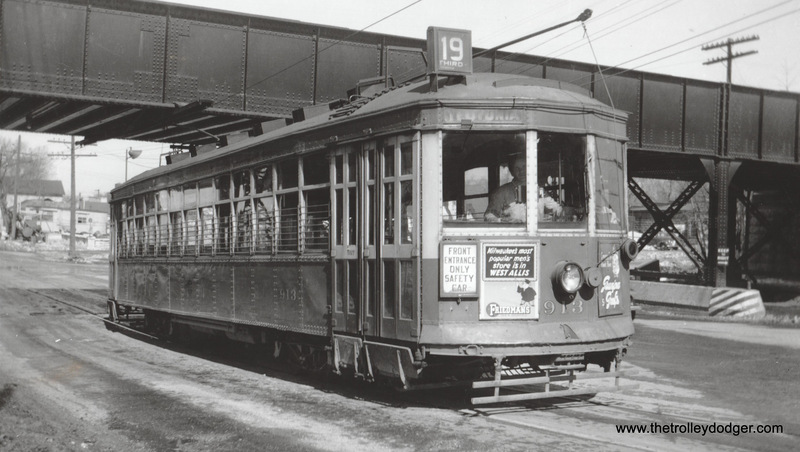 Upon their arrival in 1912 they were initially placed in service on the Route 12 service to North Milwaukee, paired with 1200-series interurban trailers. 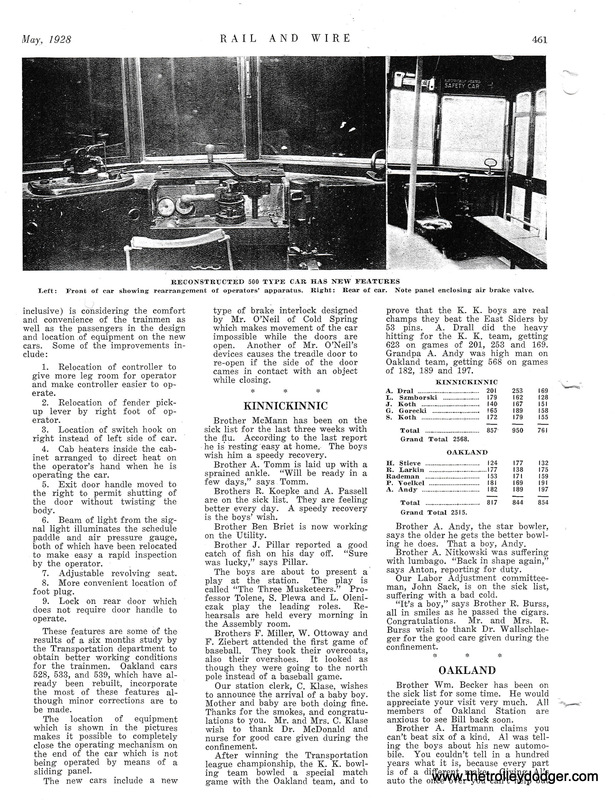 The article reproduced here describes that service and comes from Electric Railway Journal. 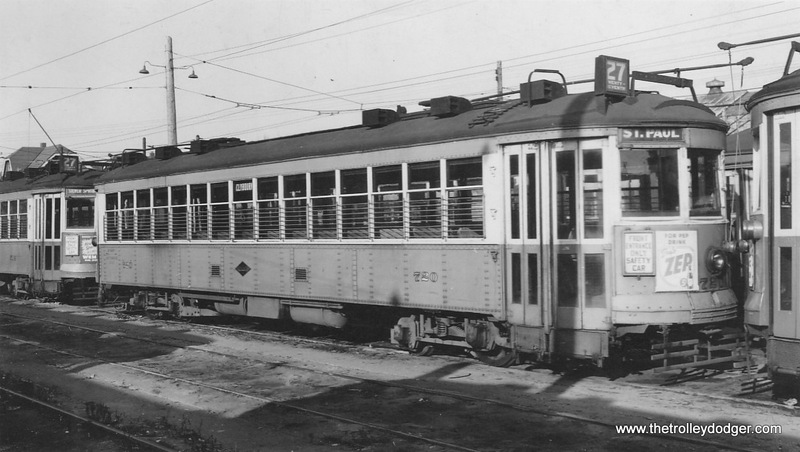 In 1927-28, ten of the 600s (601-610) were upgraded for service on the line to Cudahy and South Milwaukee. 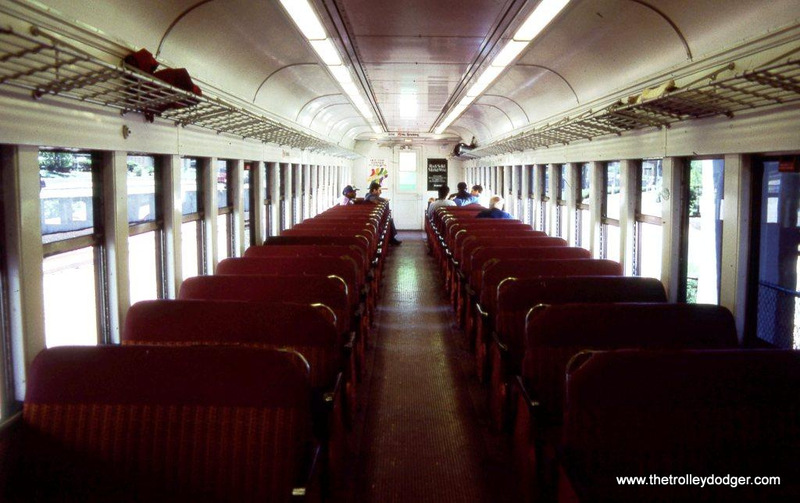 The upgrade included globe lights, smoking compartments and leather seats. 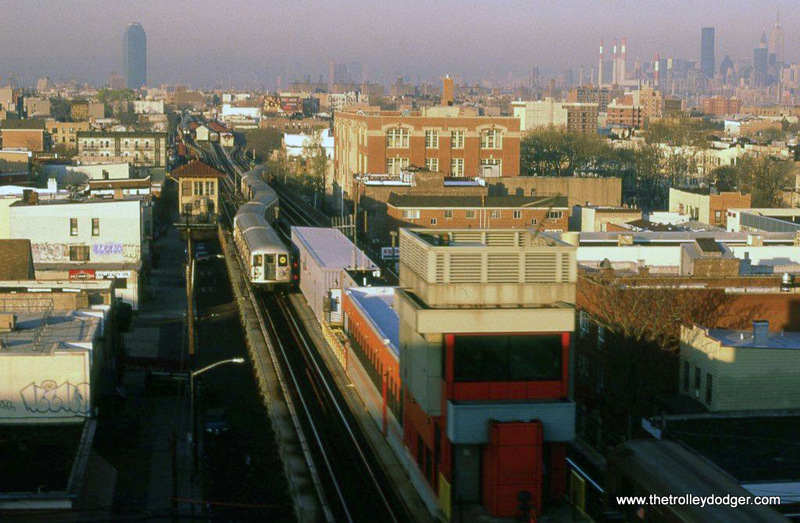 Two cars of this series (604-605) also saw service on the Local West Side Rapid Transit line to West Junction, before the line was completed between 8th and 40th Streets. Like the 500s, TM attempted to convert the 600s into one-man cars but the attempt failed. The platform on the 600-series cars were too small to accommodate both boarding and disembarking passengers. Only seven of the 600s were ever so converted. 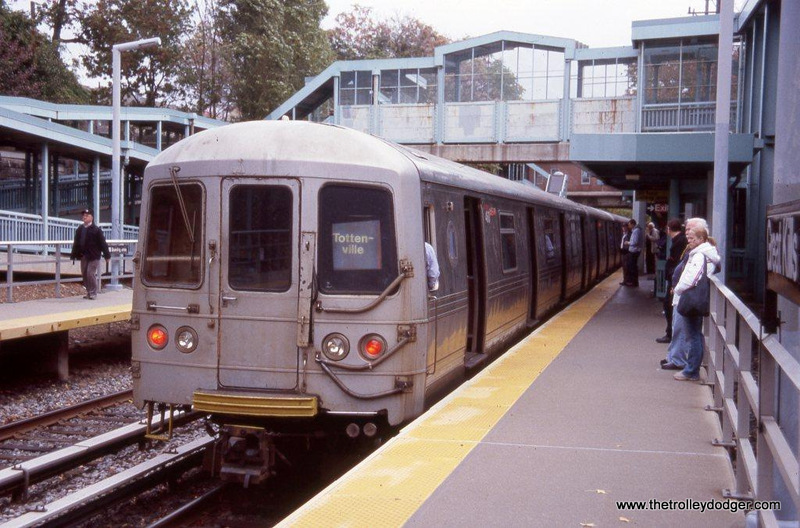 The 600s became the cars seen on Routes 19 and 37 where they proved to be ideal. 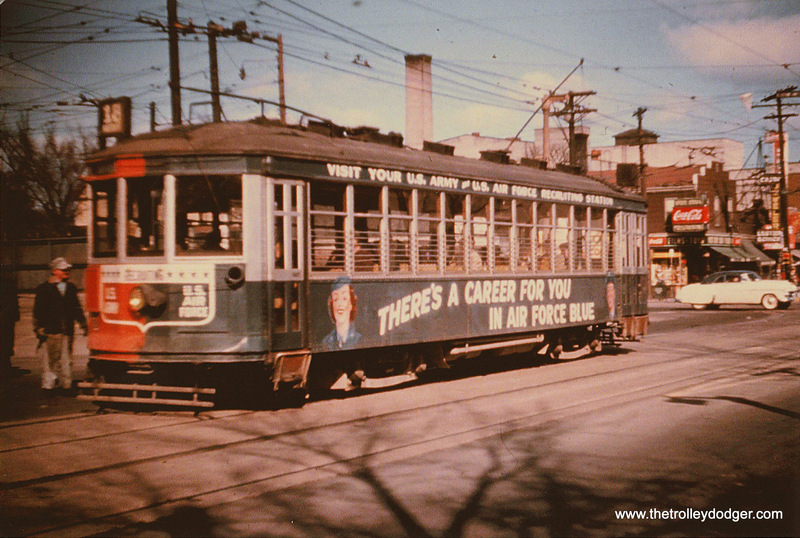 Their days of service came to an end when Route 19 service was converted to trackless trolley operation in March 1948. Three cars initially escaped the scrapper’s torch. 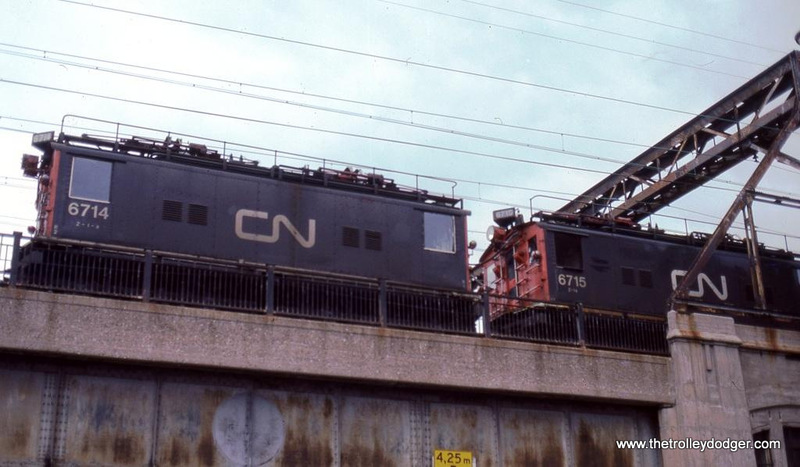 Cars 626 and 636 saw service on the Lakeside Shuttle until they were replaced by 882, after which they too met their end at the Waukesha Gravel Pit. 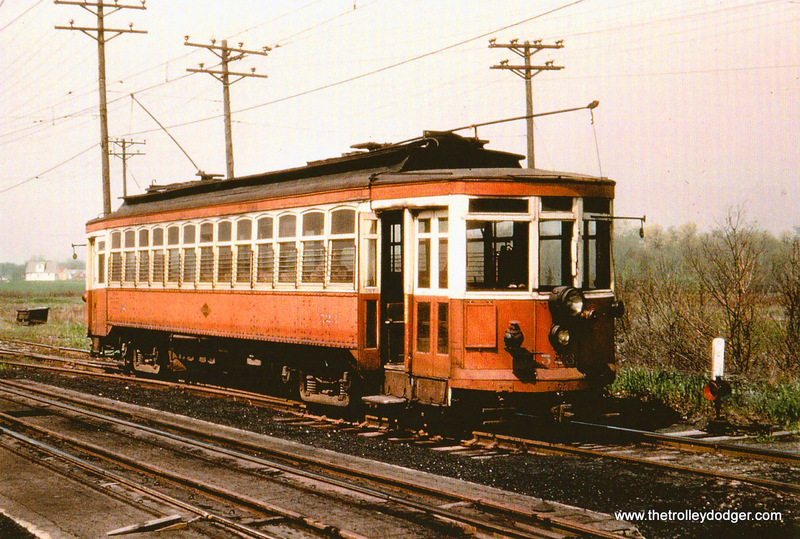 In 1949, car 607 was purchased from TMER&T by a railfan group called the Railroad Historical Foundation. 607 was chosen because it was the last 600 to go through Cold Spring Shops. The car was stored at the yards adjacent to the never-completed subway at 8th and Hibernia Streets. Periodic work sessions were held to restore the car. 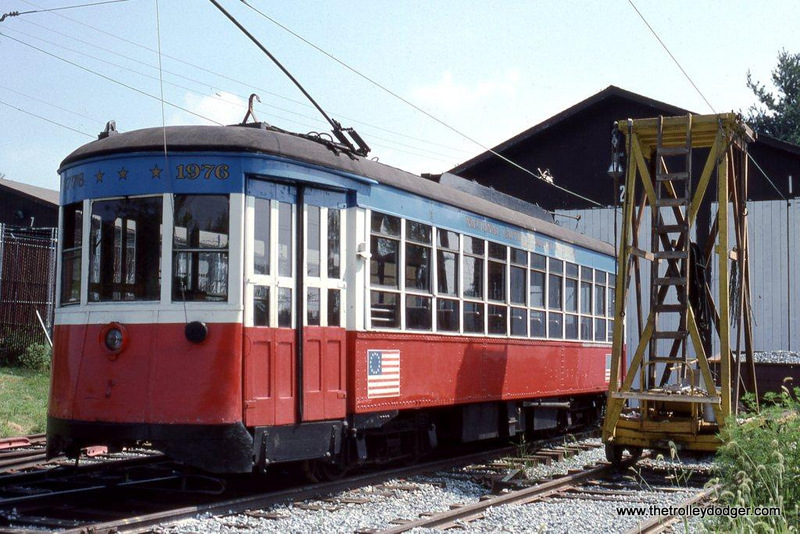 The group’s ultimate goal was to restore the car completely, then move it out to the Municipality of East Troy Railway, where they were hoping to establish a trolley museum. 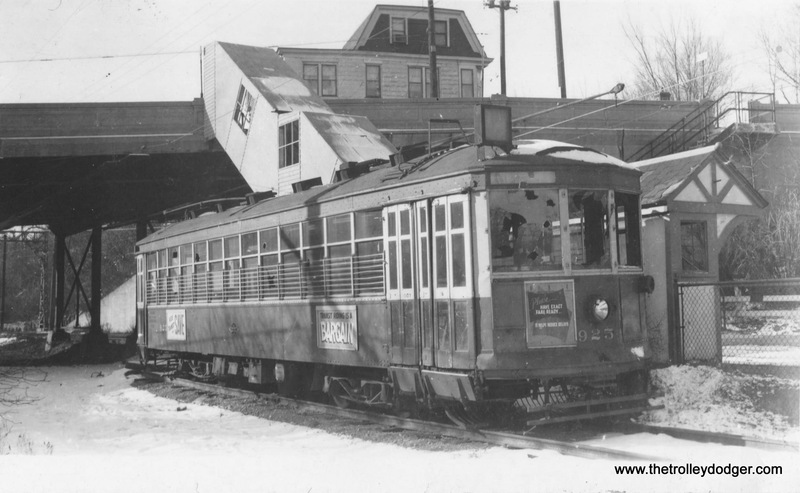 Approximately 3/4ths of the canvas roof had been replaced when Speedrail was abandoned on June 30, 1951. The group was subsequently informed by scrapper Hyman-Michaels Co. that unless the car was removed from the Speedrail property it would be taken to Waukesha and scrapped. With most of the group members drafted into the military because of the Korean War, no one was left to find it a new home and it was sold for scrap. TM 636 on the Lakeside Belt Line shuttle. 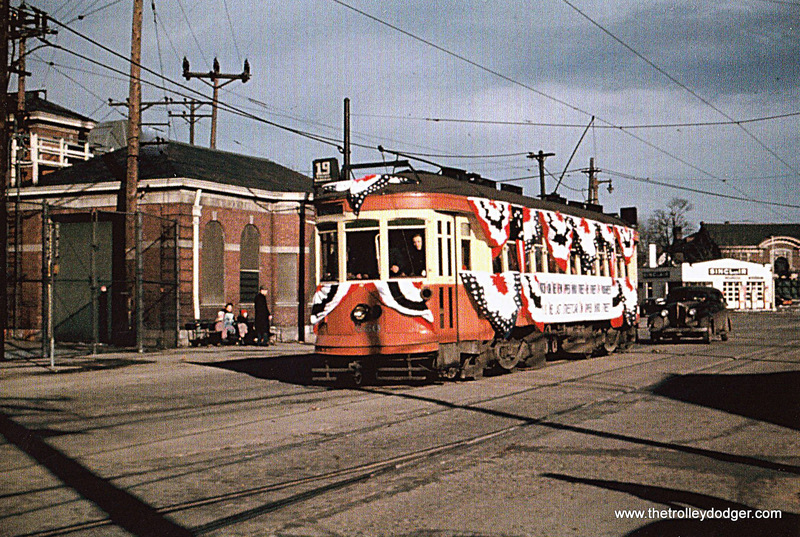 TM 660 at North Side Station, 3-31-48. 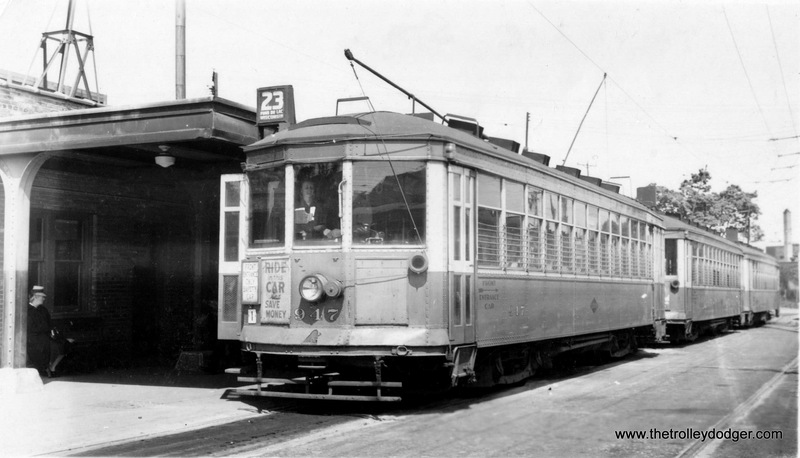 TM 660 at Fiebrantz Station, 3-31-48. 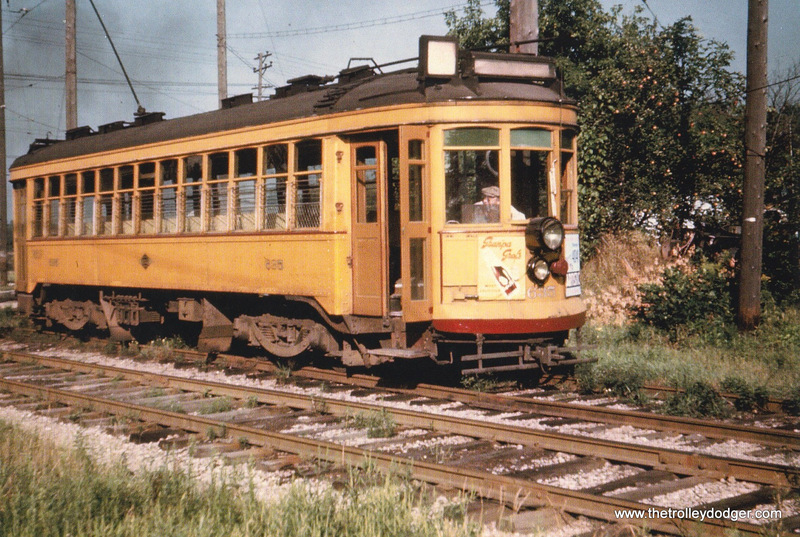 The TM book refers to these as the “awful 700s.” Built in 1917 as center-entrance cars and complete with jumpers for multiple unit operation in trains of two or three cars, they represented a radical shift in Milwaukee streetcar design. They were apparently ill-suited to TM’s needs from the start. 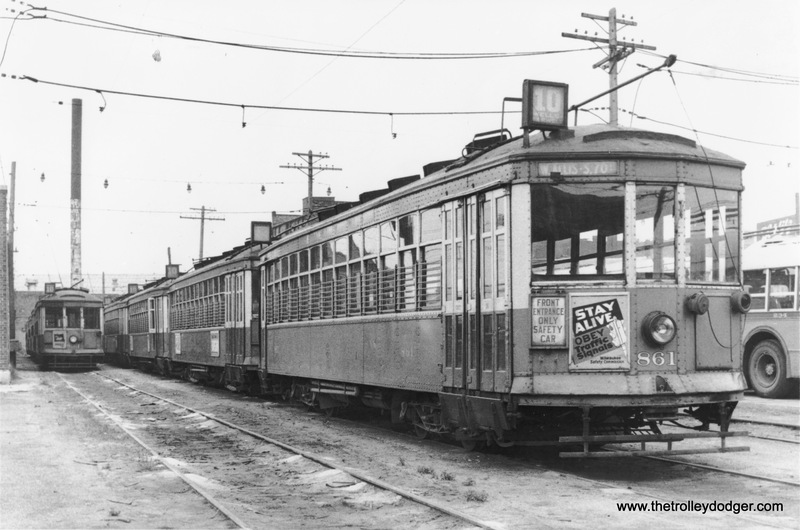 The 700s were rebuilt as one-man cars in the 1920s. This involved removing the center doors and raising the level of the floor. End doors were added and m.u. controls removed. 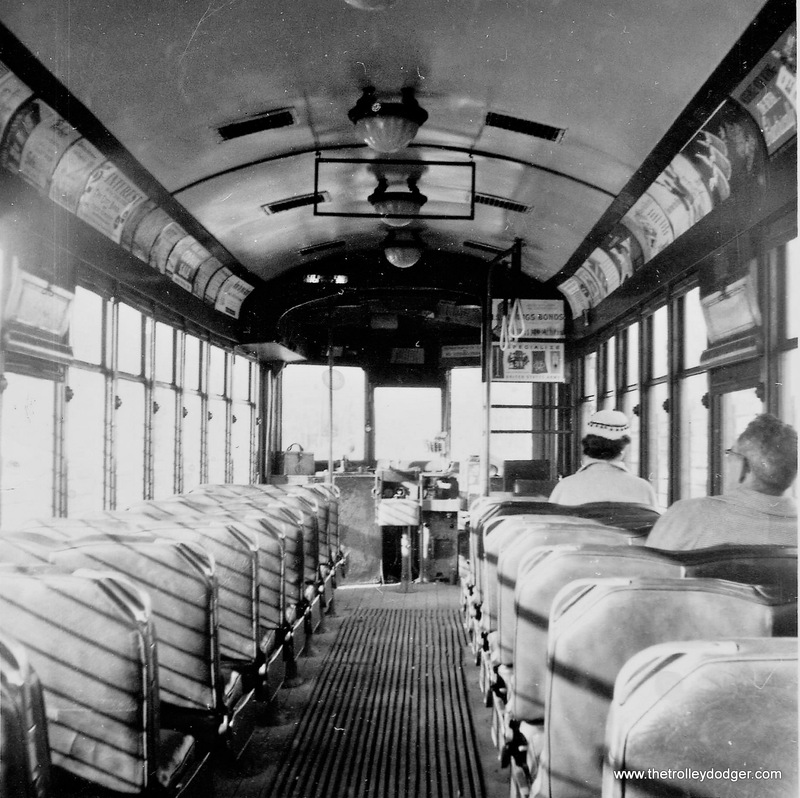 As bus substitutions for streetcars increased the cars saw use only in rush hour tripper service. All were retired by 1953. A 900 and a snow sweeper stuck in a drift on West Lisbon Avenue in 1947. 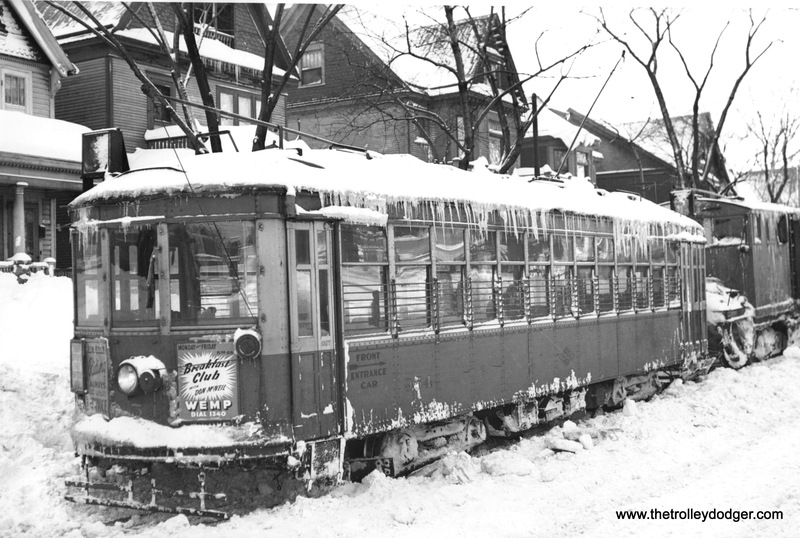 I originally identified this as an 800 stuck in a snowdrift on Lisbon Ave. in the famous Blizzard of ’47. I just ran across the collection of “Remember When” articles that used to run in the Milwaukee Journal and found the same picture. 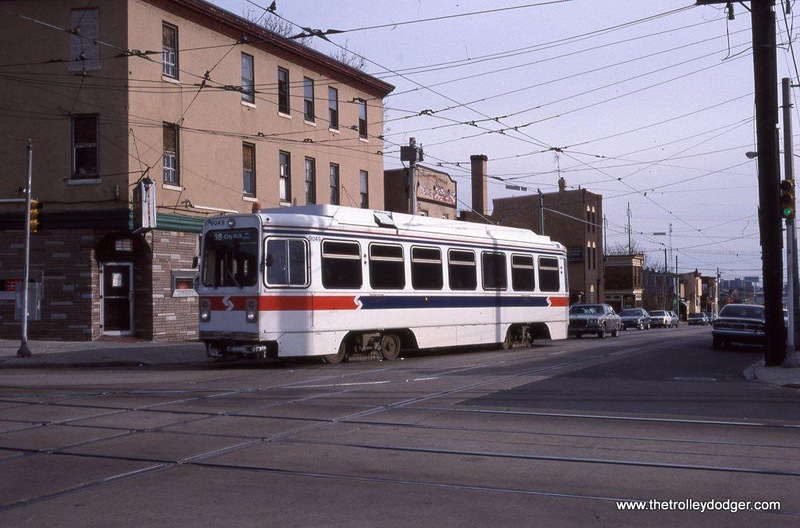 It looks like it’s a 900 and the caption says it’s stuck on 27th & Brown. If you can’t see the center window of an 800 or 900 head-on, it’s hard to tell which it is. TM 916 is eastbound, passing National car station at 27th and National. The front platform of a TM 900. 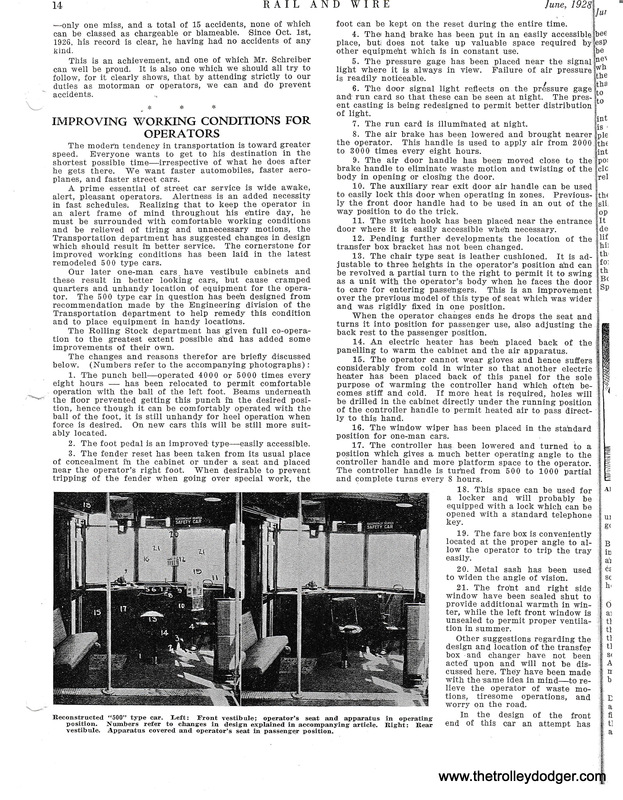 With the conversion of so many streetcar lines to either trolleybus or diesel bus operation by this time, The Transport Company (M&STC) found itself short of space at several car stations for new GM diesel and second-hand Marmon-Herrington trolley buses. 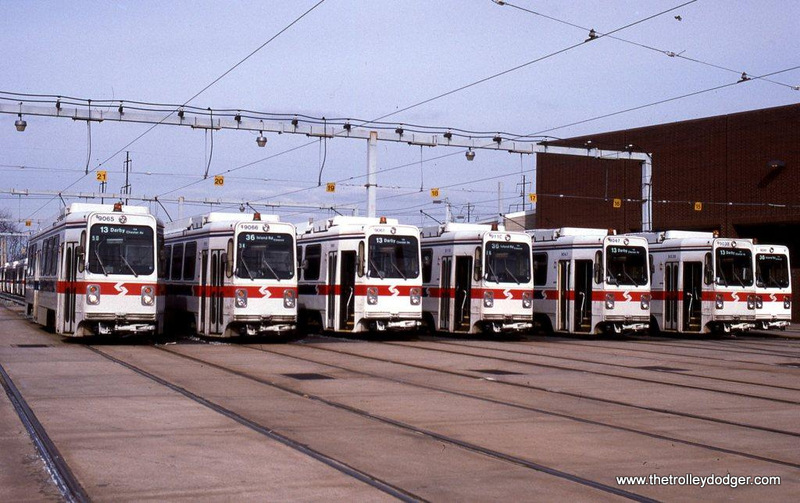 A decision was made to move about ten surplus streetcars to the County Stadium storage track. 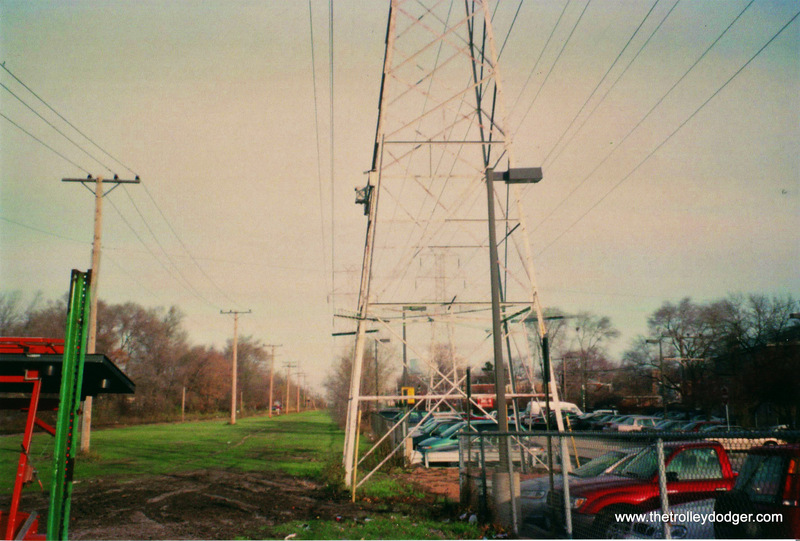 This was not a scrap line, but merely what the company thought would be a safe, out-of-the-way place to store cars. 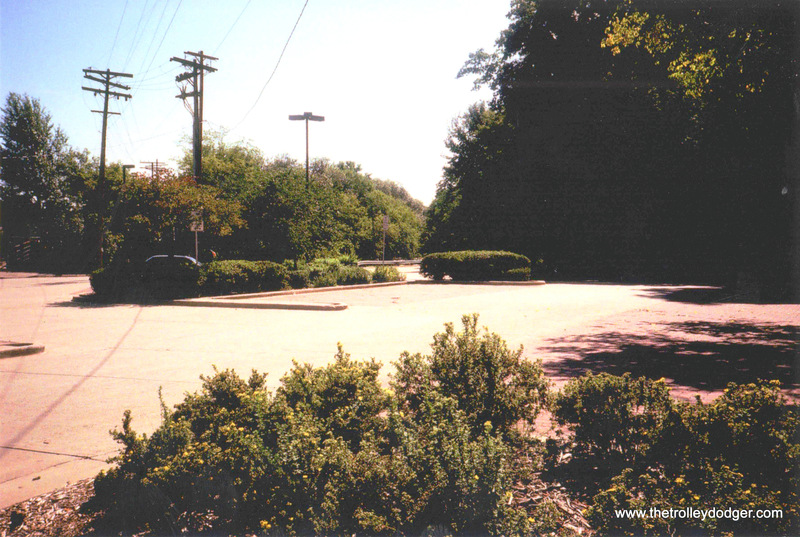 They incorrectly assumed that with no one living nearby, the cars would go undisturbed. In the first photo car 925 shows just how “undisturbed” the cars were. Note the many holes in the front windows. The abundance of ballast on the right-of-way provided sufficient ammunition for vandals who just couldn’t resist sending rocks through the car windows. Other cars like 929, seen in the second photo as well as 933, were also part of this group. 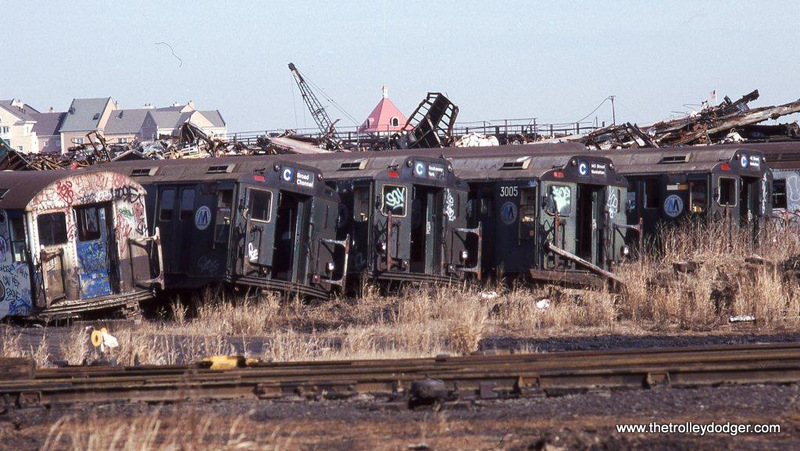 According to former Milwaukee resident Al Buetschle who saved TM 978, the end result was that all ten cars went to the scrapper after being stored in the Calvary Cemetery cut on the stadium spur. 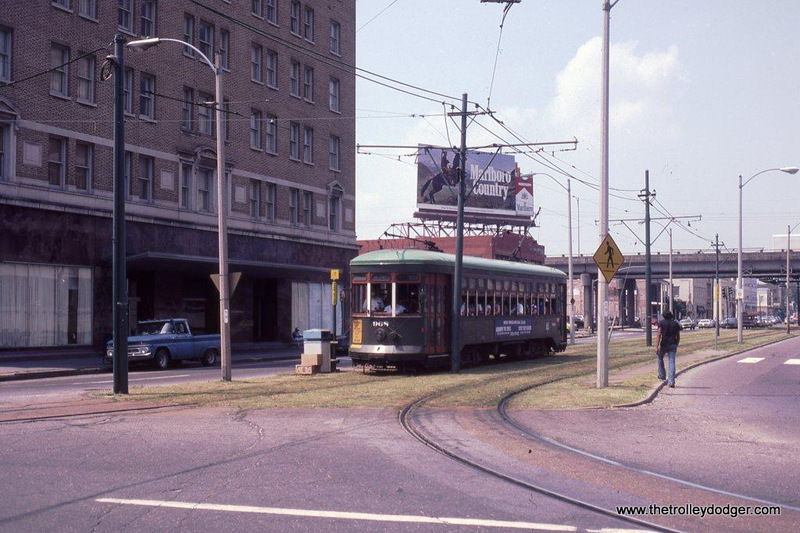 I remember the first time we were going downtown after streetcar service ended in March ’58. She reached into her purse and tore off a car check for herself and one for me. The ones I recall had a drawing of a streetcar, trolleybus and diesel bus on one side and “The Transport Company” in the companys diamond logo on the reverse. I asked if we were going to ride the streetcar again . After all, how could you have car checks with0out streetcars? She said, “There are no more streetcars. They were all taken off of the line.” I didn’t understand how that could be until she told me that they could also be used on buses. For a second I held out hope that The Transport Company had changed their mind and decided to keep streetcars, but there was no reprieve. Here are some samples of passes and timetables. Also, the early car check had the Public Service Building on the back side. 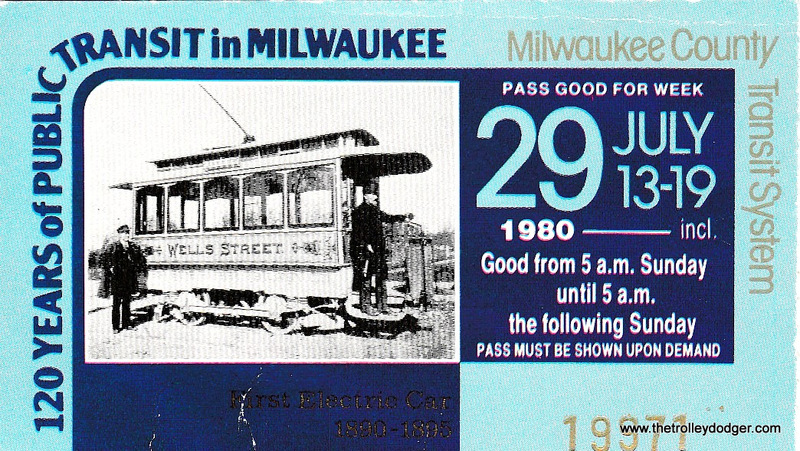 The two passes from the present-day MCTS era commemorate streetcar anniversaries which is why I included them. The type of “car check” I remember has also been scanned. My memory was playing tricks on me. The diamond logo was not on it. 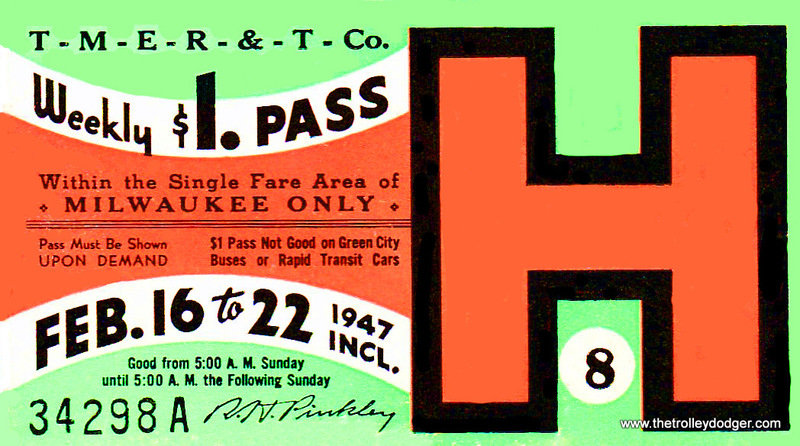 The reason it says “Good within the single fare area of Milwaukee only” is because Milwaukee had what were called zone fares. 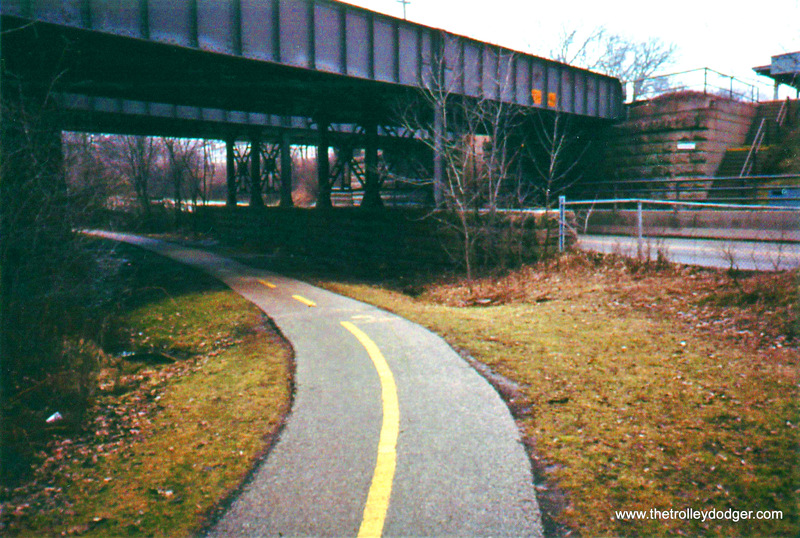 They could vary from as few as one zone to as many as four on the South Milwaukee-Cudahy line. Each zone was an additional five cents in fare. In the ’60s I used to love to ride the Route 80 bus to Mitchell Field and watch planes. Mitchell Airport was two zones, so you had to drop ten cents in the fare box when you got on or off there. You’ll see a couple of weekly passes with coupons attached. The coupon, which raised the cost of the pass, entitled you to ride into as many zones as was indicated on the coupon without having to pay an extra cash fare. 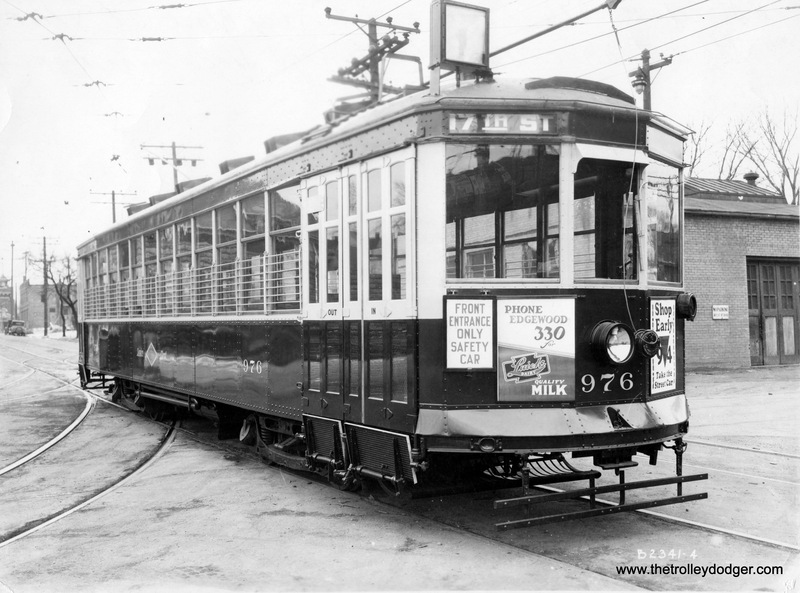 A TMER&L streetcar transfer (front). 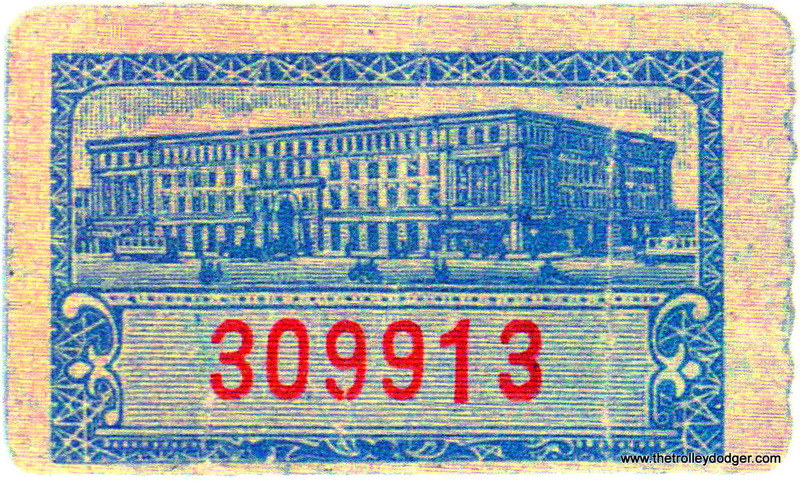 A TMER&L streetcar transfer (back). One of the very first TM weekly passes. An early TM car check (front). 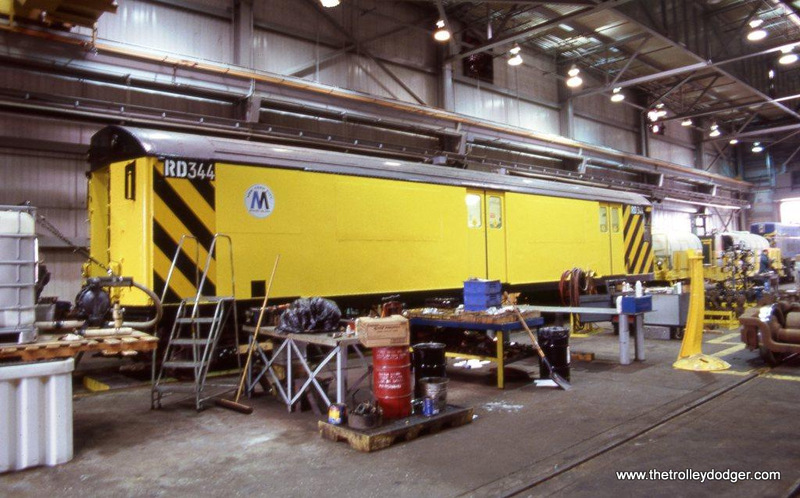 An early TM car check (back). 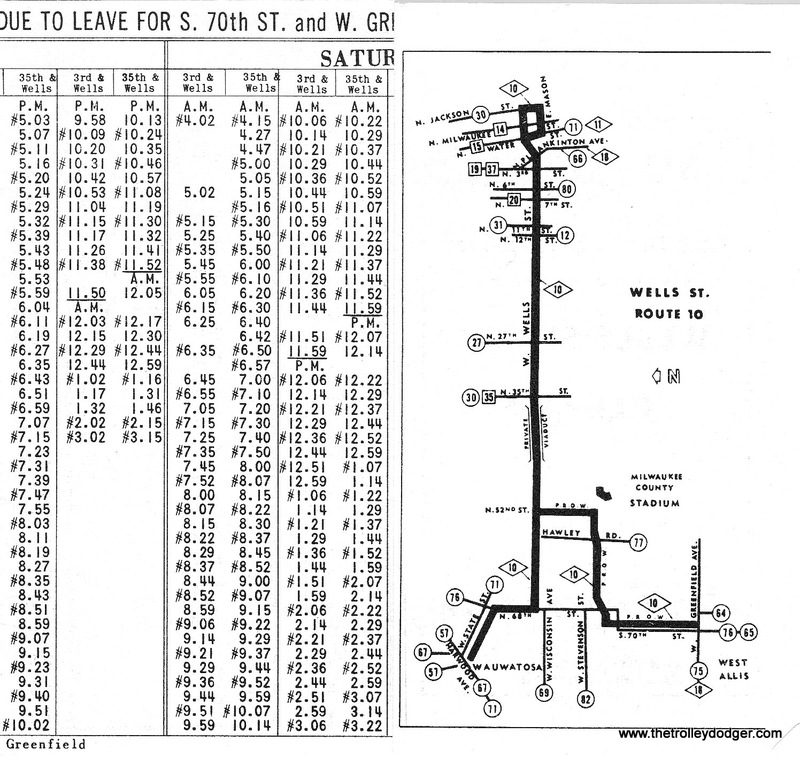 The Route 10 timetable for May 29, 1955. 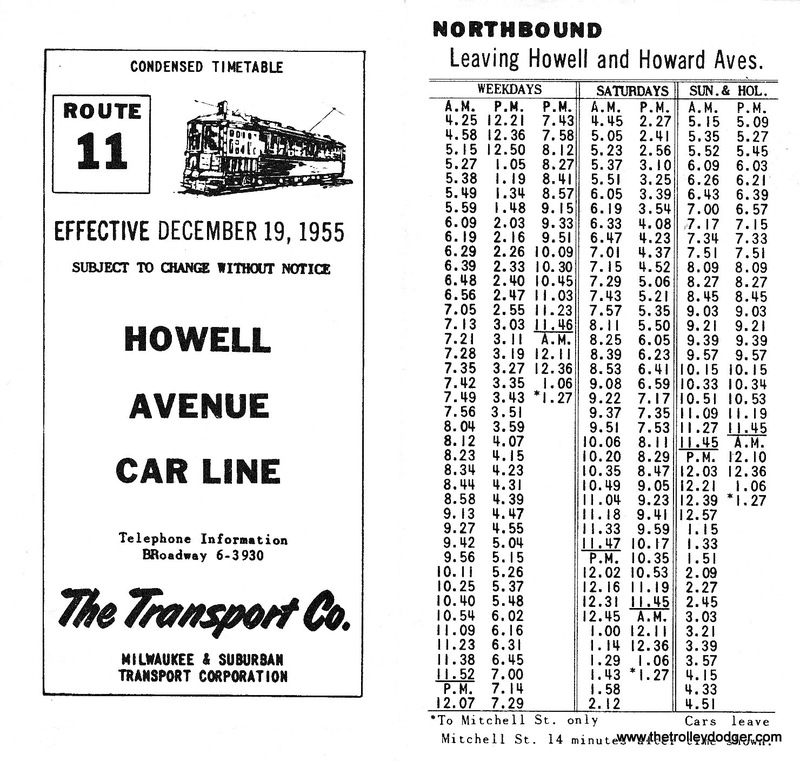 The Route 11 timetable for December 19, 1955. An M&STC car check (back). An M&STC car check (front). 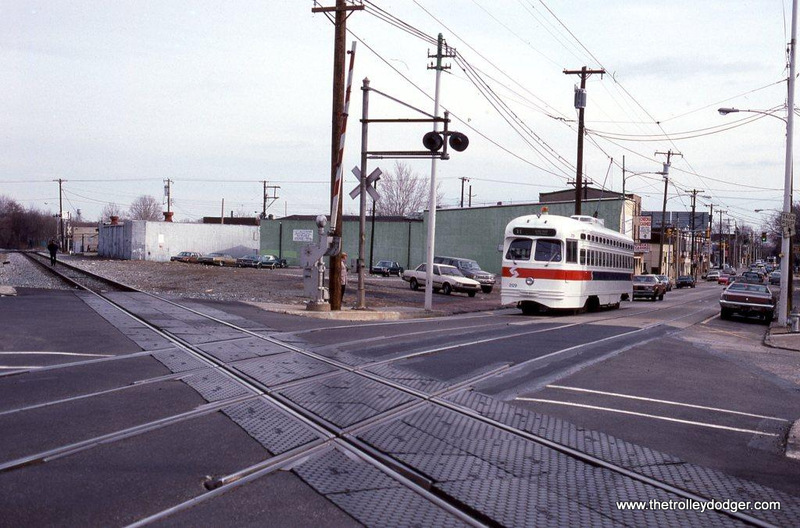 After 1958, the next time I saw a Milwaukee streetcar was when 978 (saved by Al Buetschle) was on the temporary storage track net to General Lumber Company on Milwaukee’s northwest side. That was where Al and a friend of his worked on repainting and doing work on the interior of the car. The Milwaukee Journal ran a photo of Al and his friend working inside the car and that is how my grandparents found out it was there. His friend’s son was sitting in the motorman’s seat which brought back memories of the times I did the same. 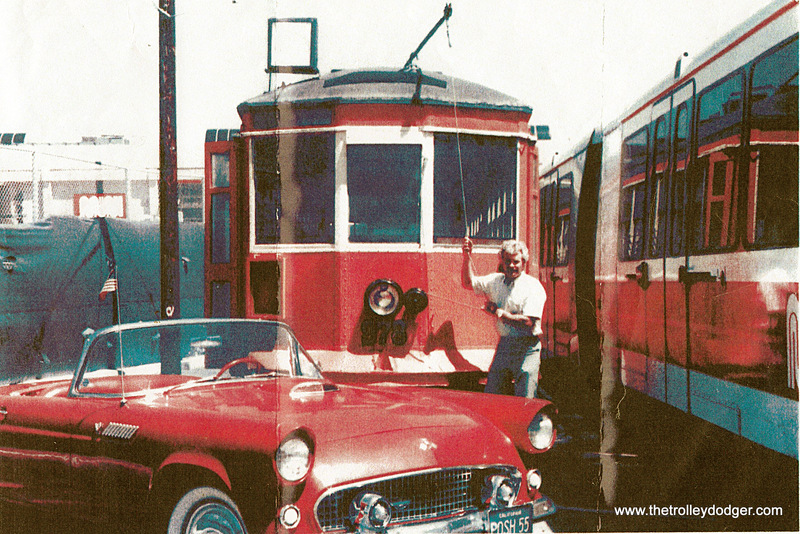 In 1983 Al and his streetcar were reunited, when 978 was sent to San Francisco for the first historic streetcar festival. He had someone snap a picture of him putting up the trolley pole. I have this copy of it. The classic “T-Bird” convertible was Al’s. It was wrecked when he was hit by some teenagers out for a joy ride. Of course they were uninsured! The T-Bird was damaged beyond repair. Al B. posing with his T-Bird and TM 978 in SFO 1983. The Harwood Avenue Terminal Site on Route 10 today. 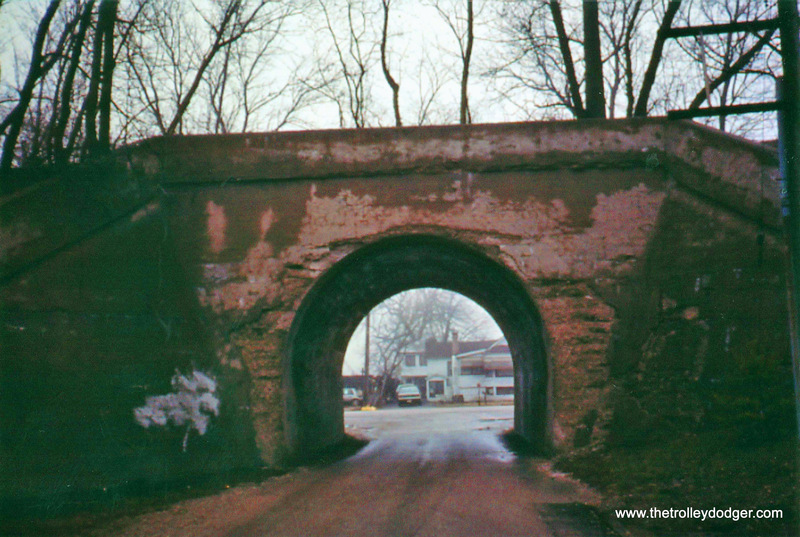 I took this photo at Des Plaines Ave. Forest Park on what was then the West-Northwest Rapid Transit line probably in the summer of 1972. I was standing on the blacktopped walkway to the parking lot and crouched down to get a view looking up at what was then one of the relatively new 2200 series cars. 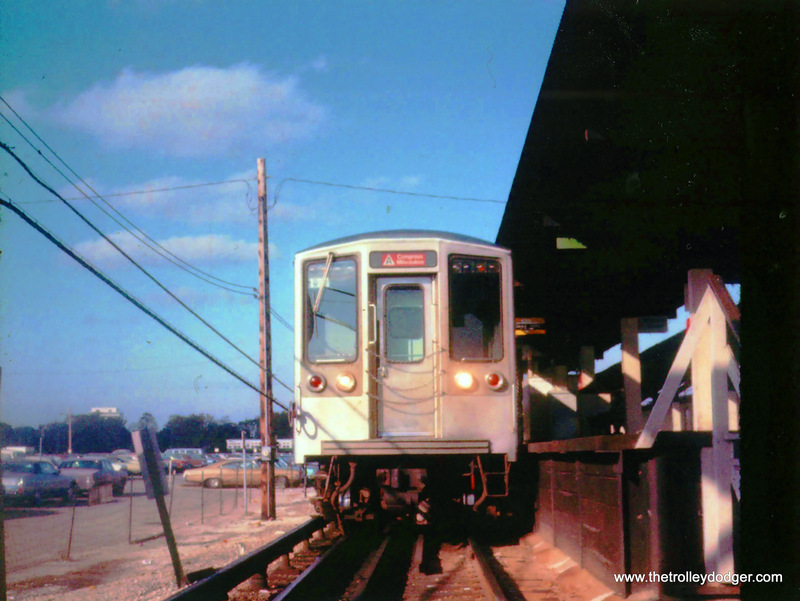 CTA 4000s in Linden Avenue yard ca. 1972. Tunnel beneath abandoned NSL r.o.w. at Rondout, Illinois, showing date built (1904). Taken 1992. Tunnel beneath abandoned NSL r.o.w. 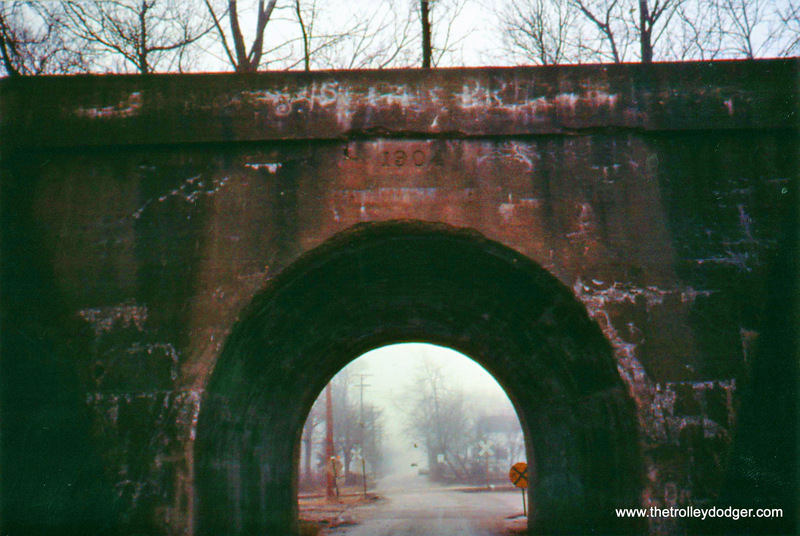 at Rondout, Illinois, 1992. Abandoned NSL Mundelein Branch r.o.w. at Lake Bluff in`1992. Abandoned NSL r.o.w. showing bracket for catenary on tower at right. Abandoned NSL r.o.w. crossing Gross Point Road. Abandoned NSL r.o.w. north of Dempster Street, Skokie. 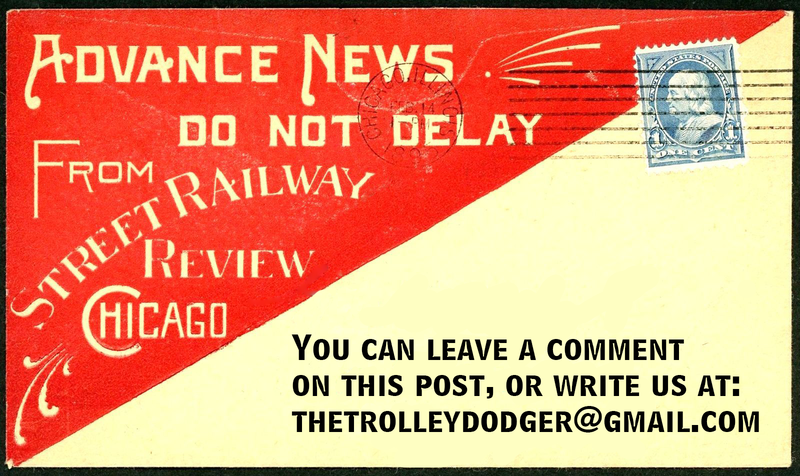 This is our 211th post, and we are gradually creating a body of work and an online resource for the benefit of all railfans, everywhere. To date, we have received over 400,000 page views, for which we are very grateful.